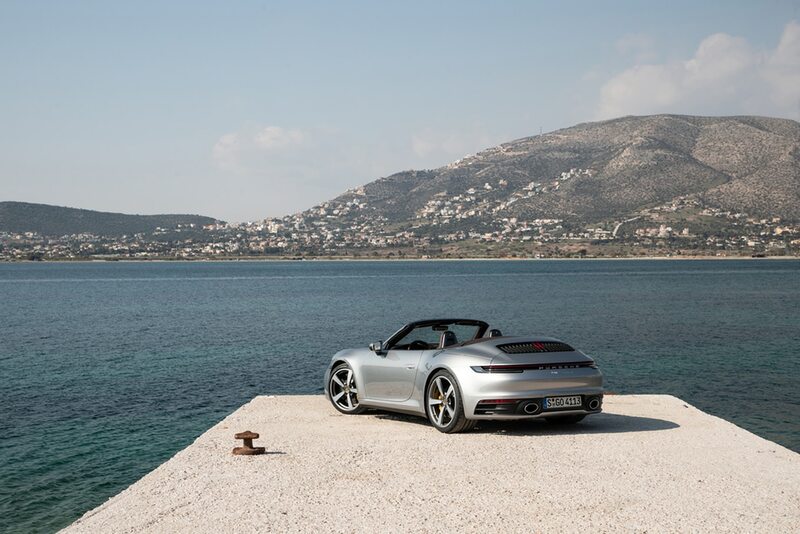 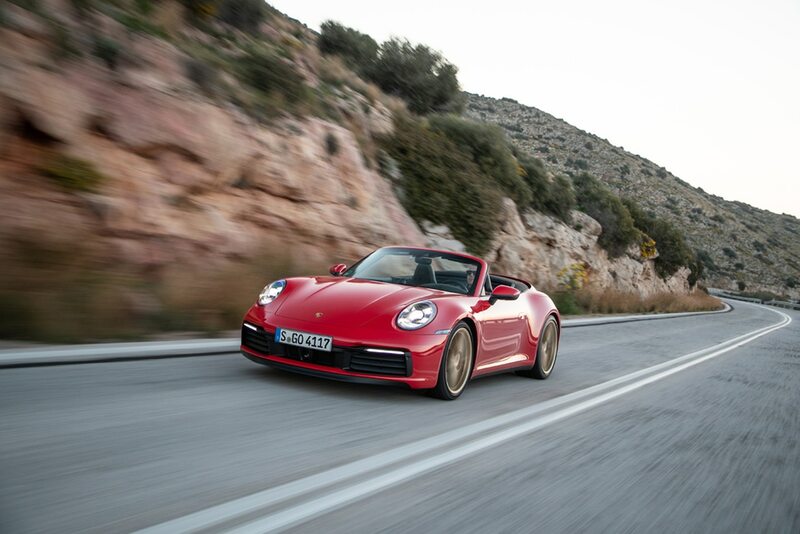 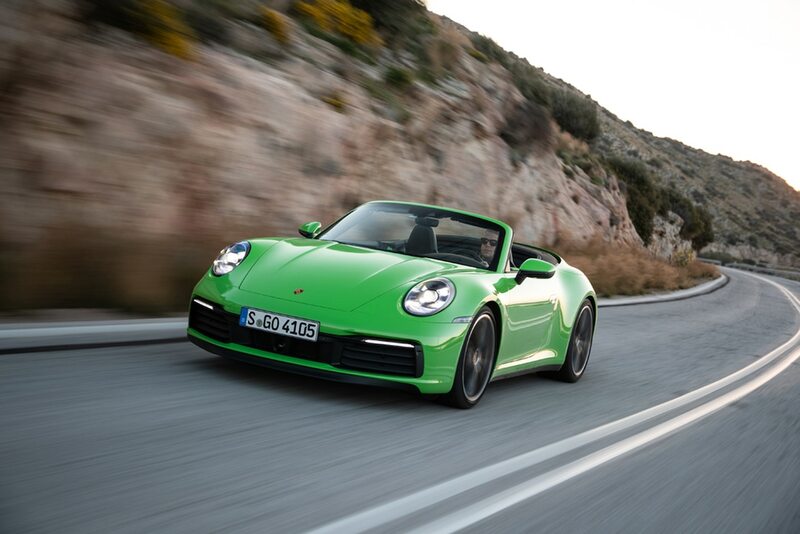 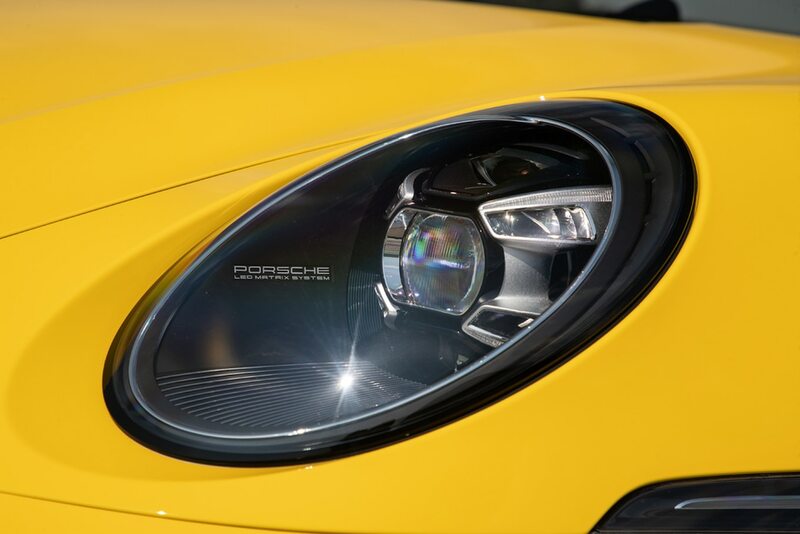 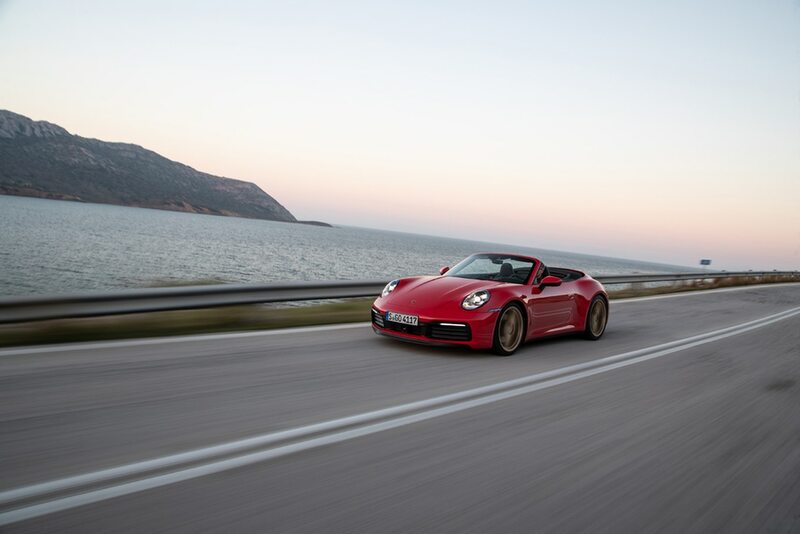 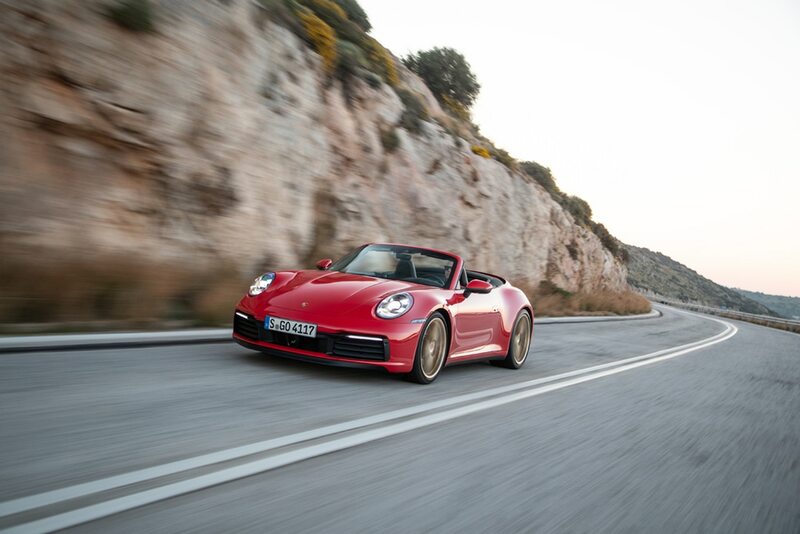 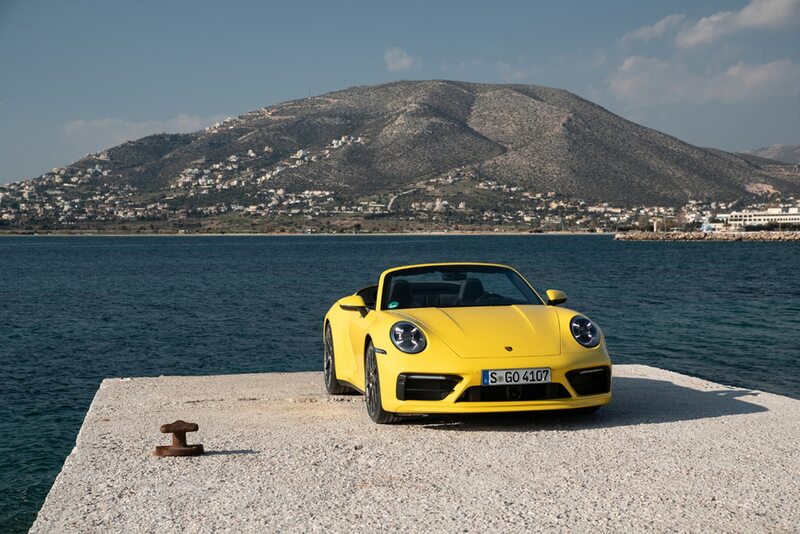 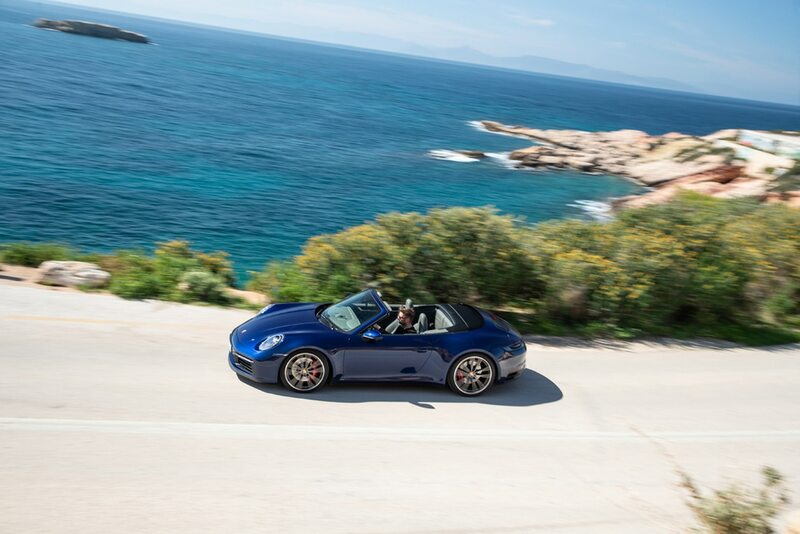 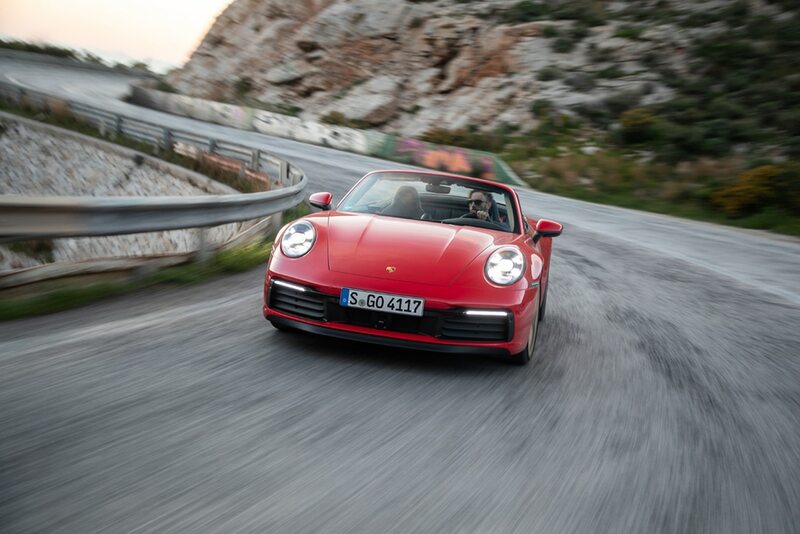 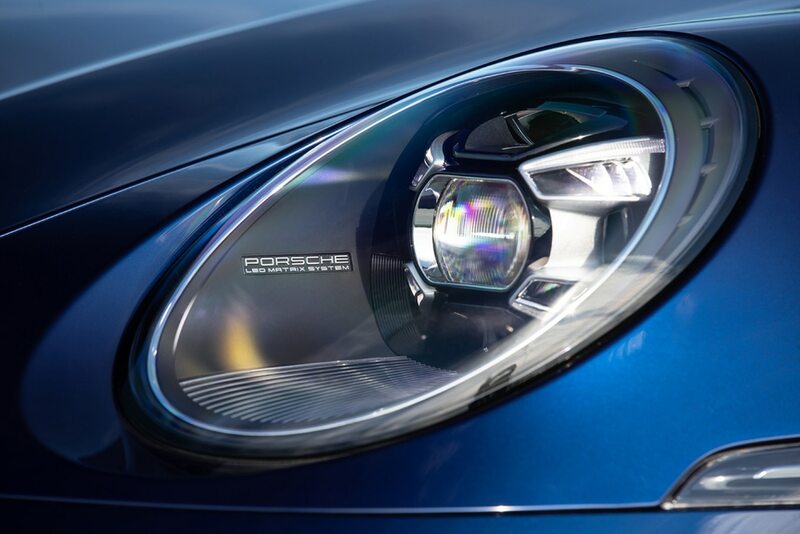 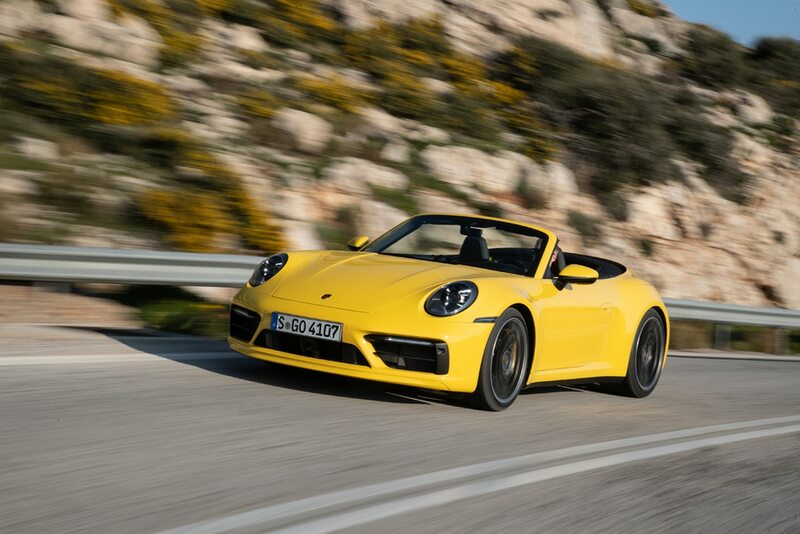 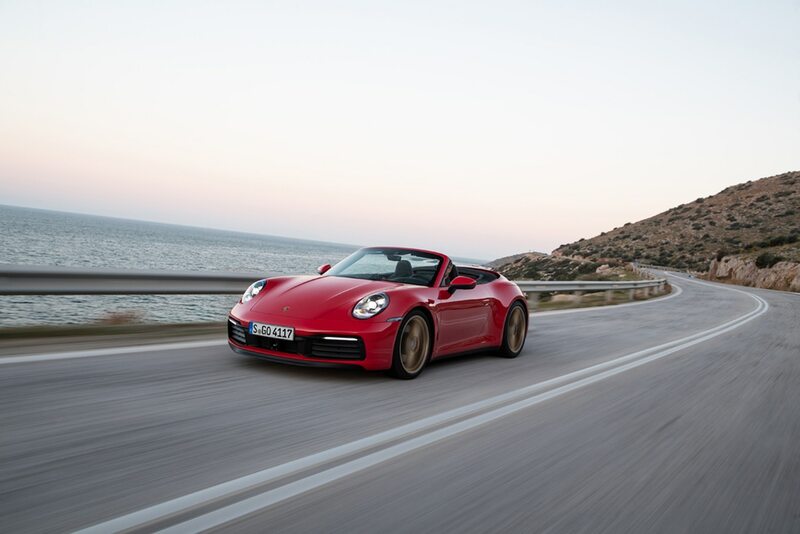 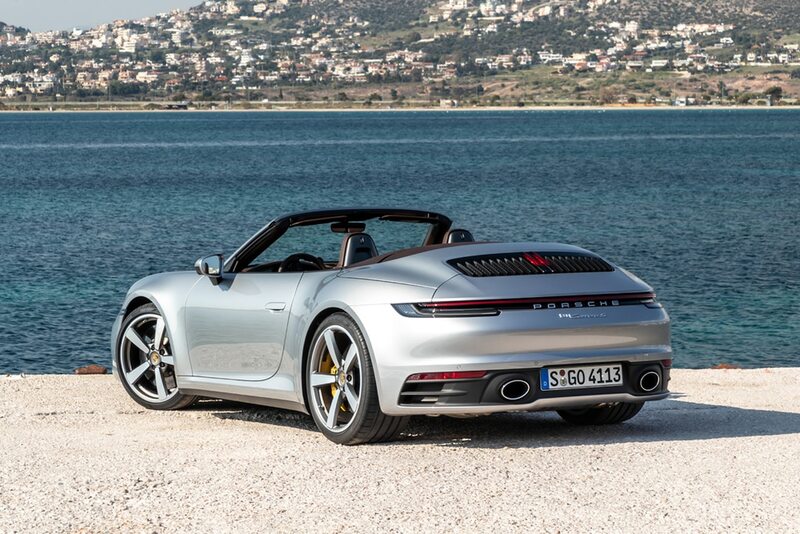 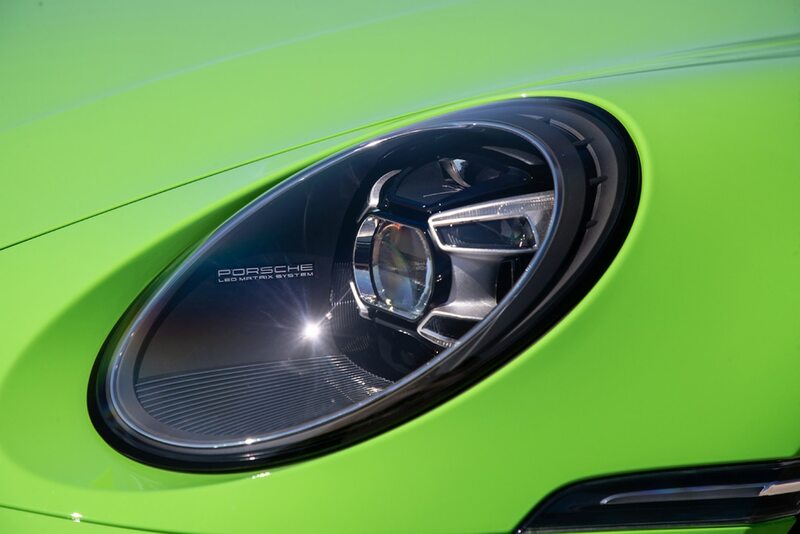 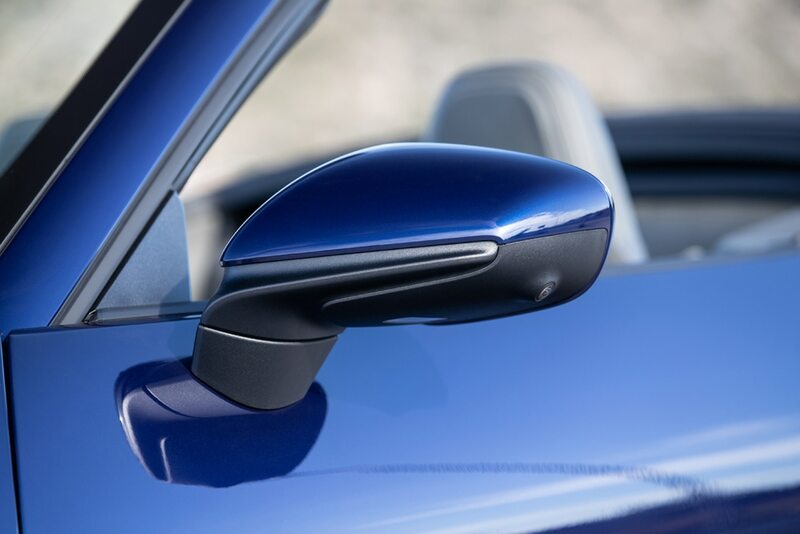 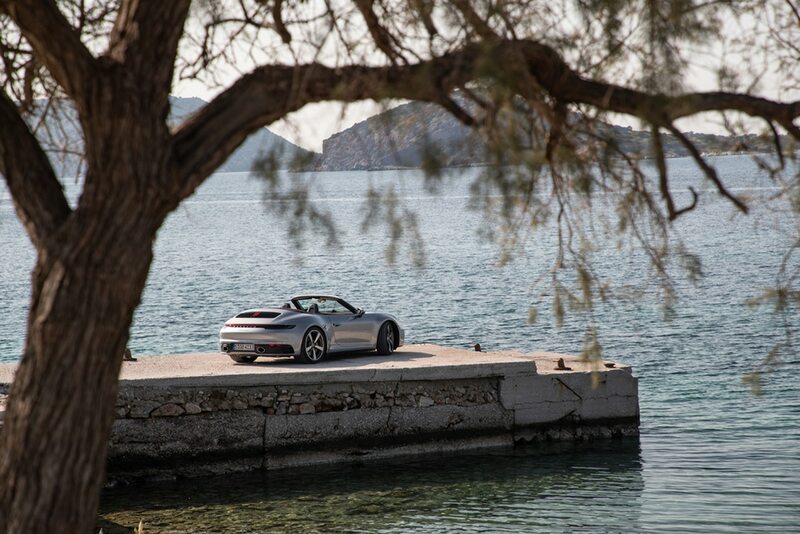 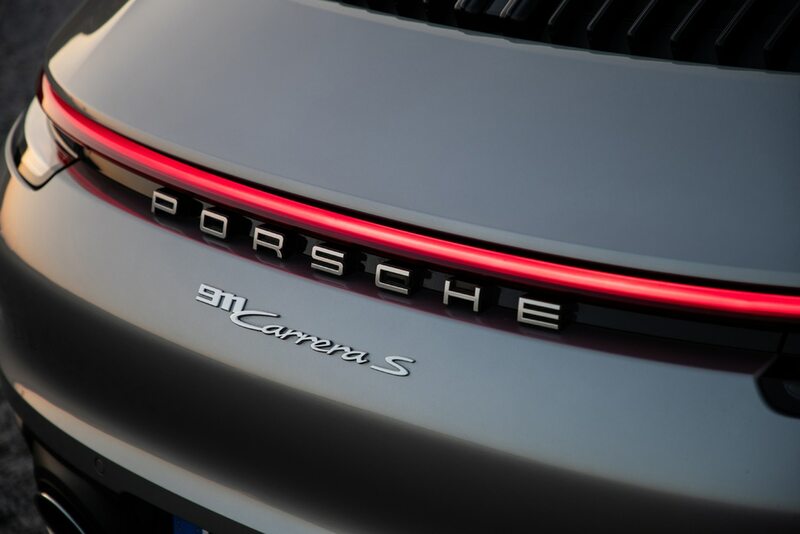 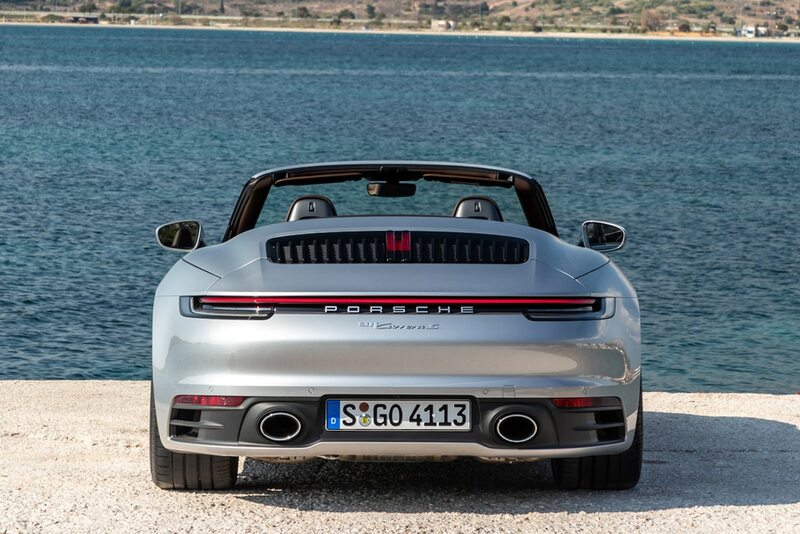 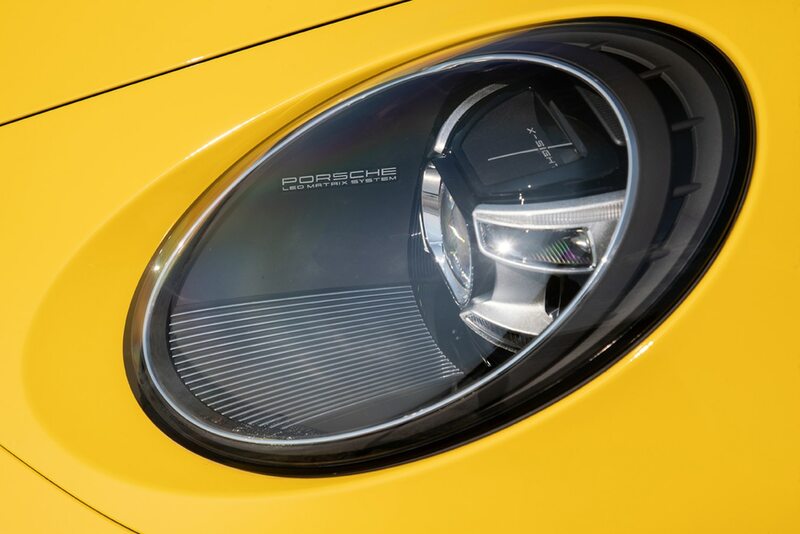 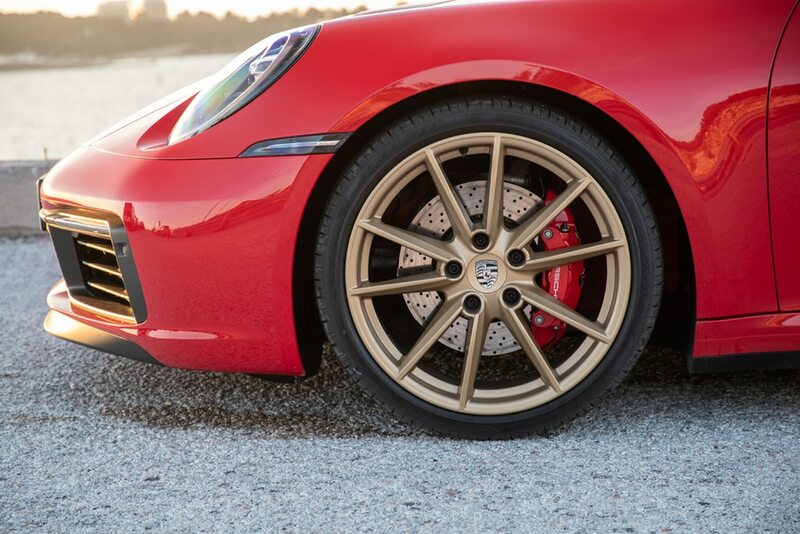 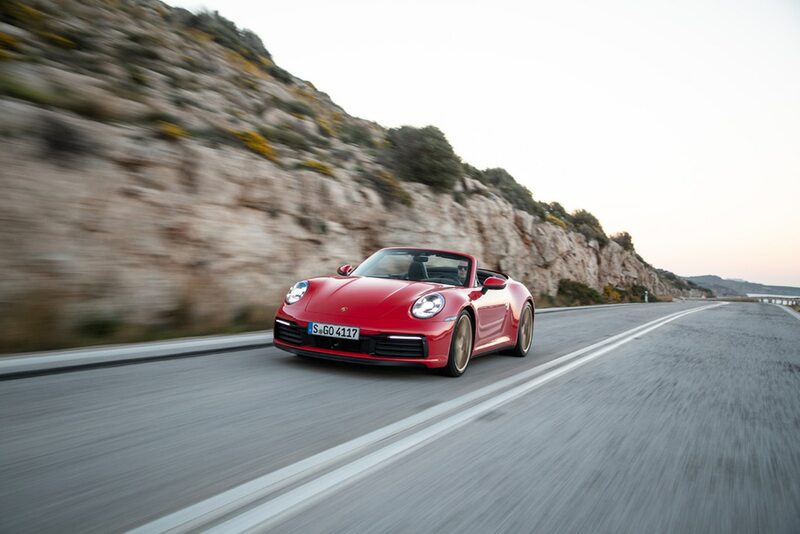 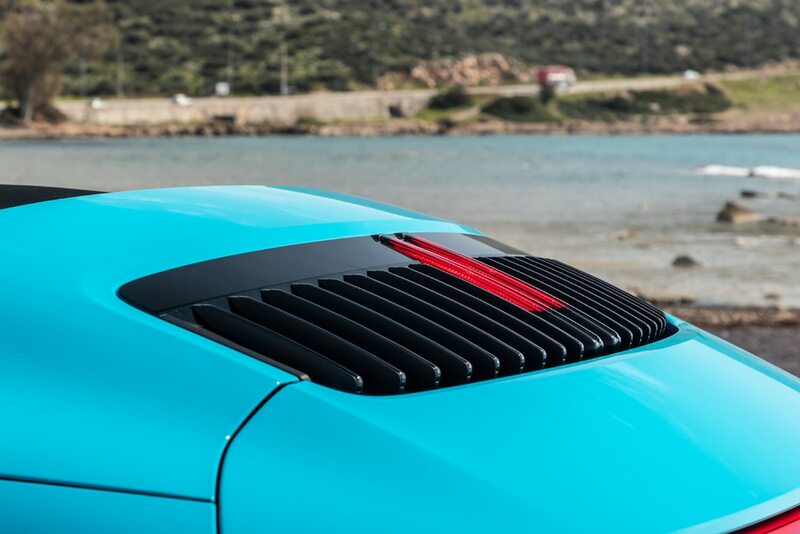 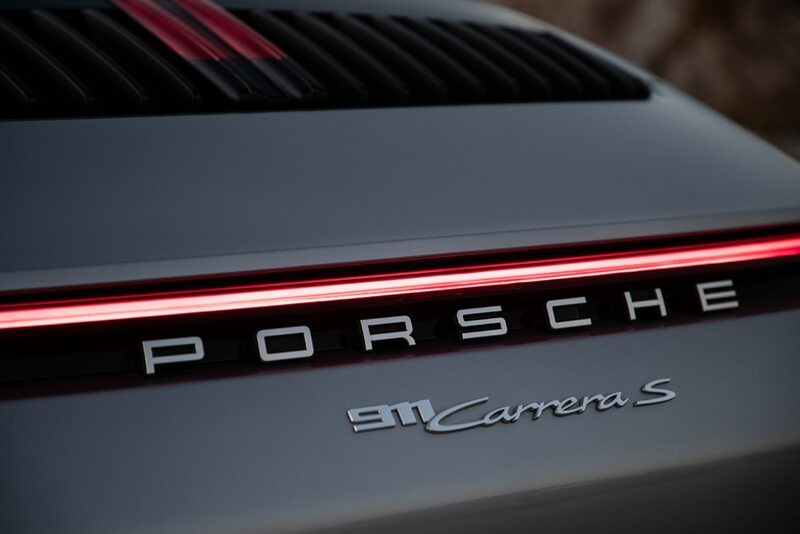 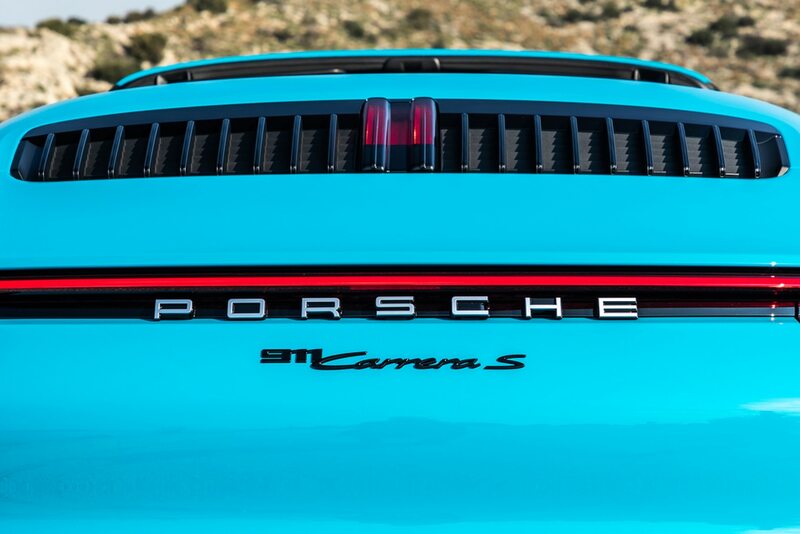 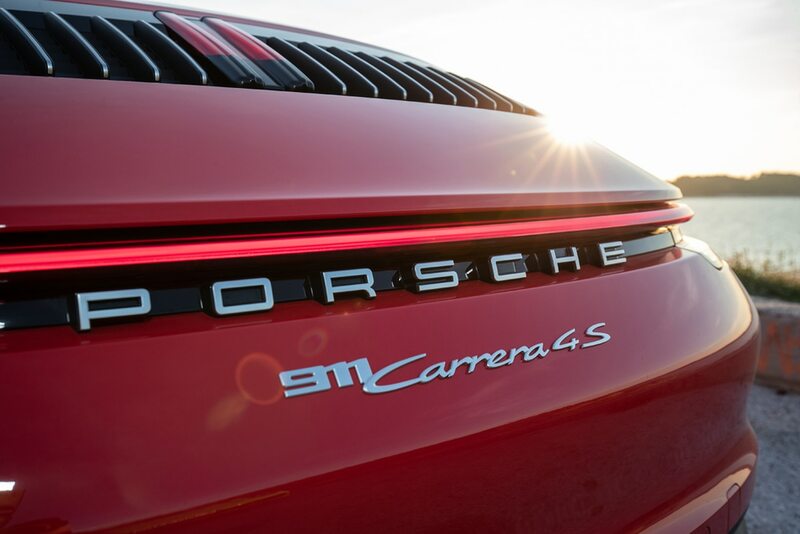 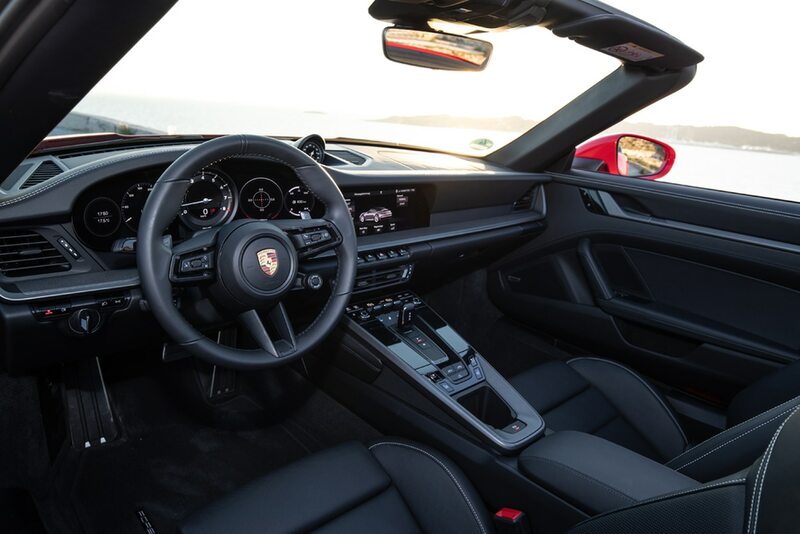 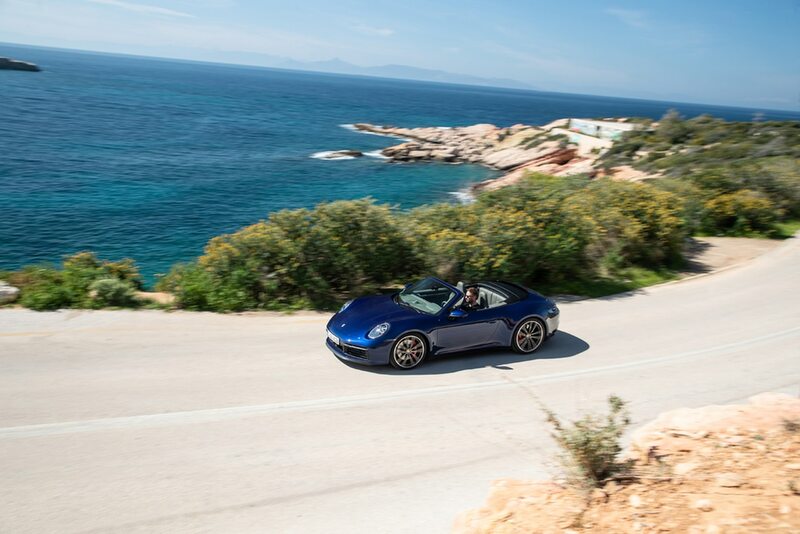 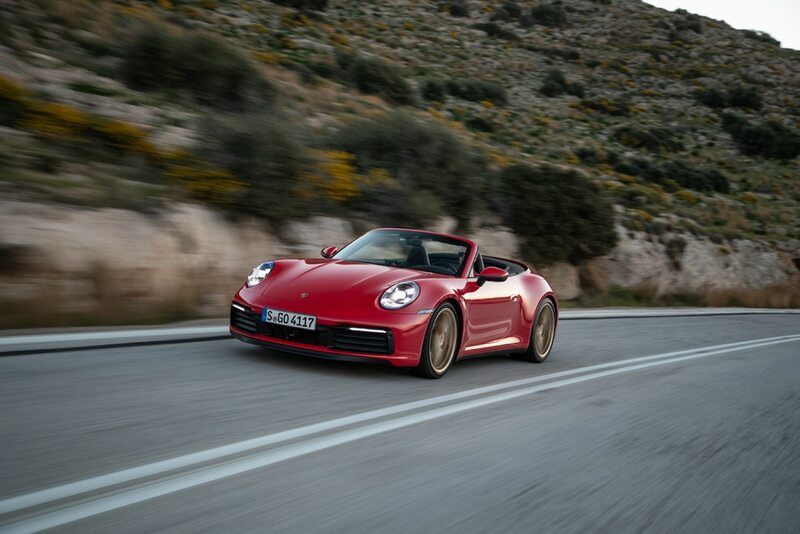 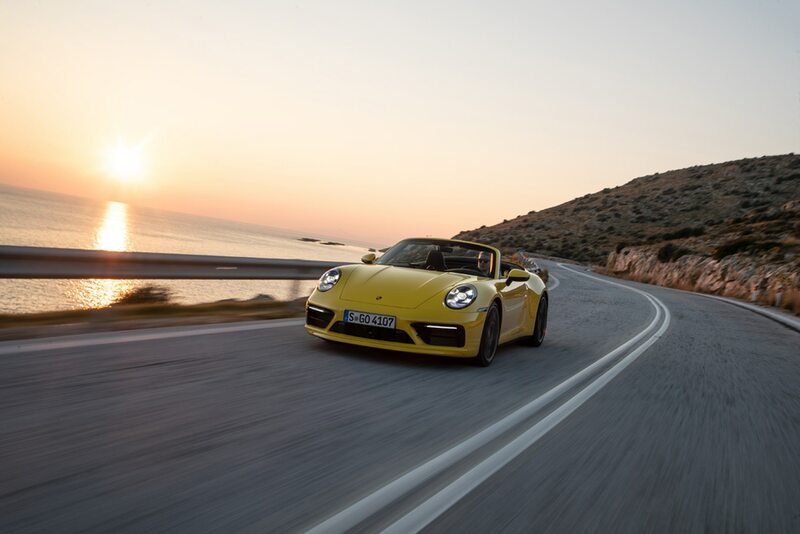 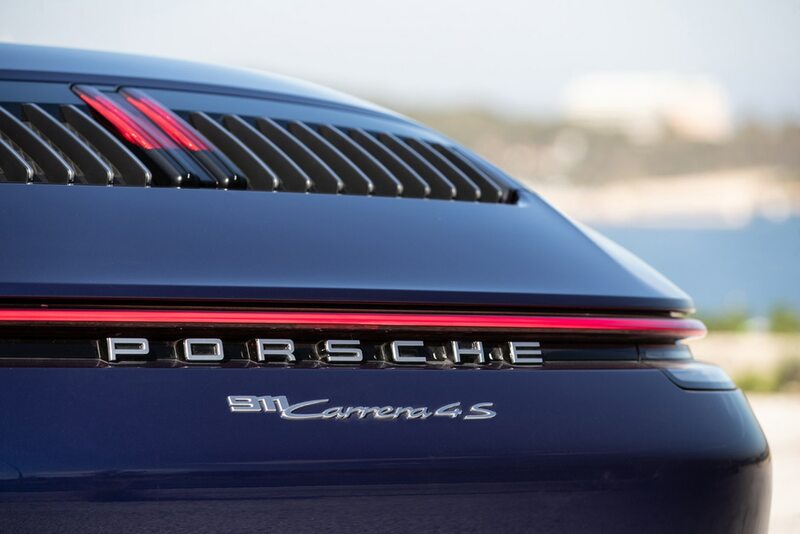 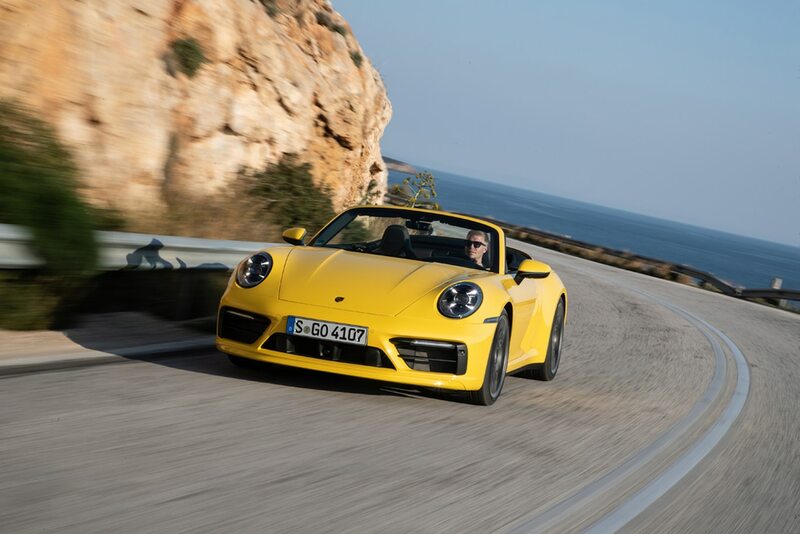 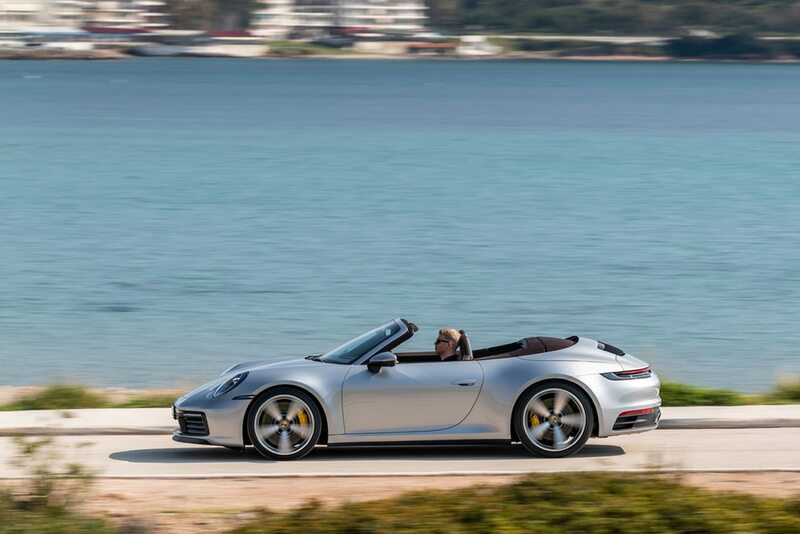 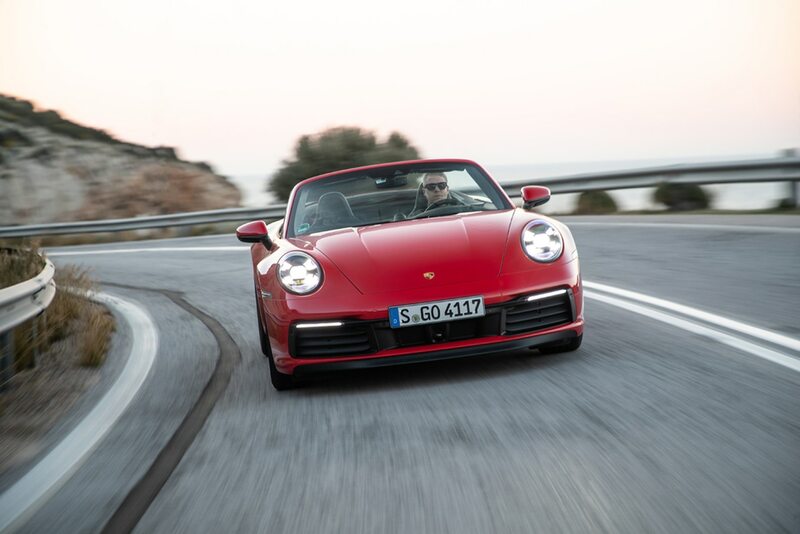 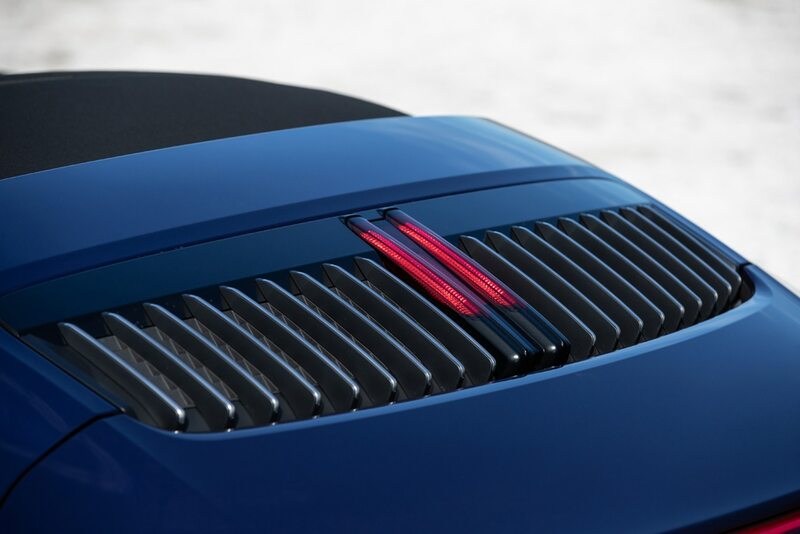 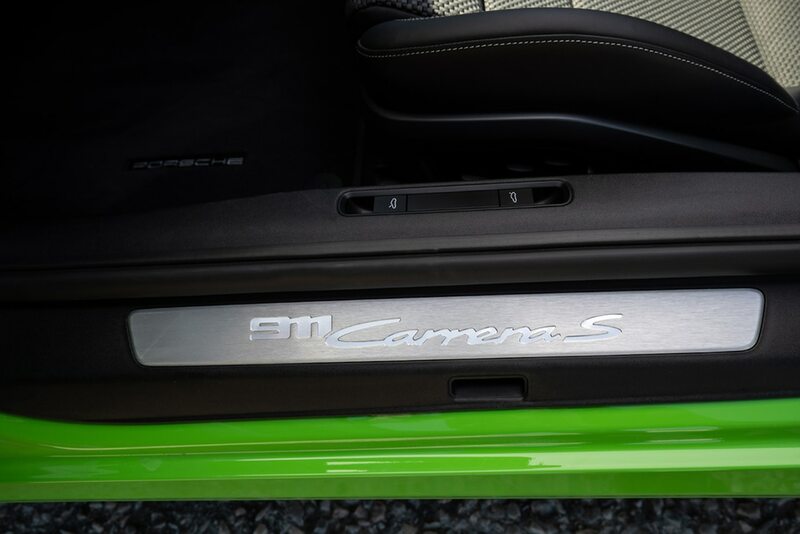 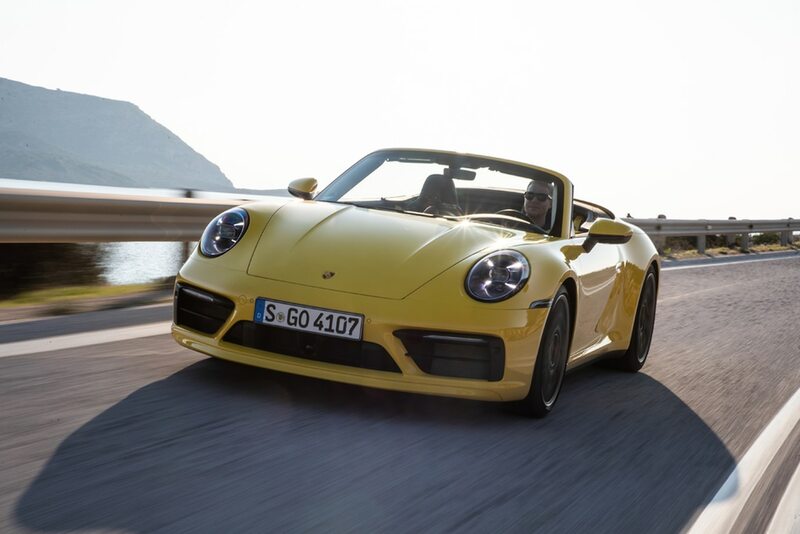 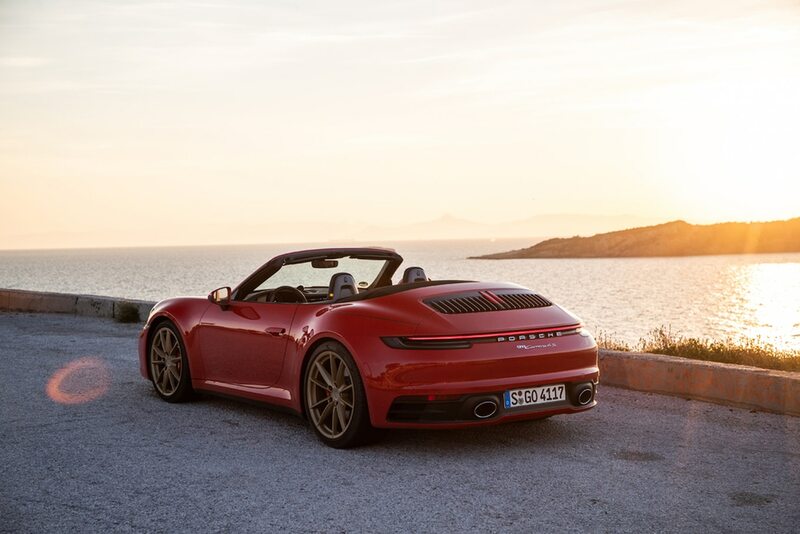 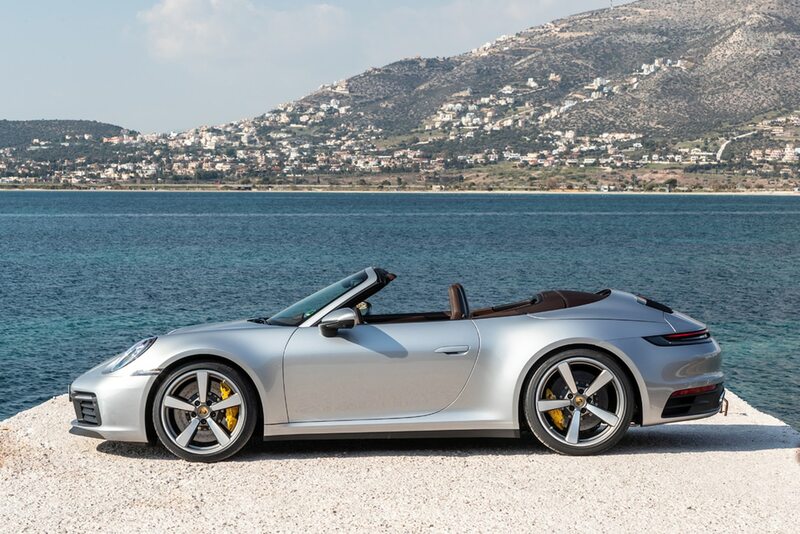 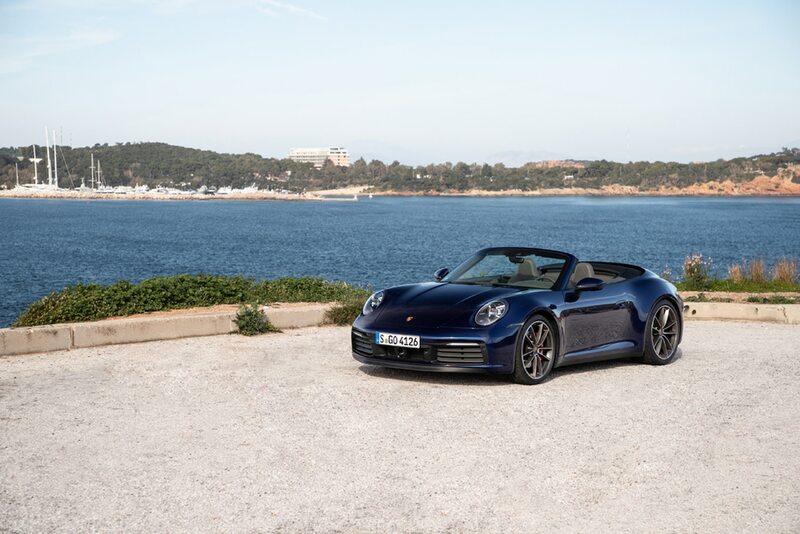 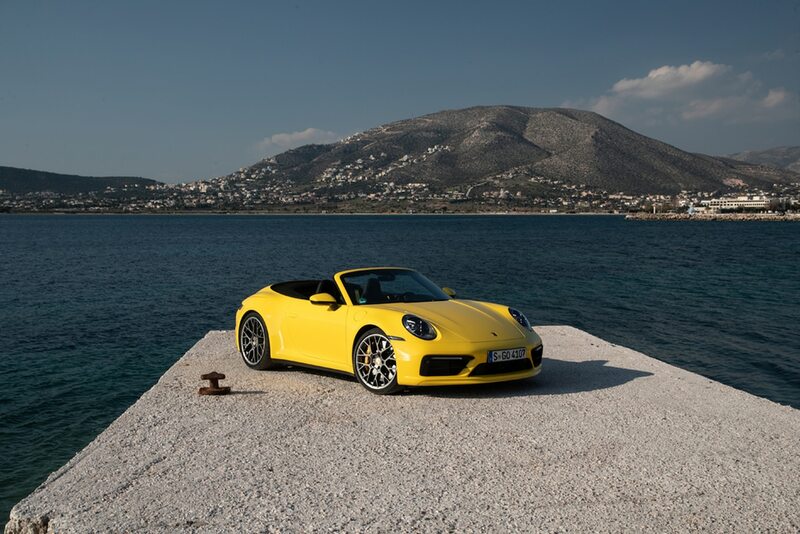 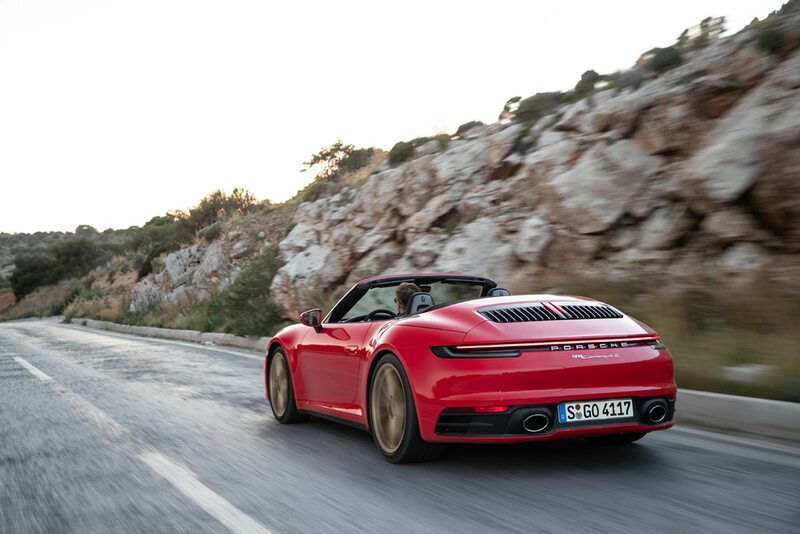 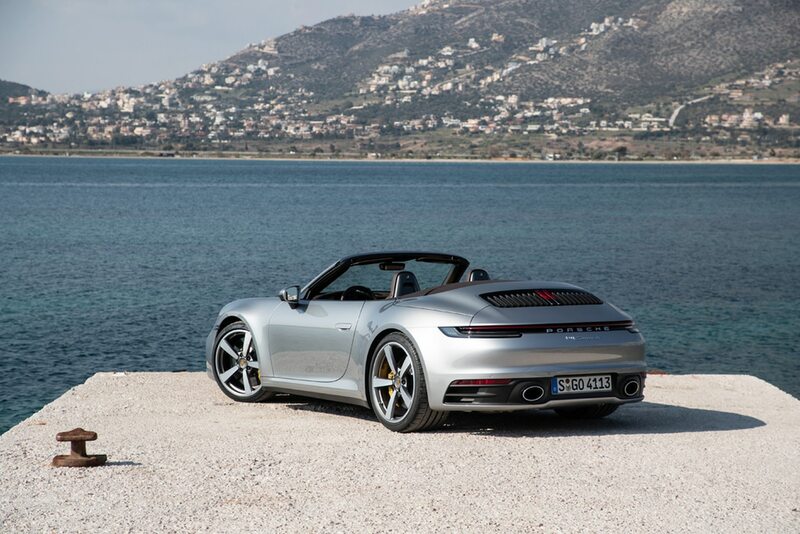 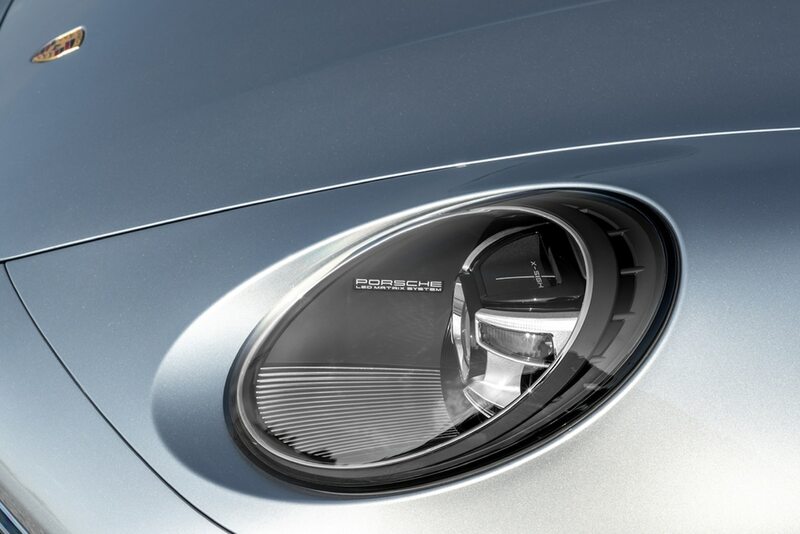 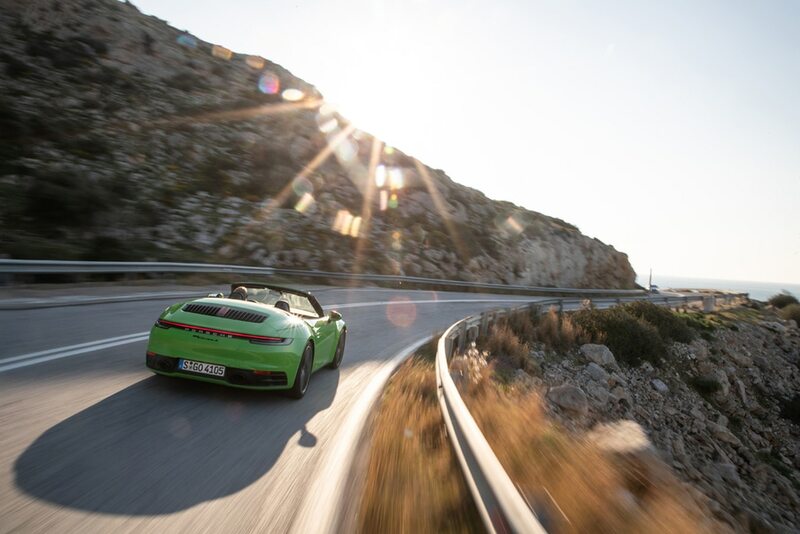 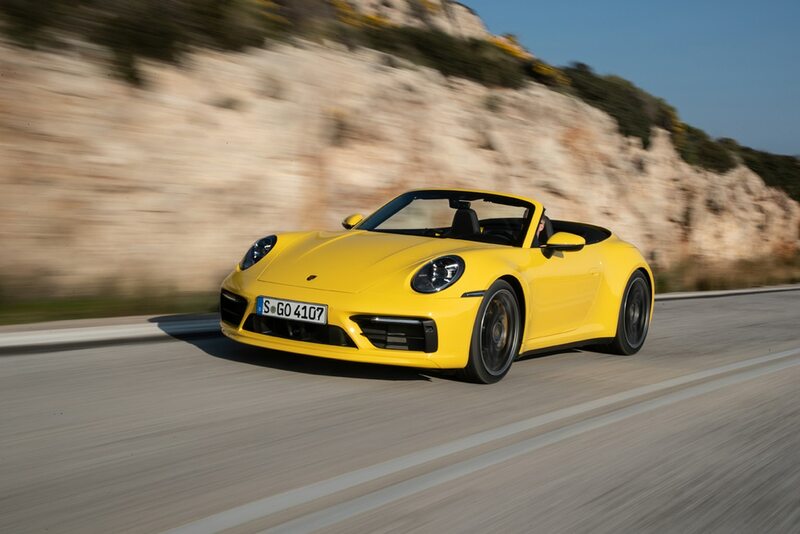 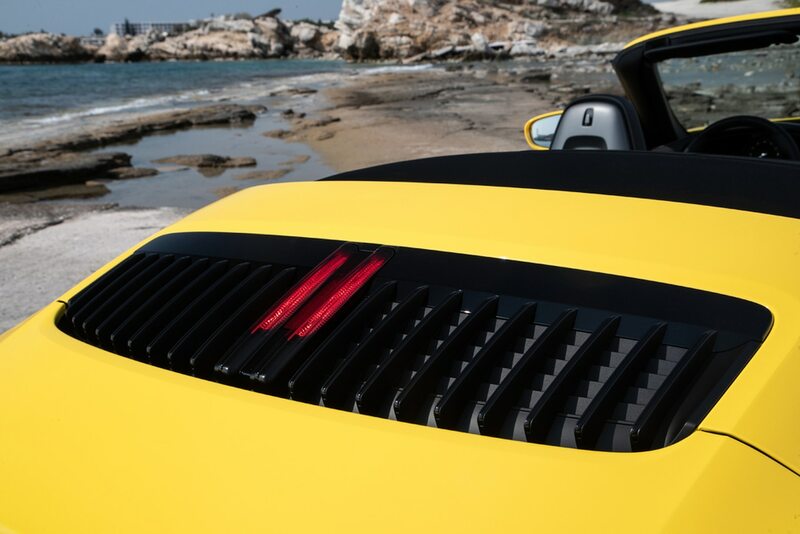 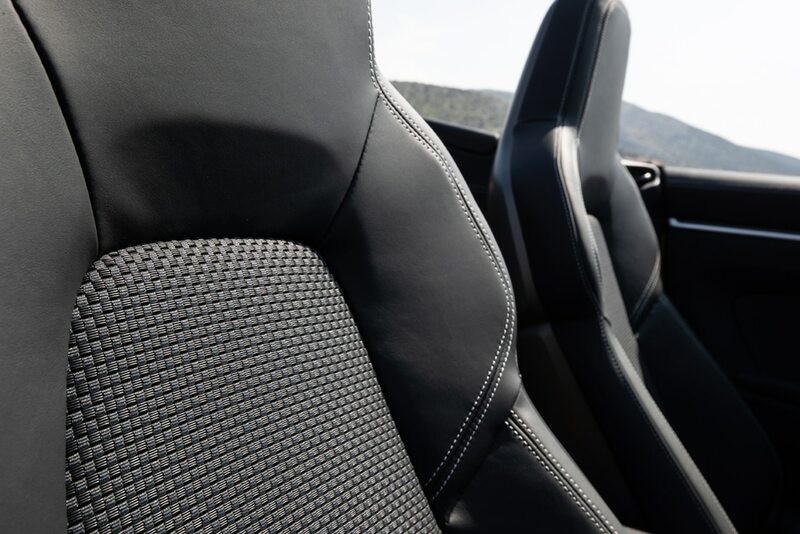 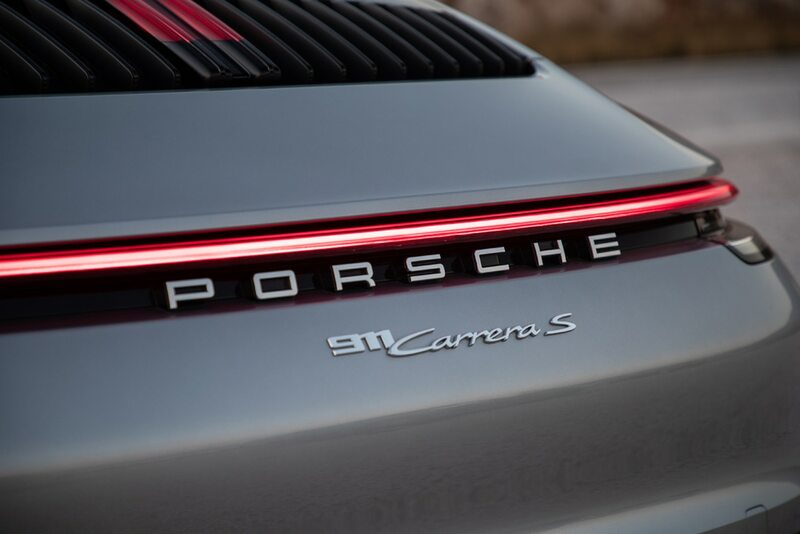 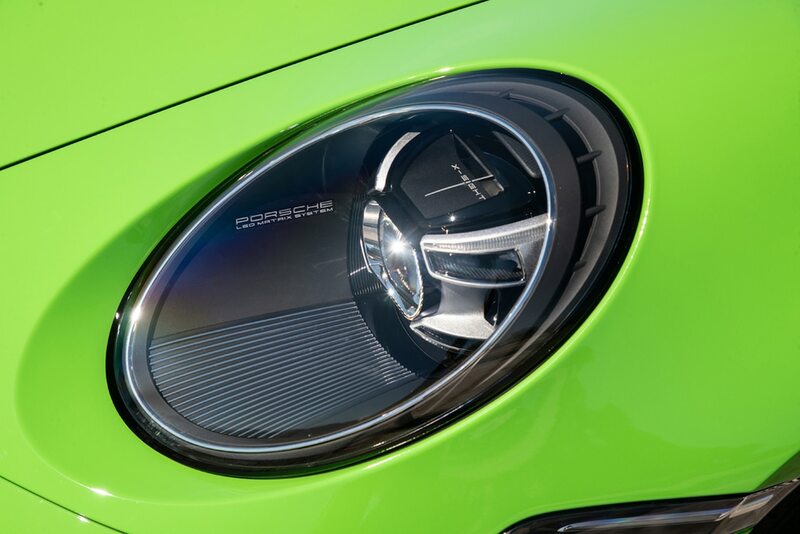 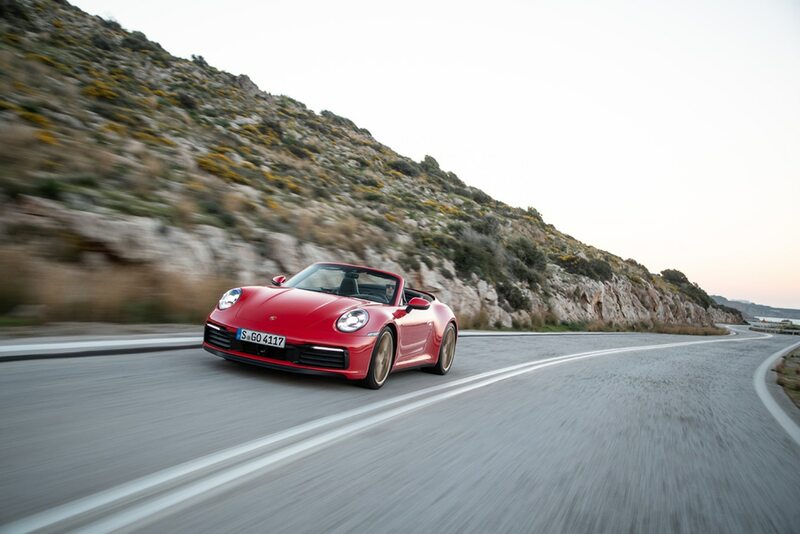 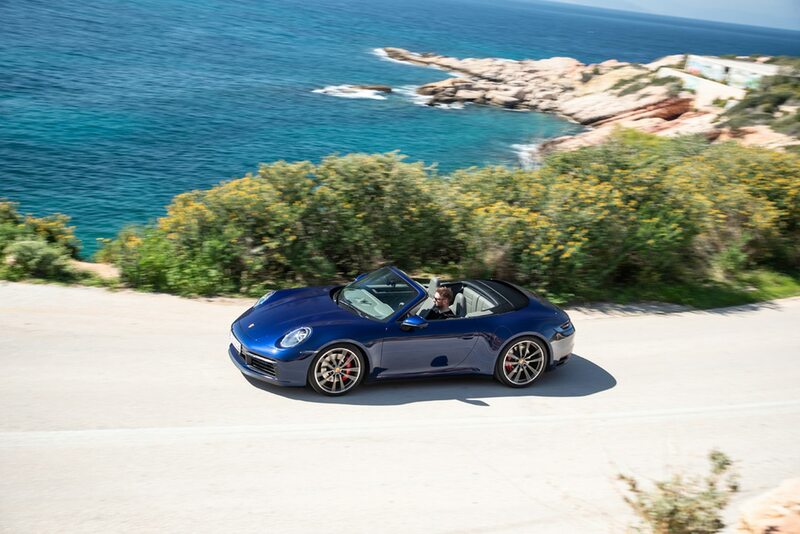 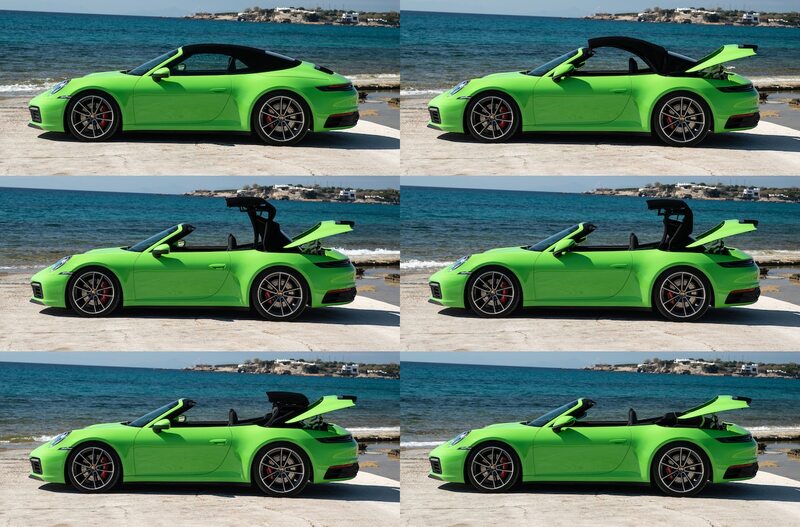 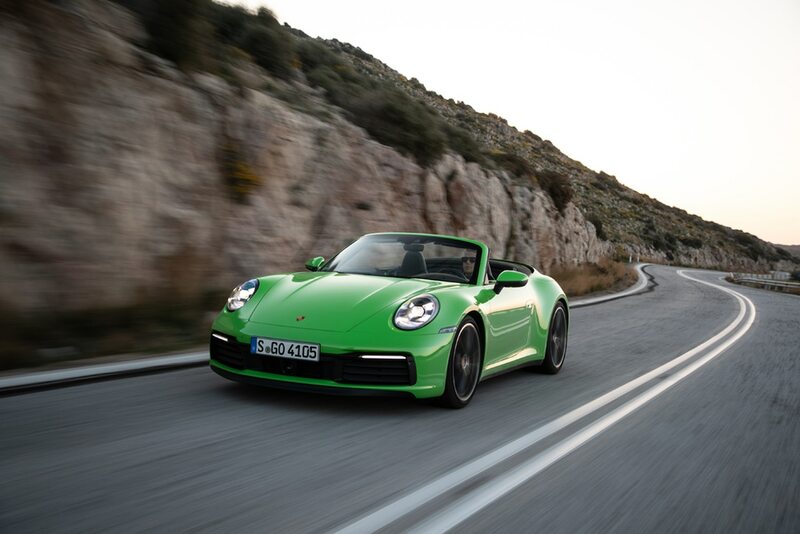 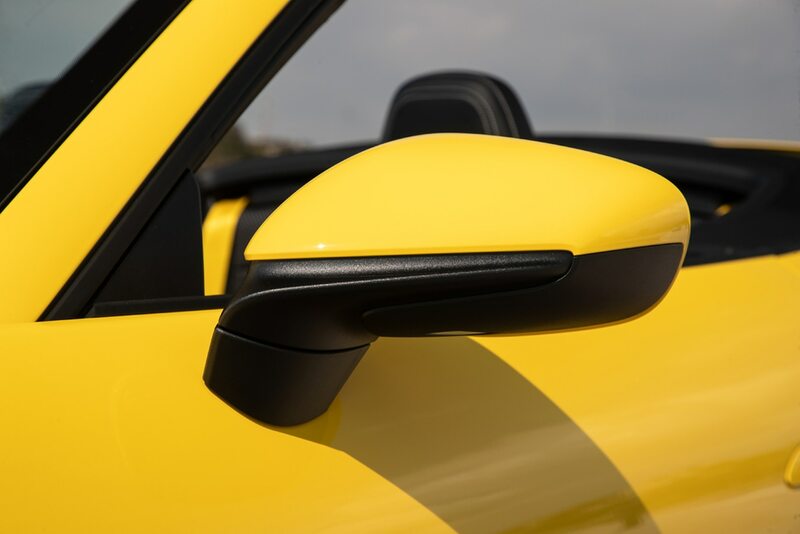 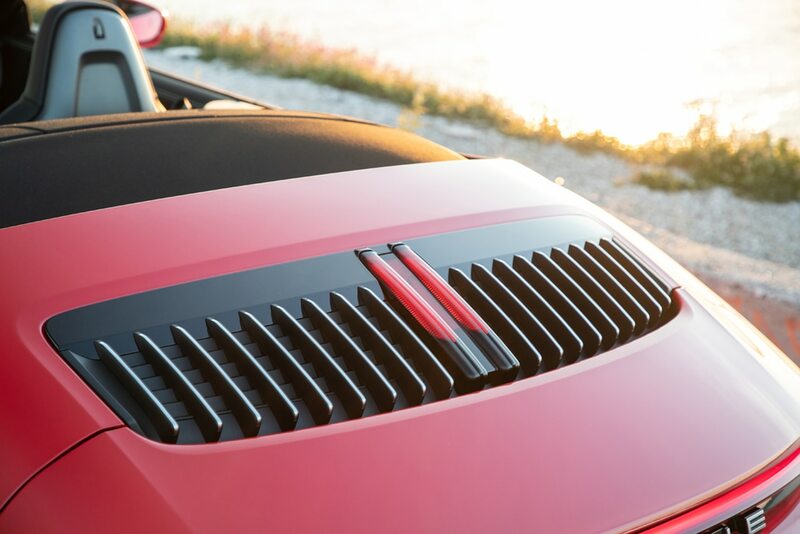 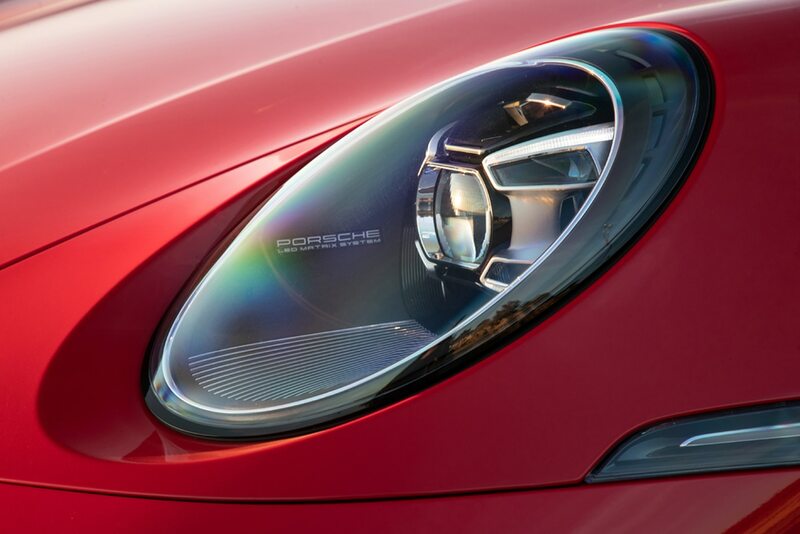 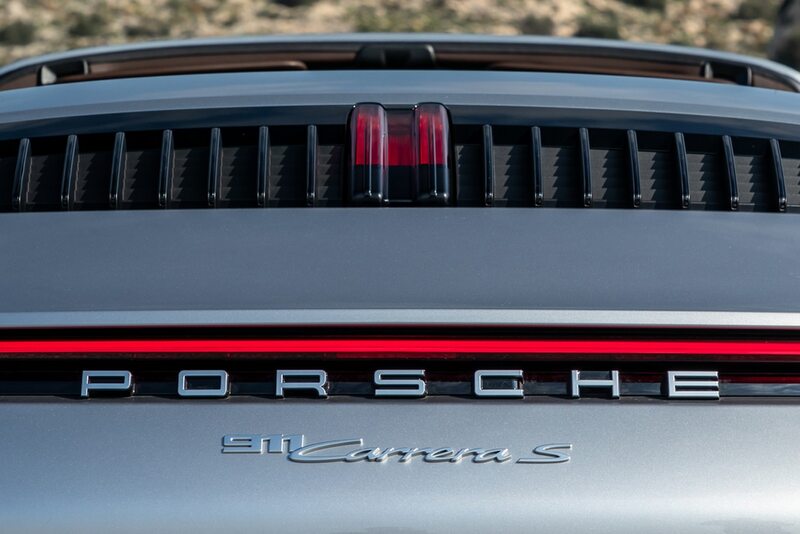 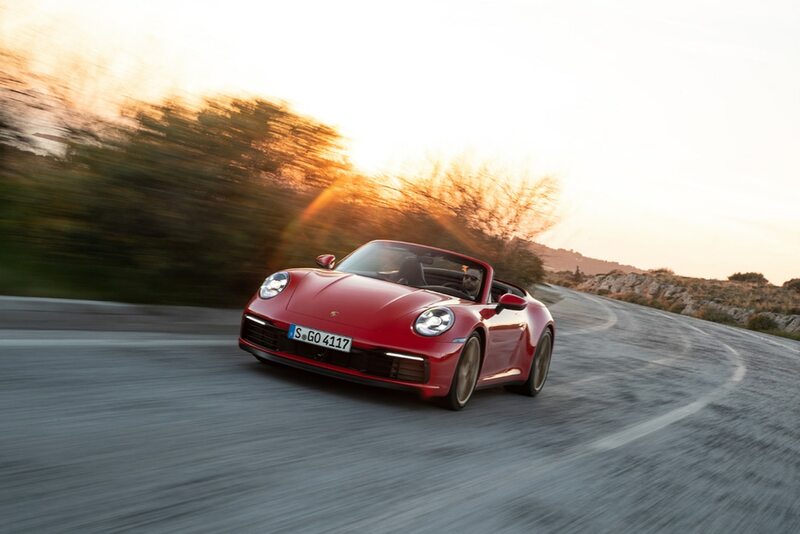 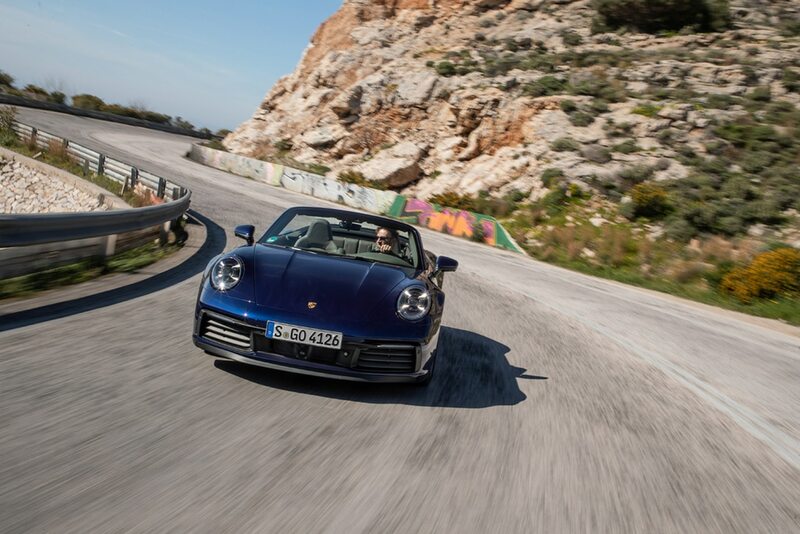 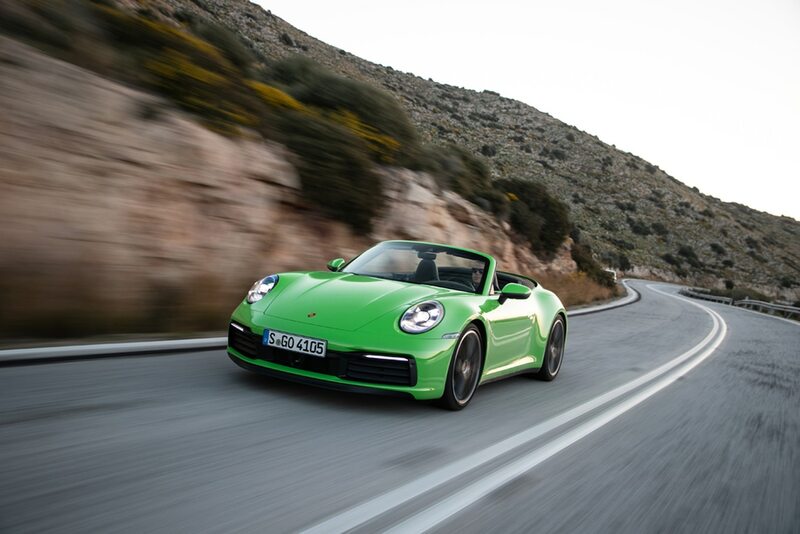 Let’s recap some of the highlights of the 911 Cabriolet that we laid out when the Cabrio was first teased in January. 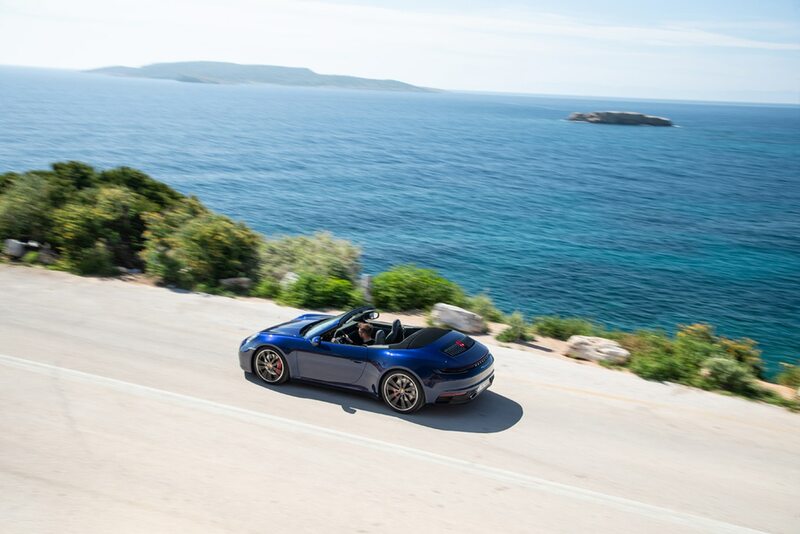 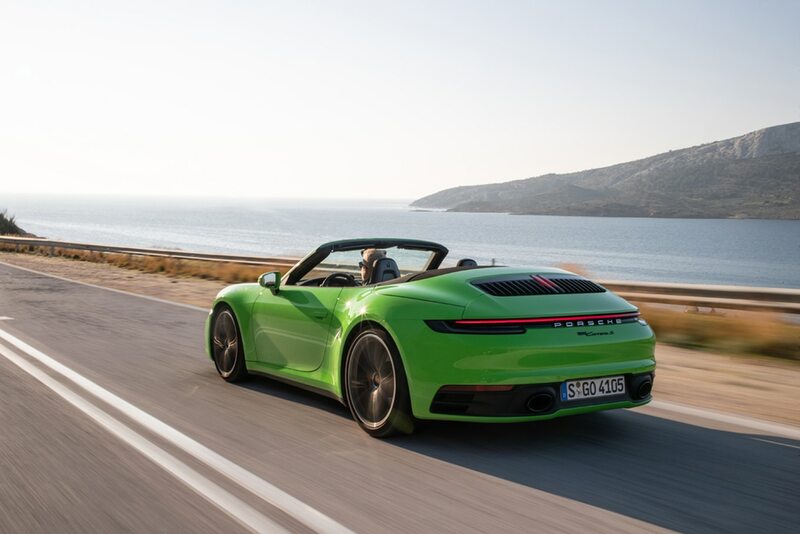 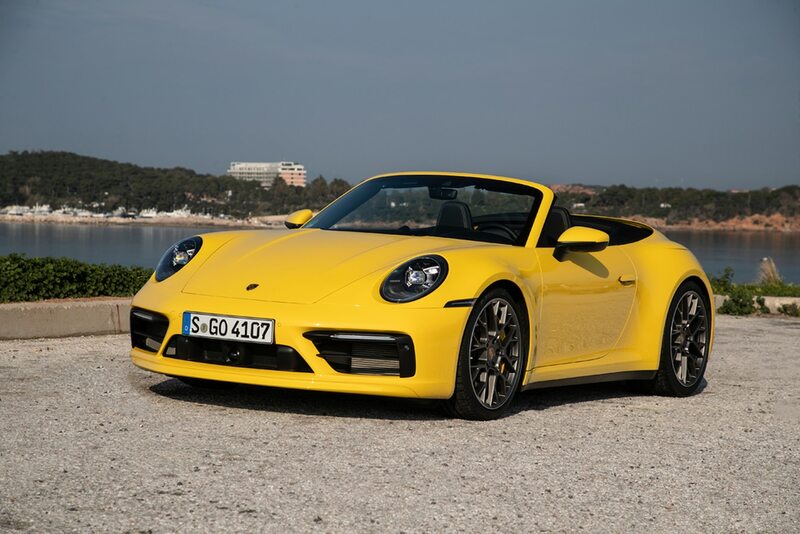 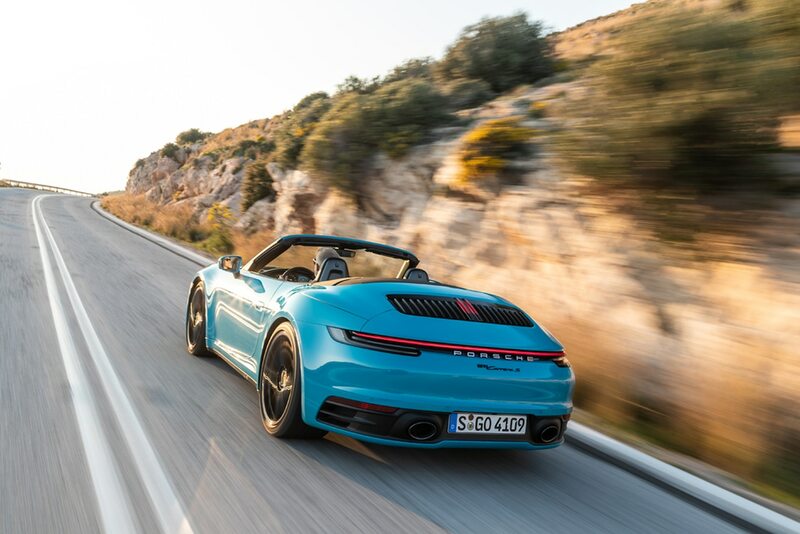 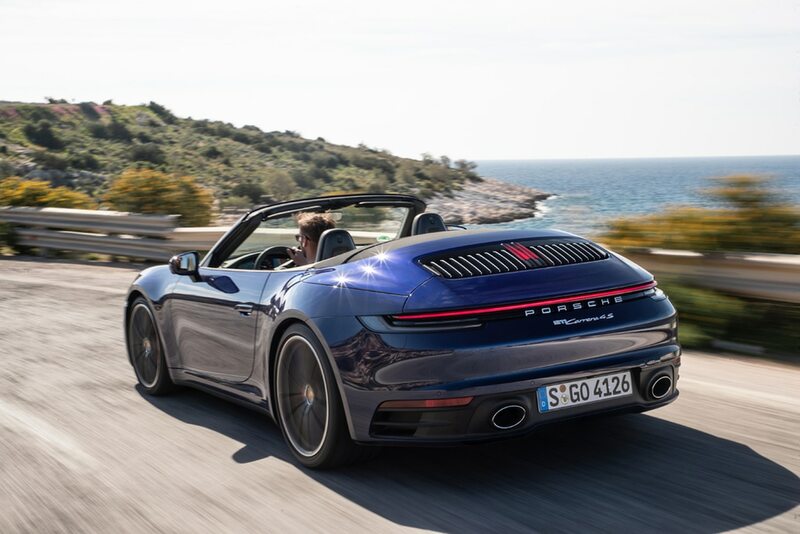 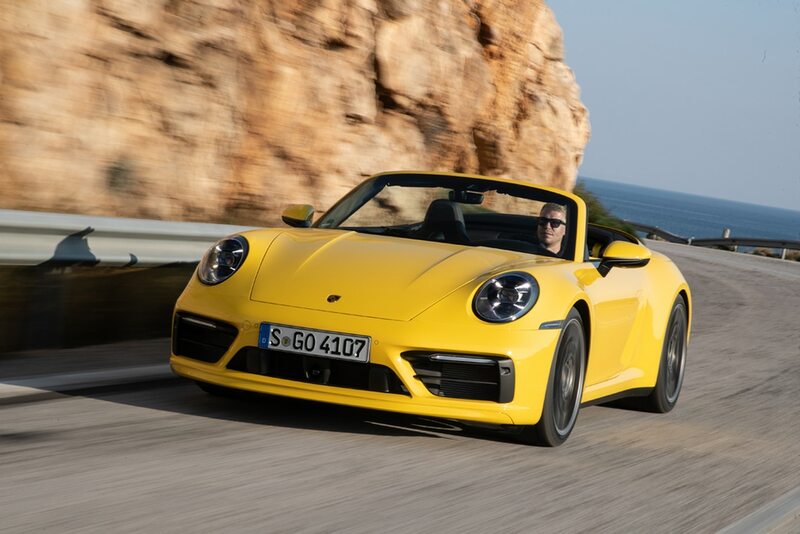 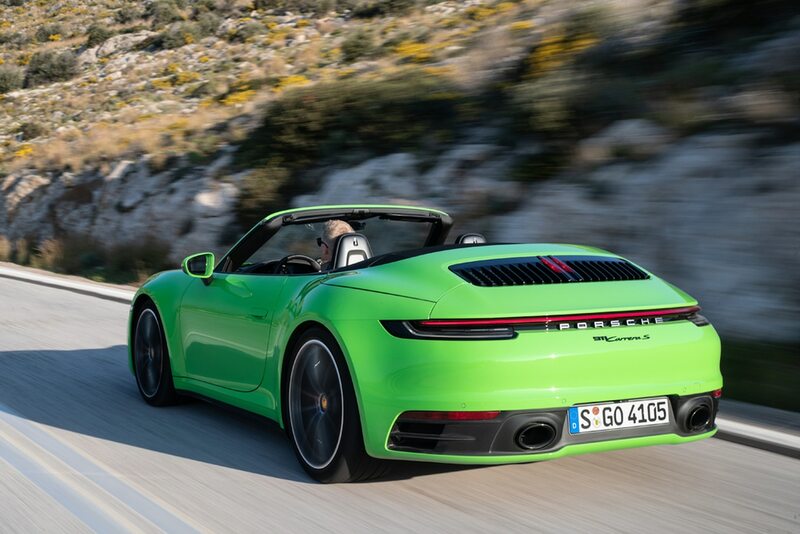 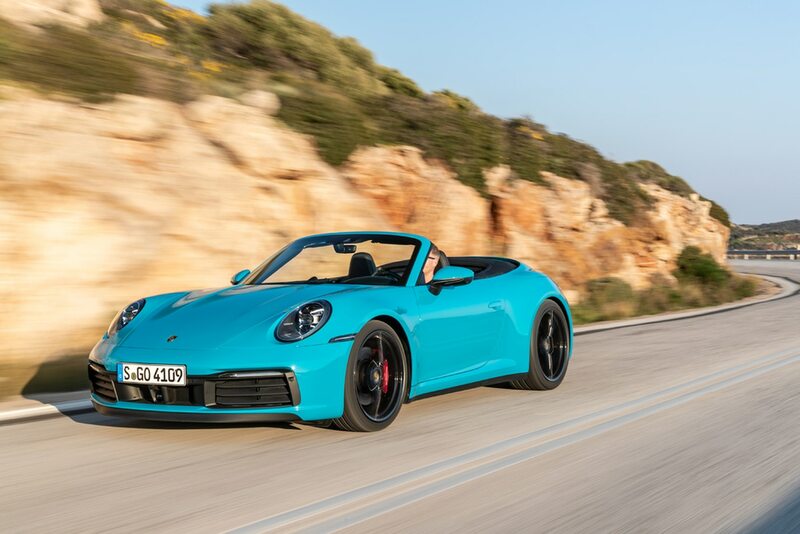 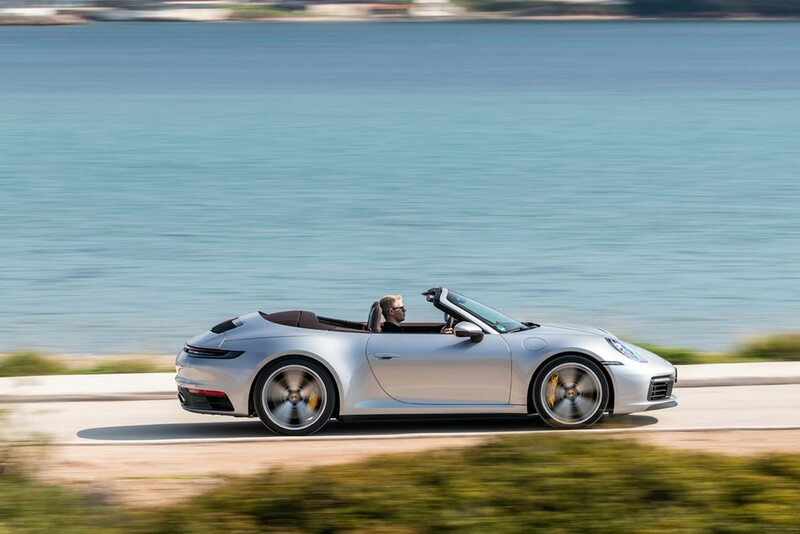 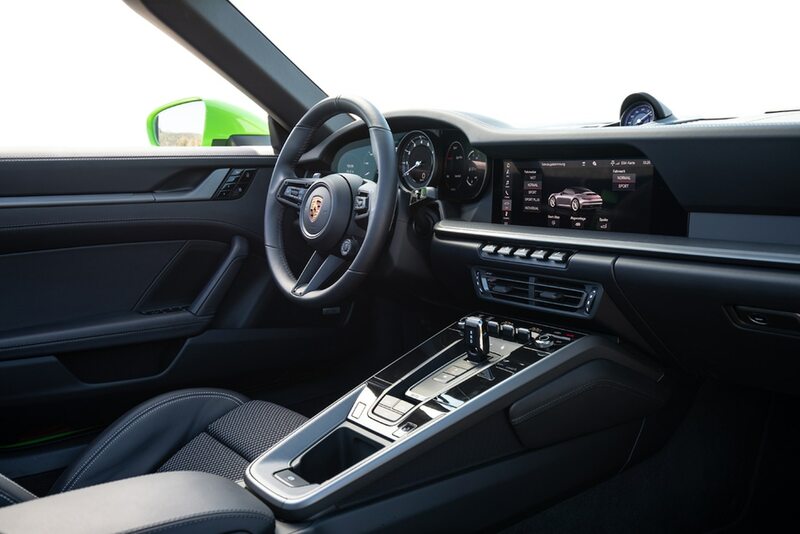 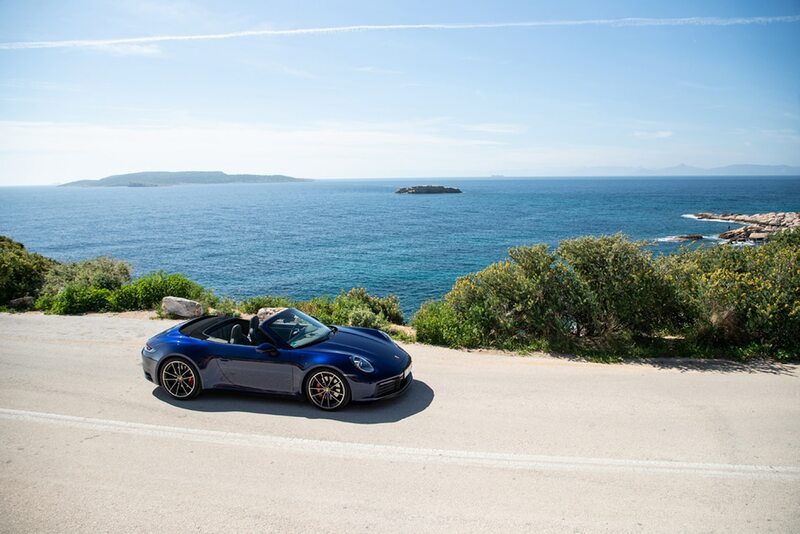 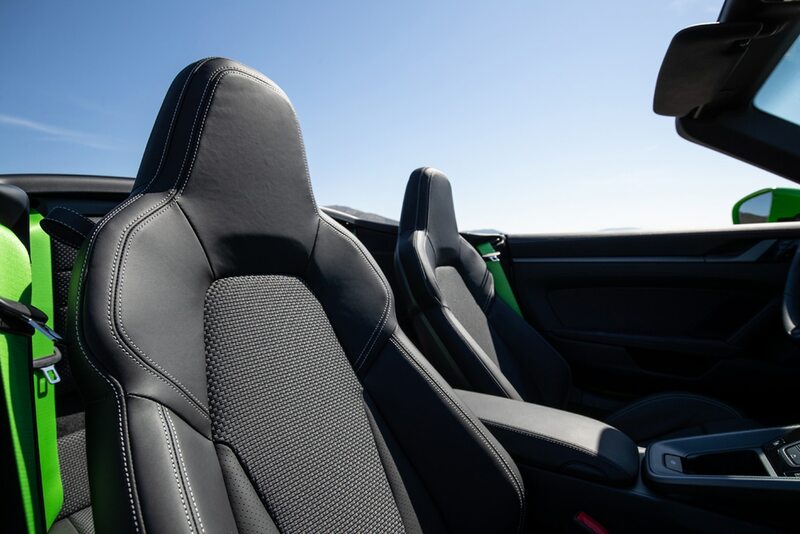 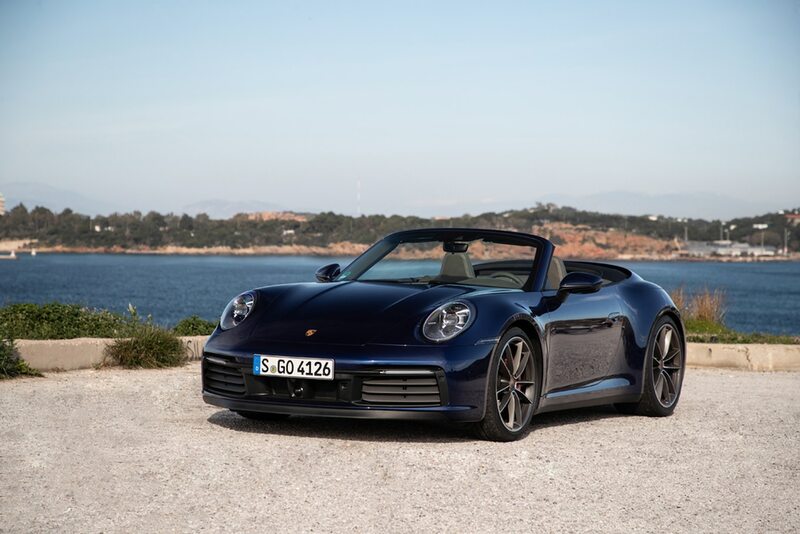 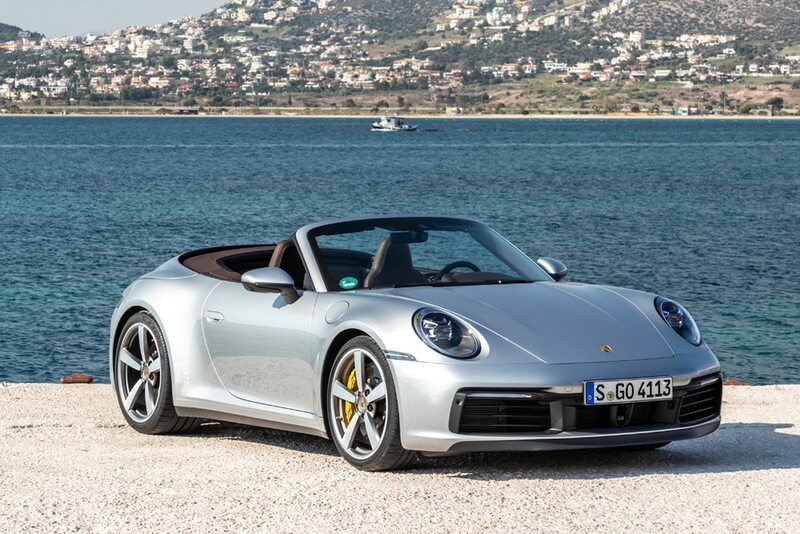 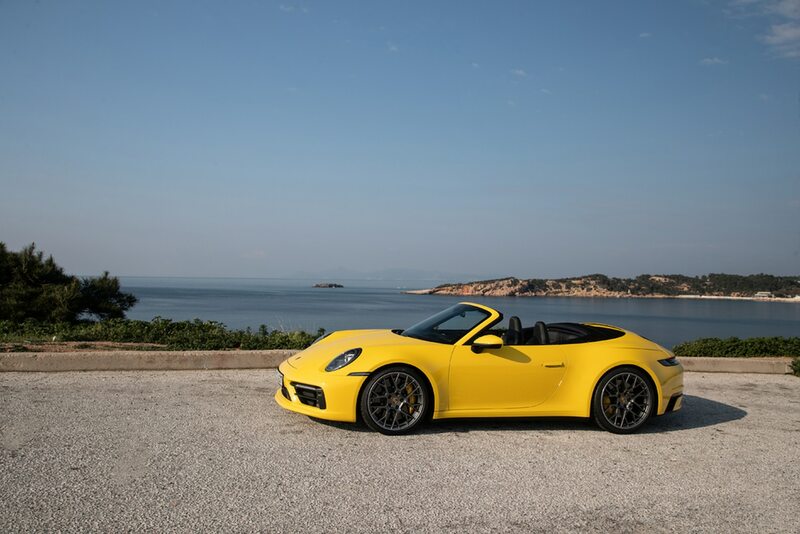 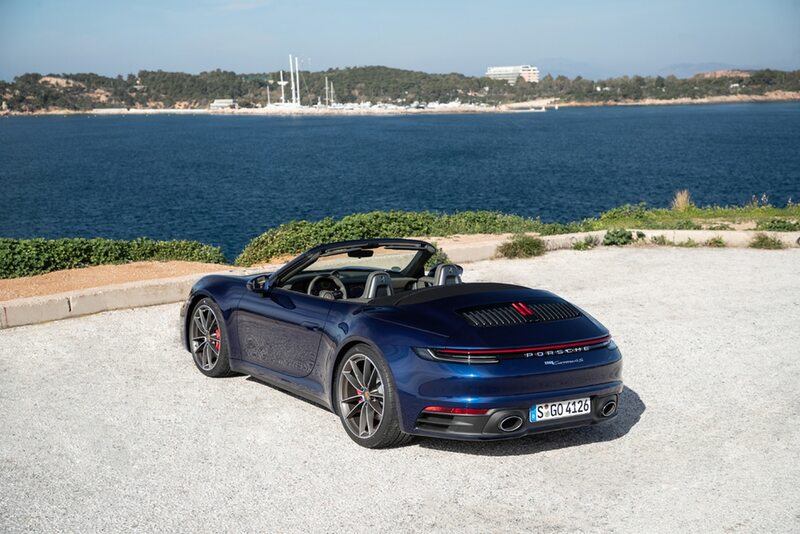 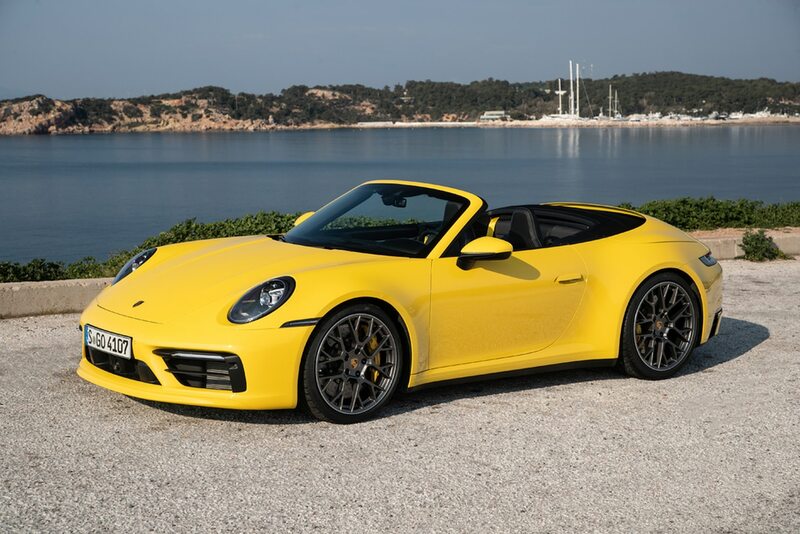 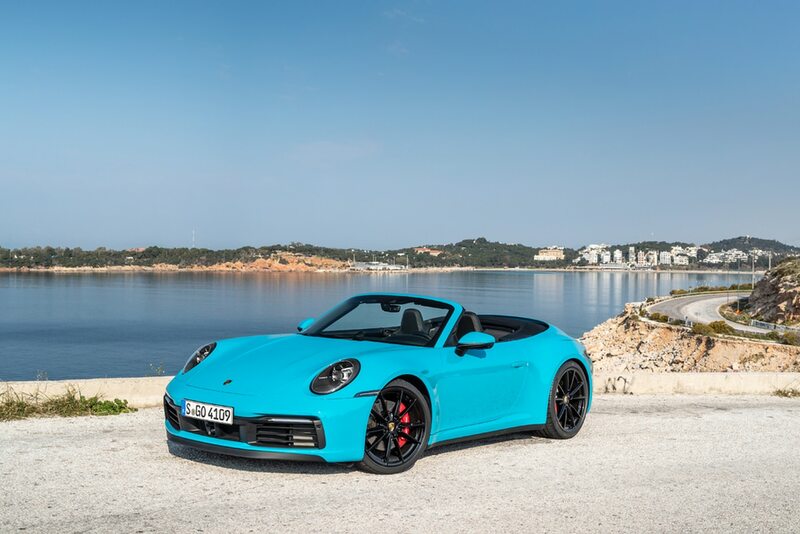 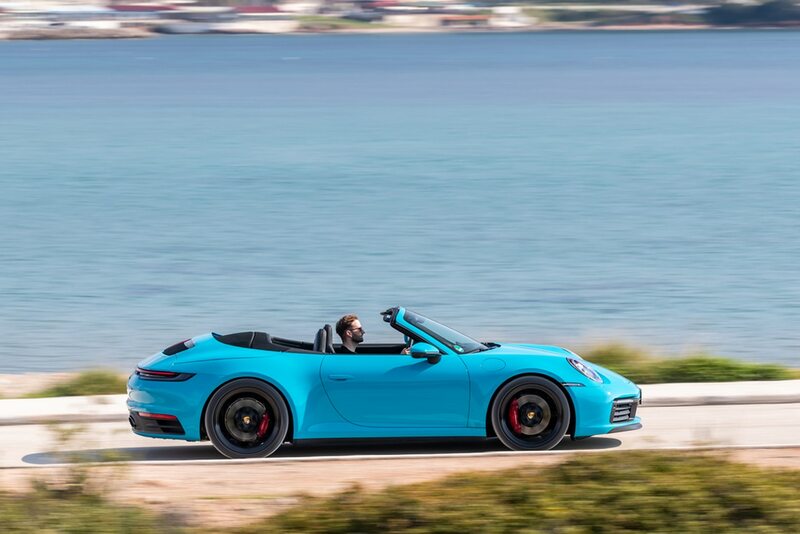 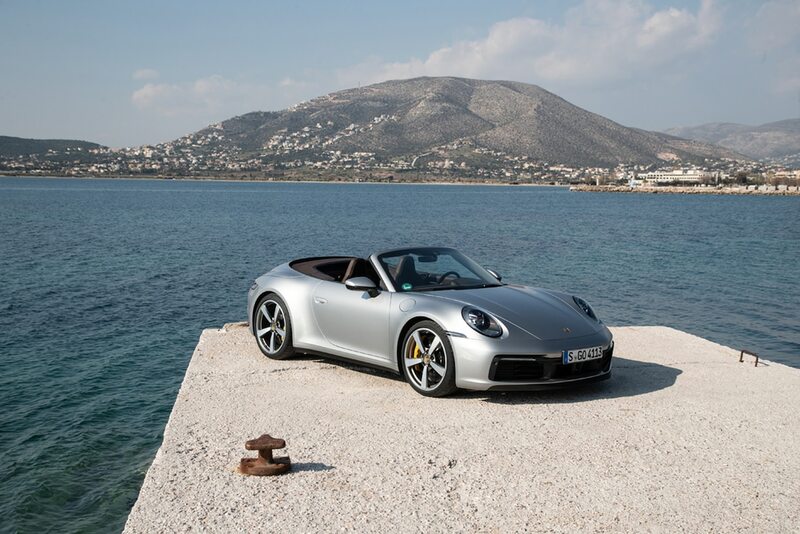 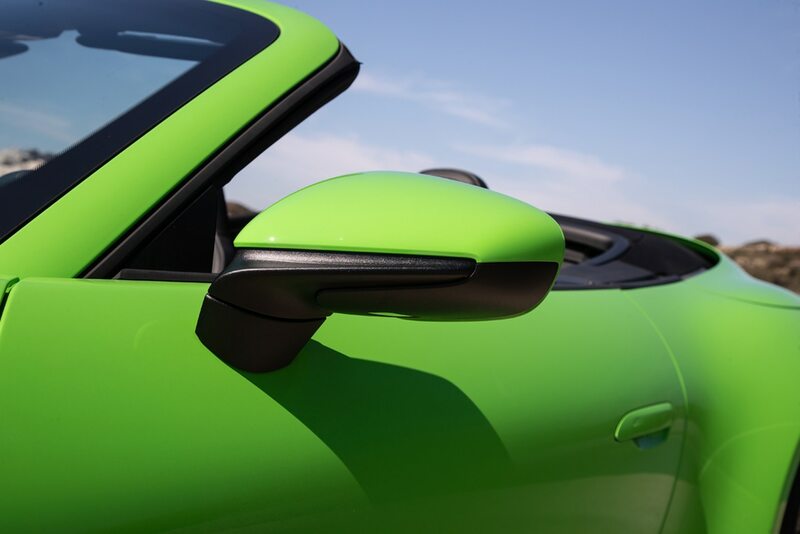 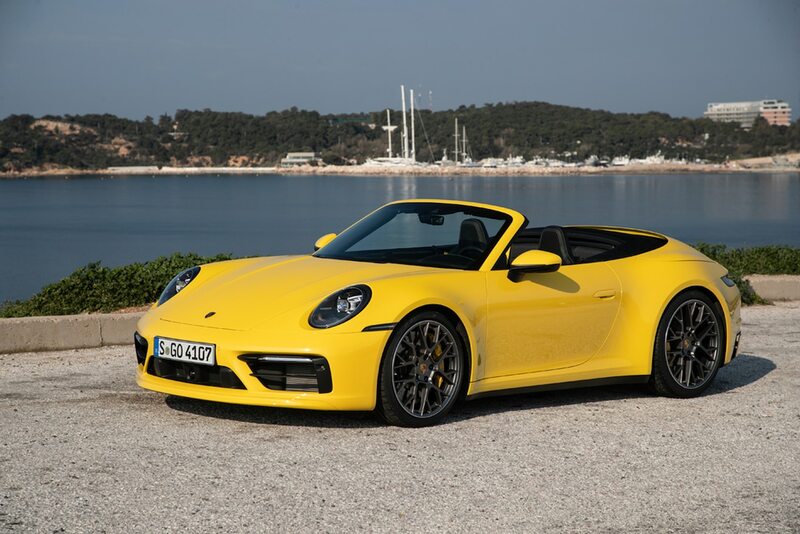 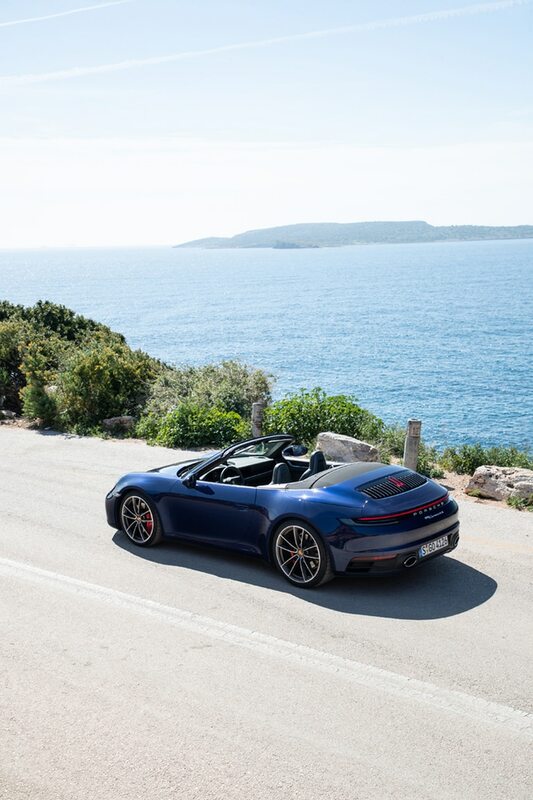 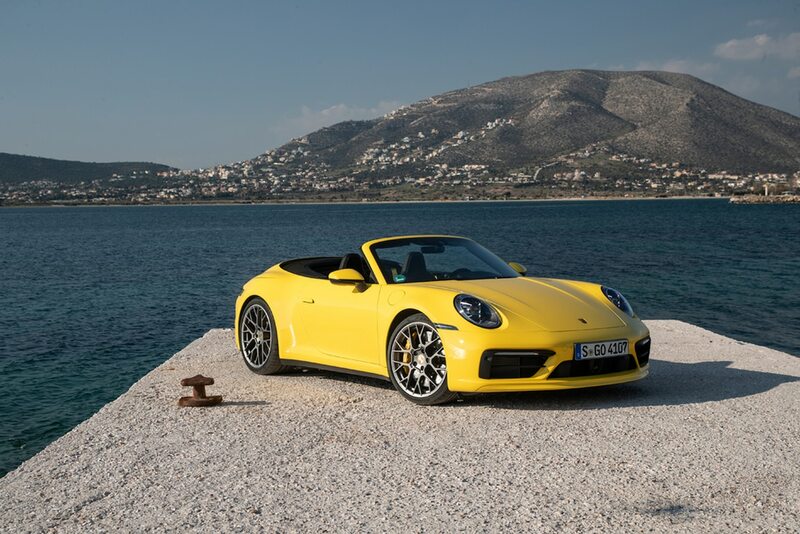 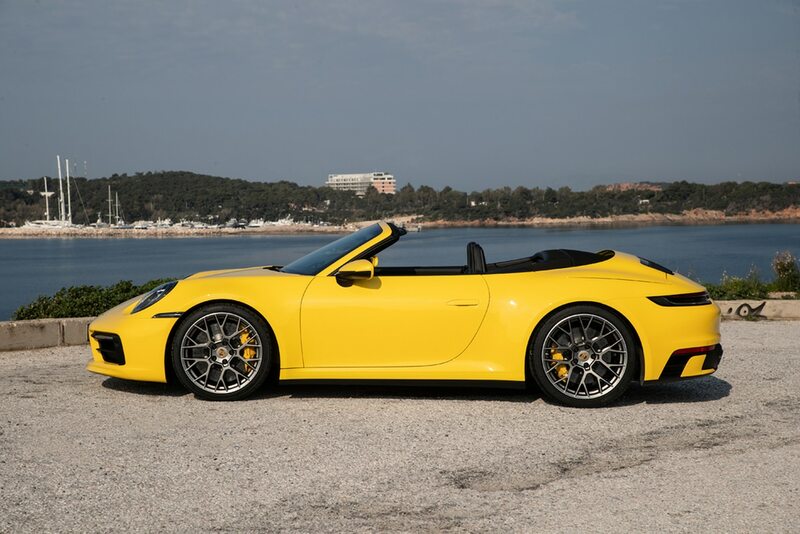 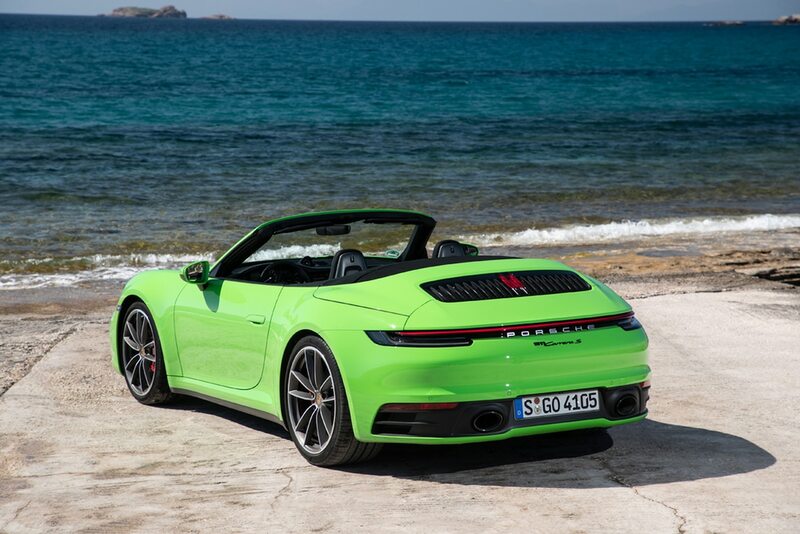 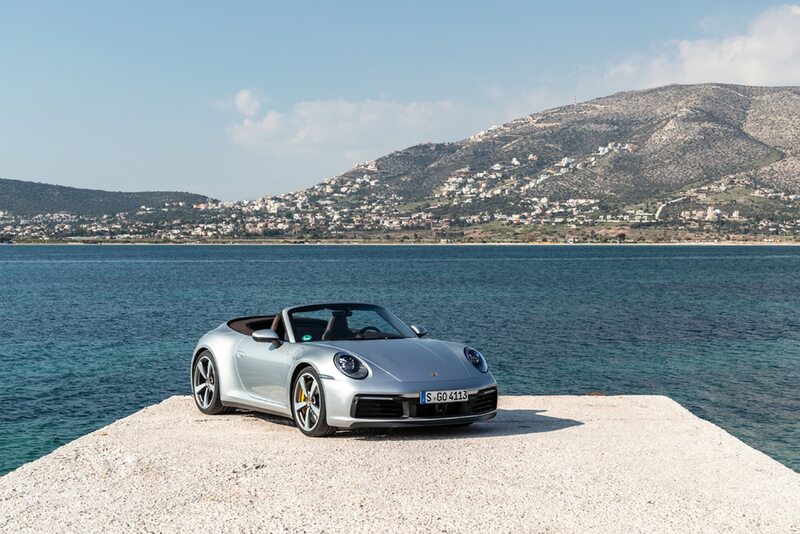 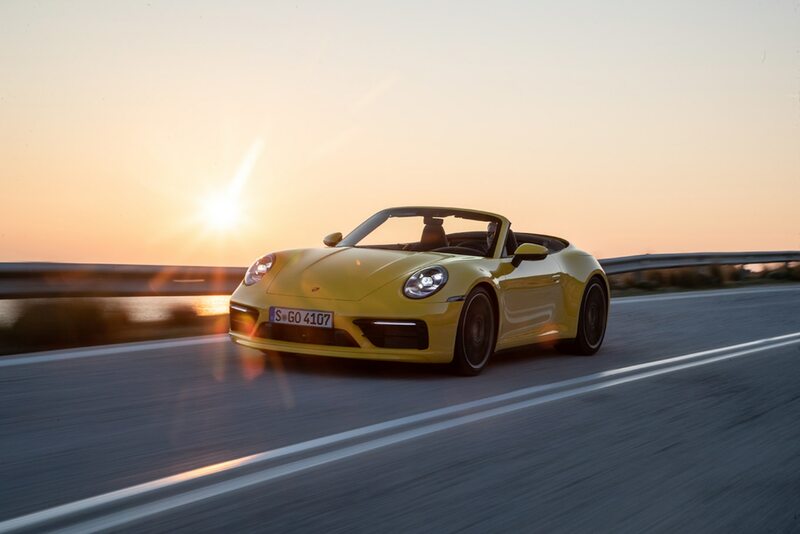 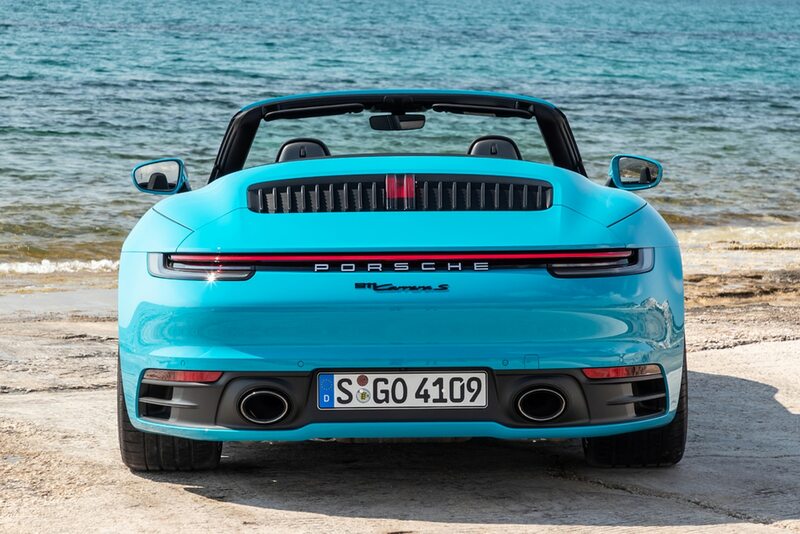 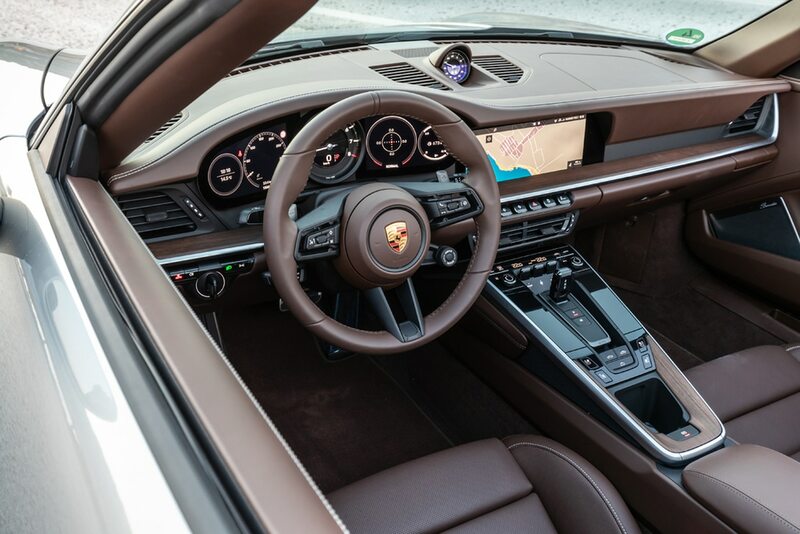 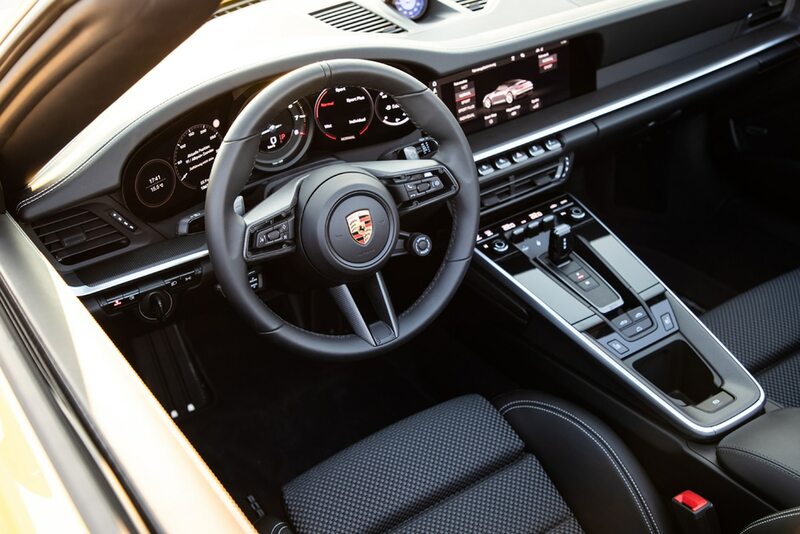 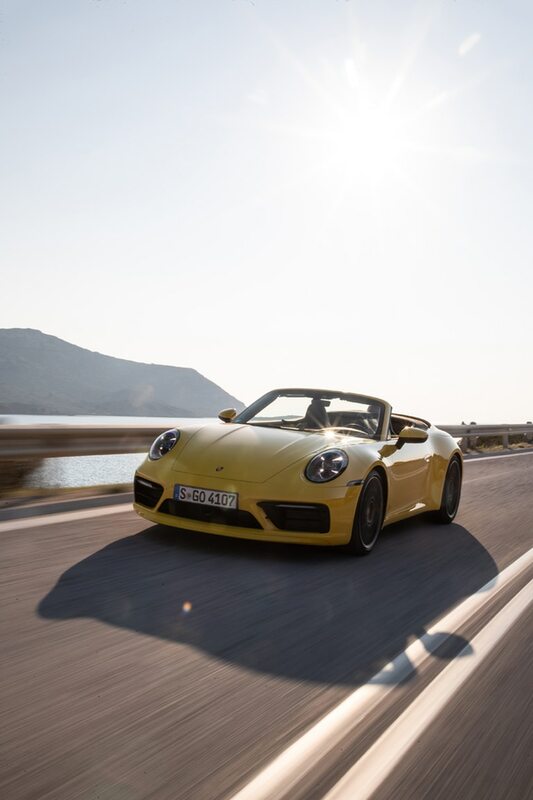 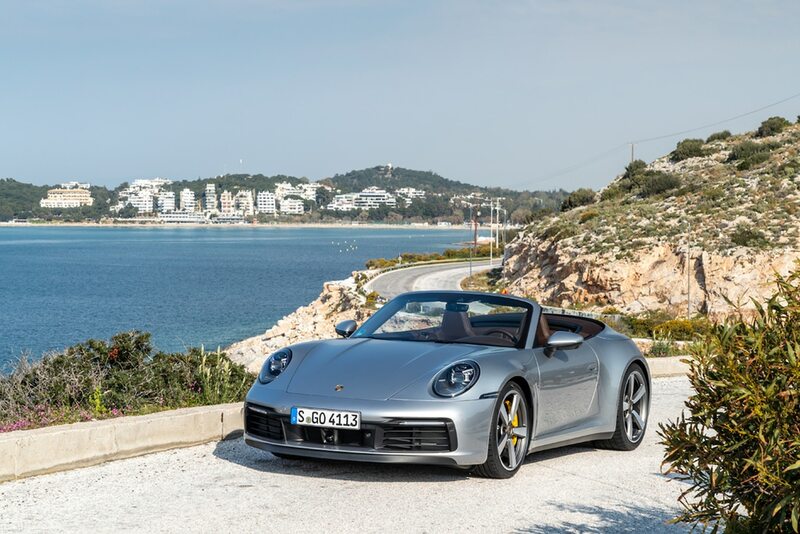 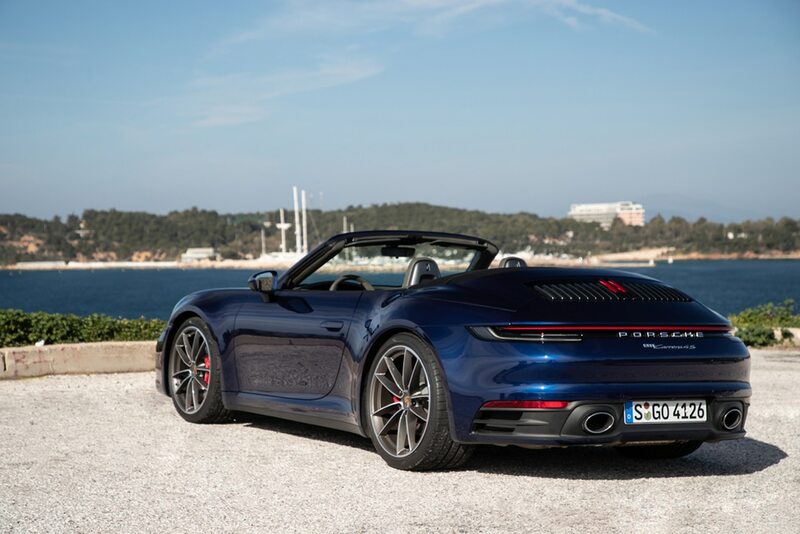 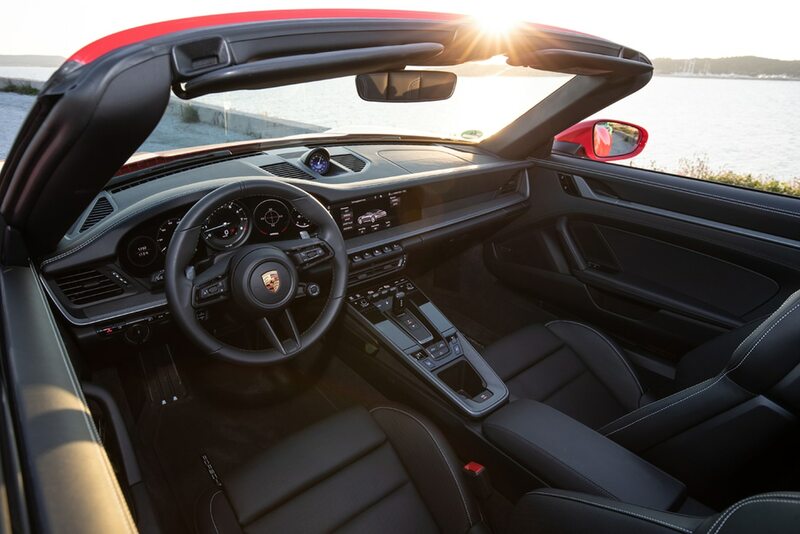 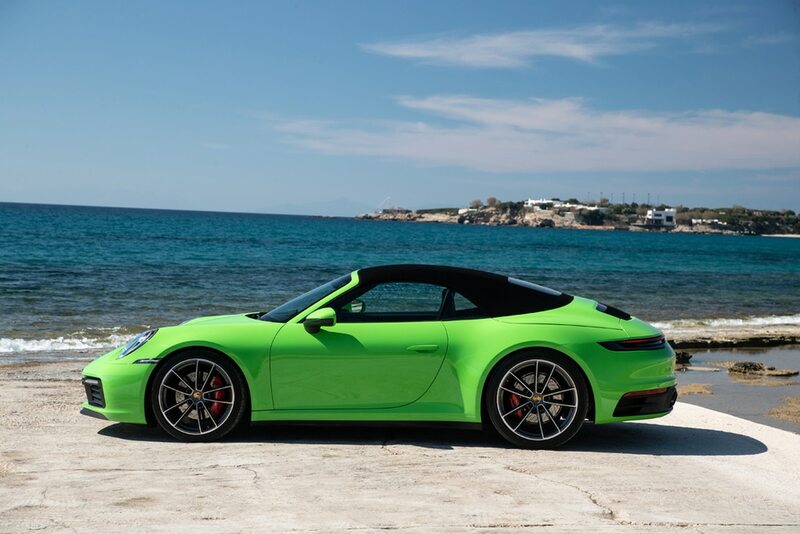 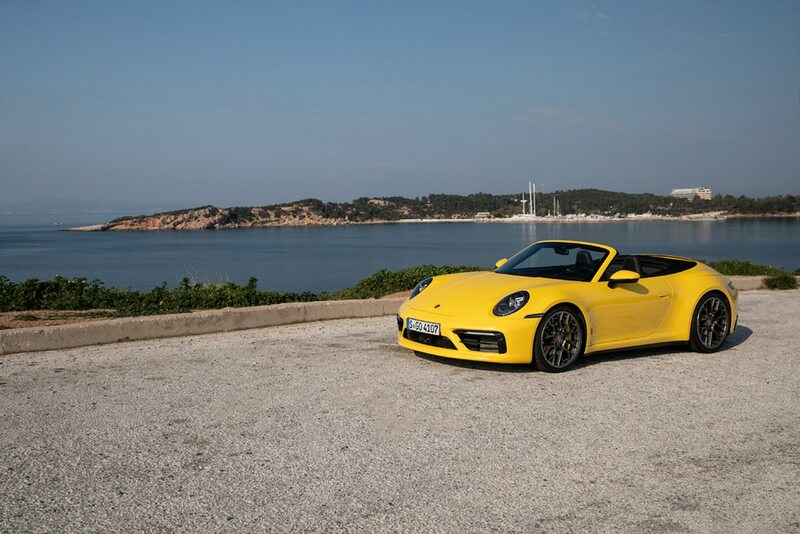 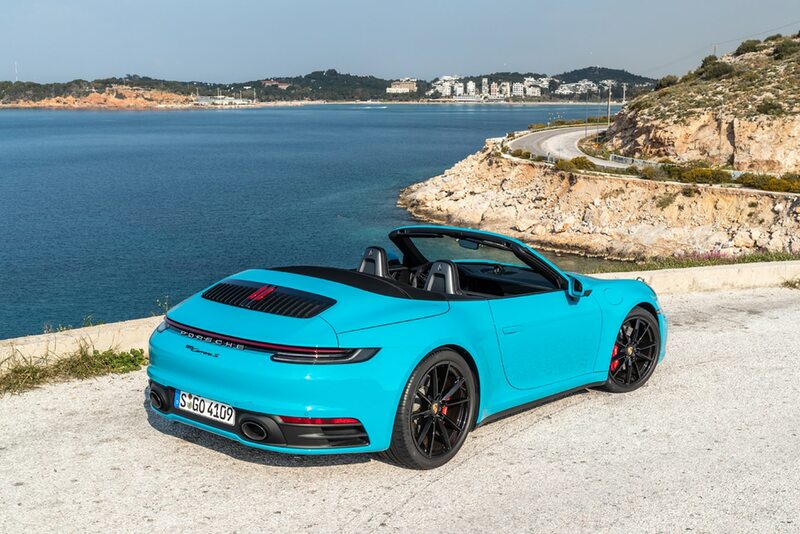 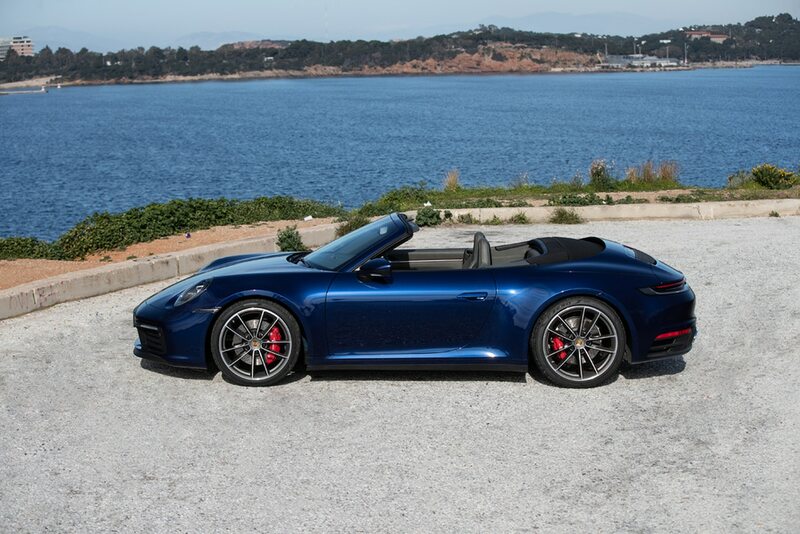 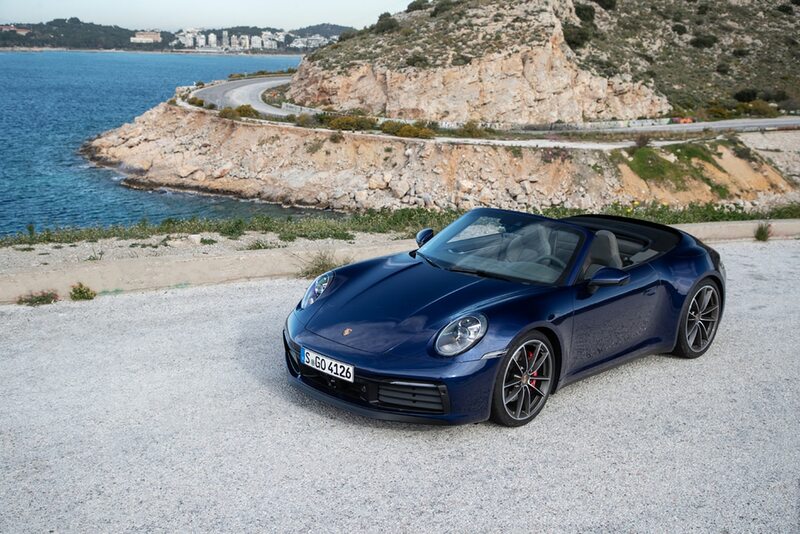 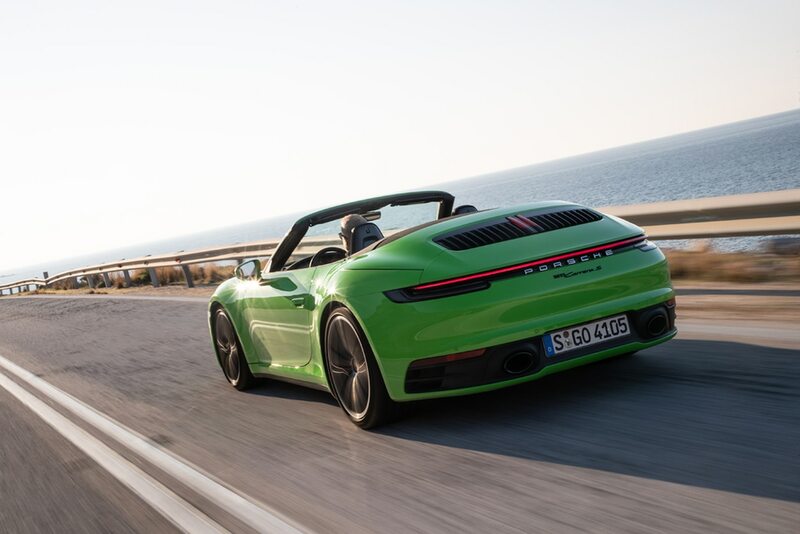 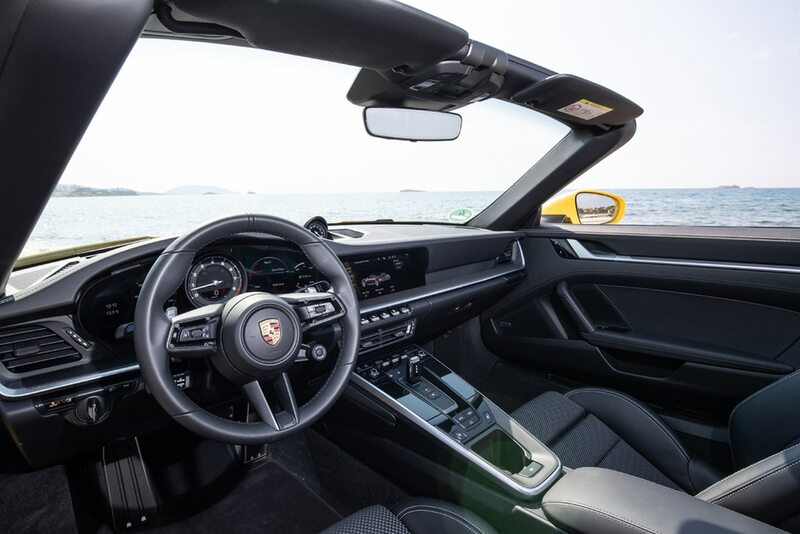 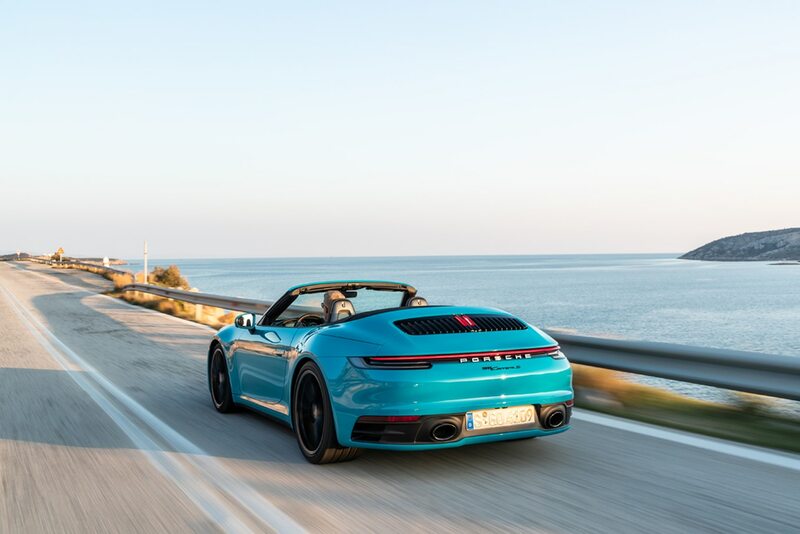 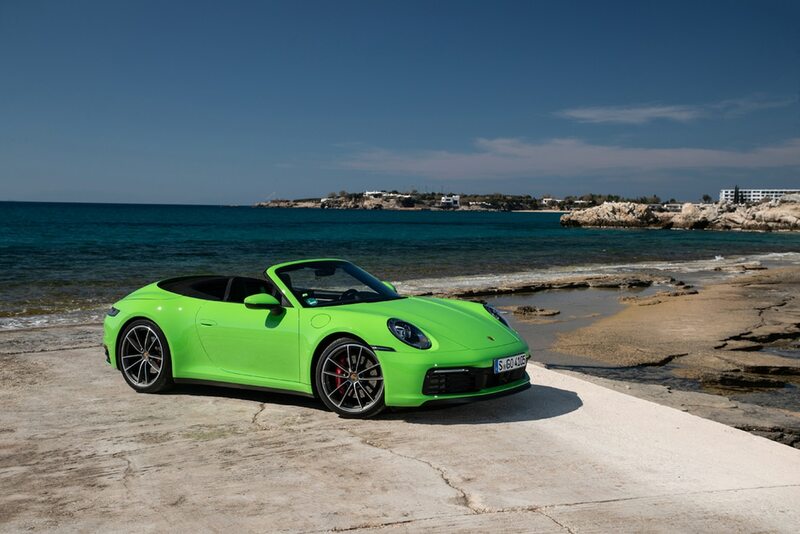 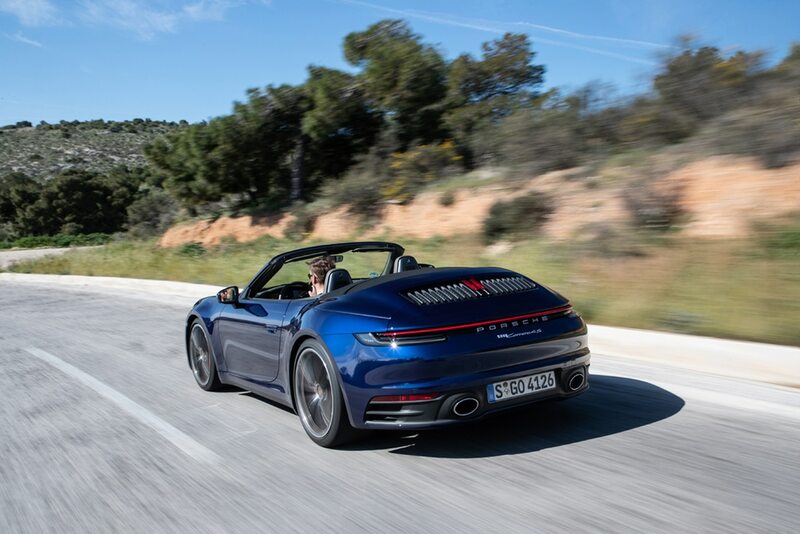 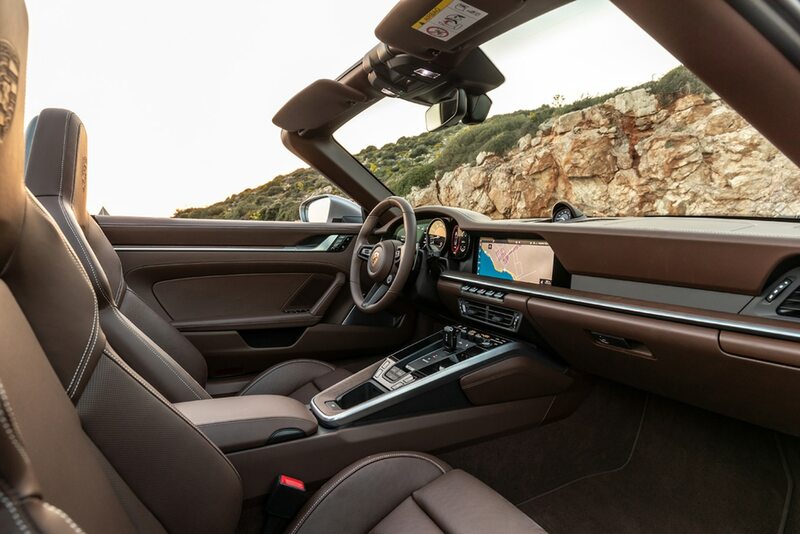 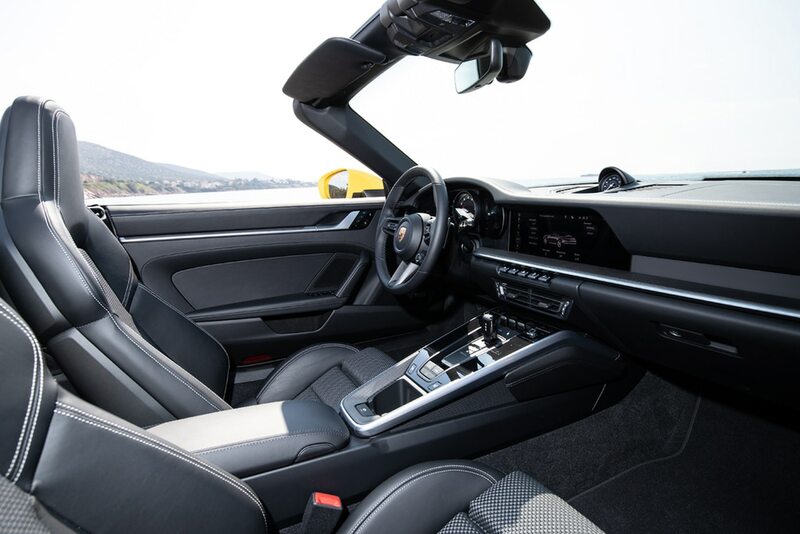 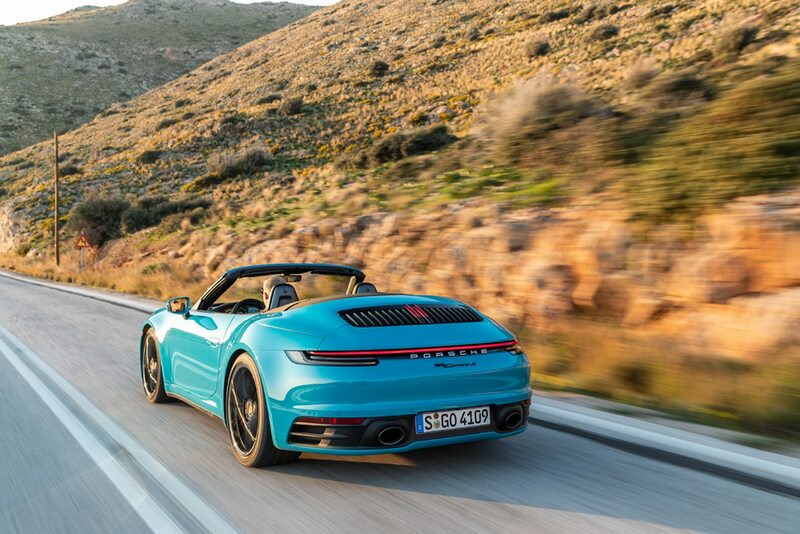 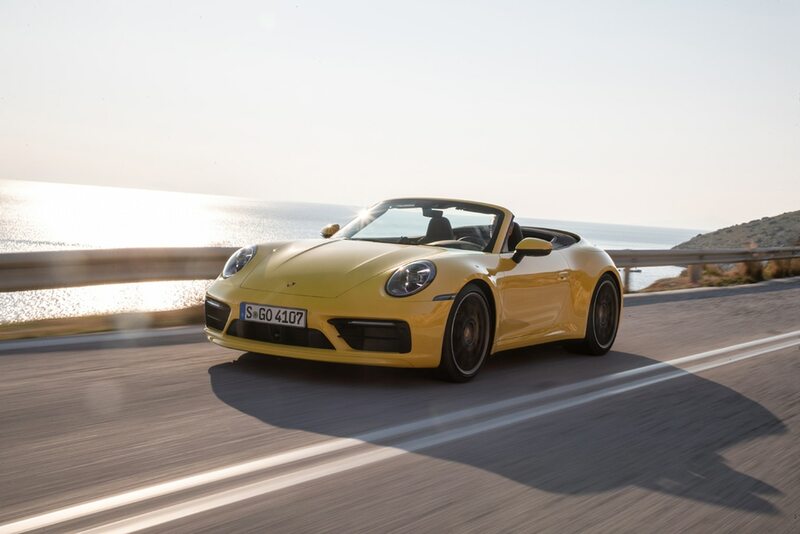 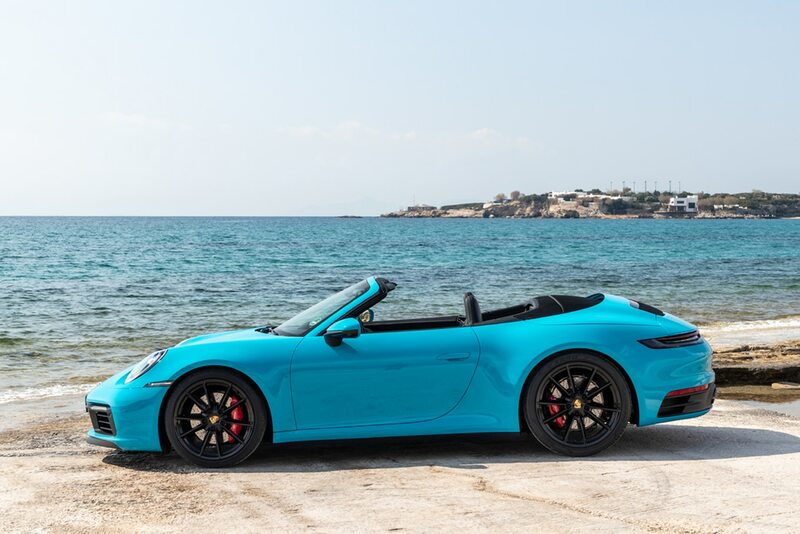 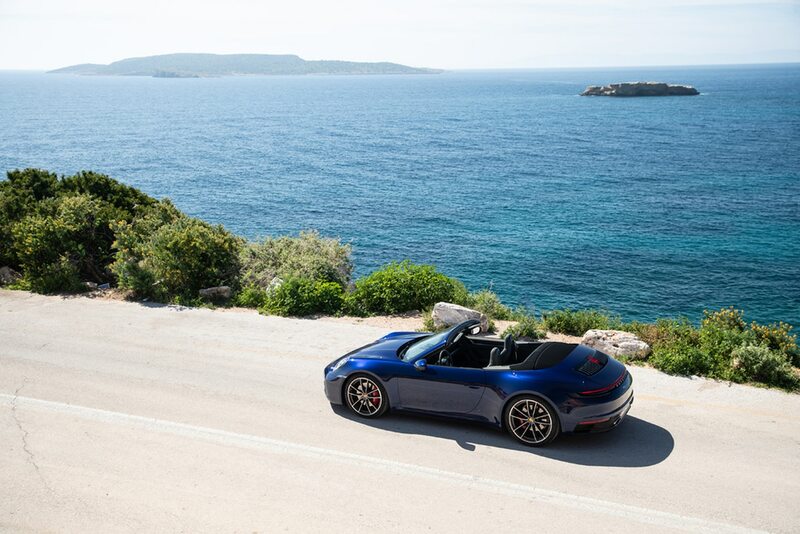 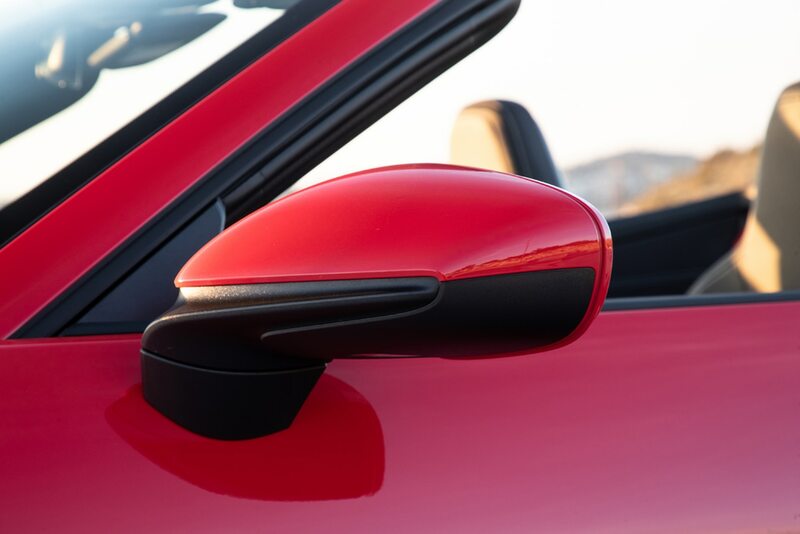 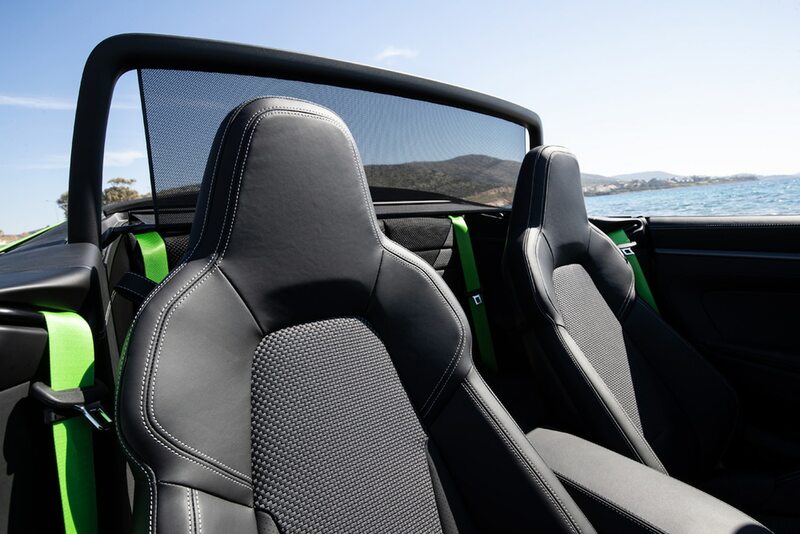 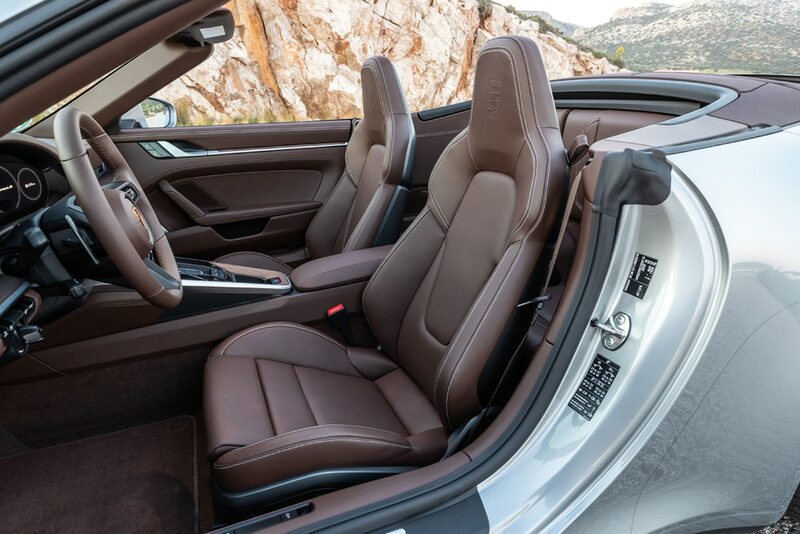 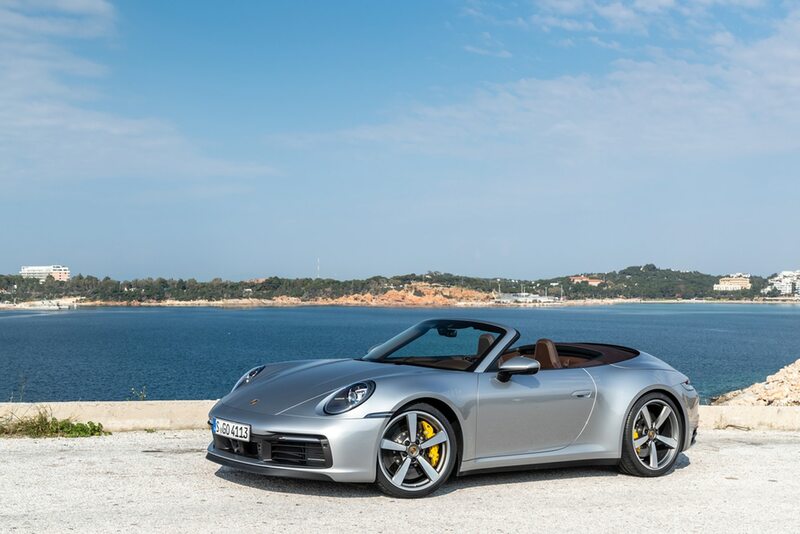 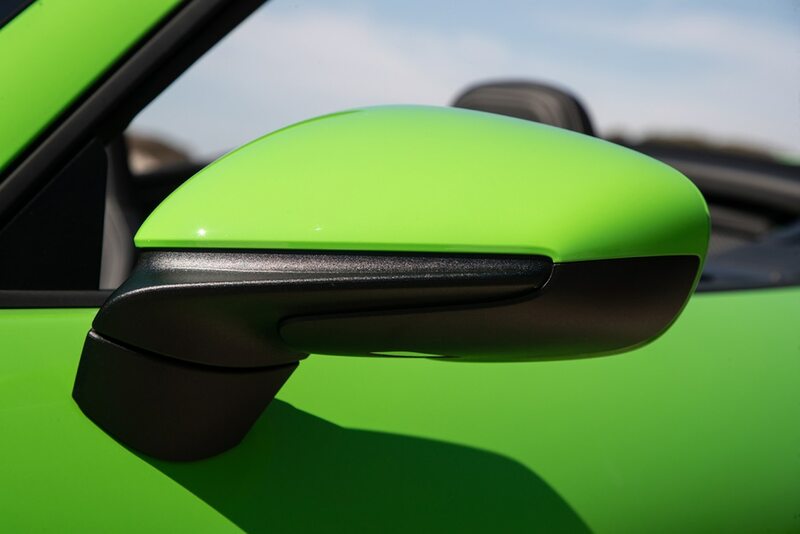 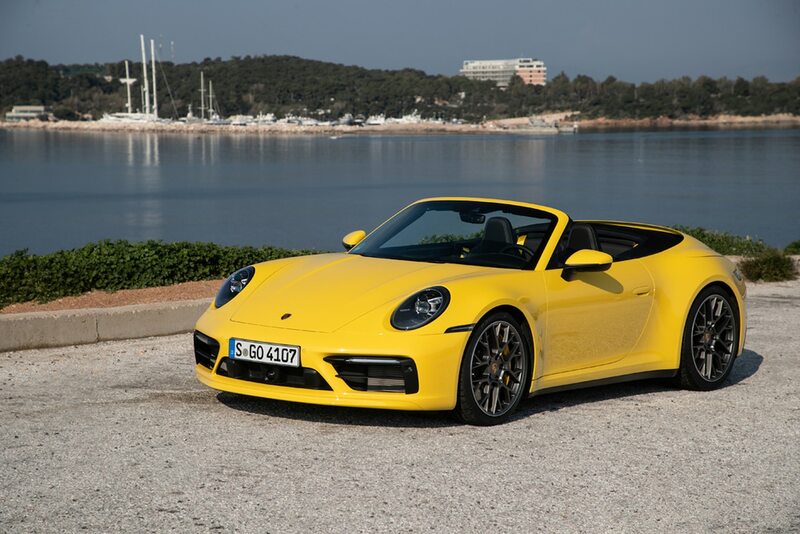 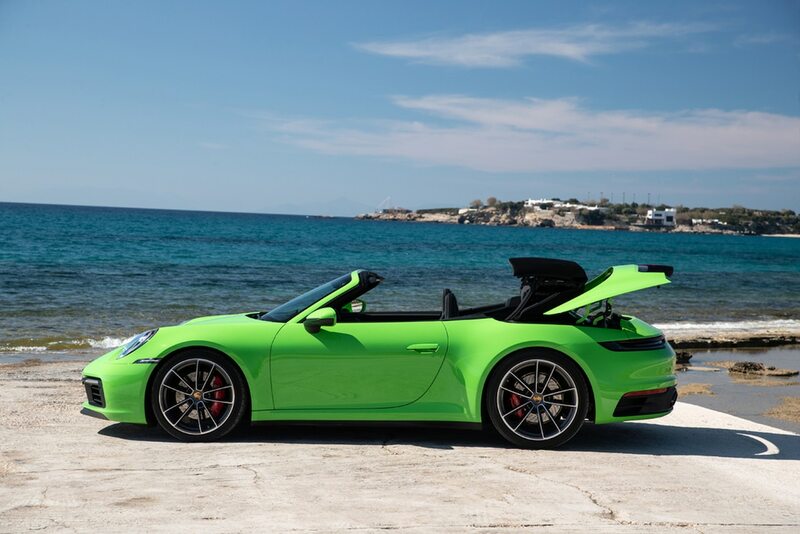 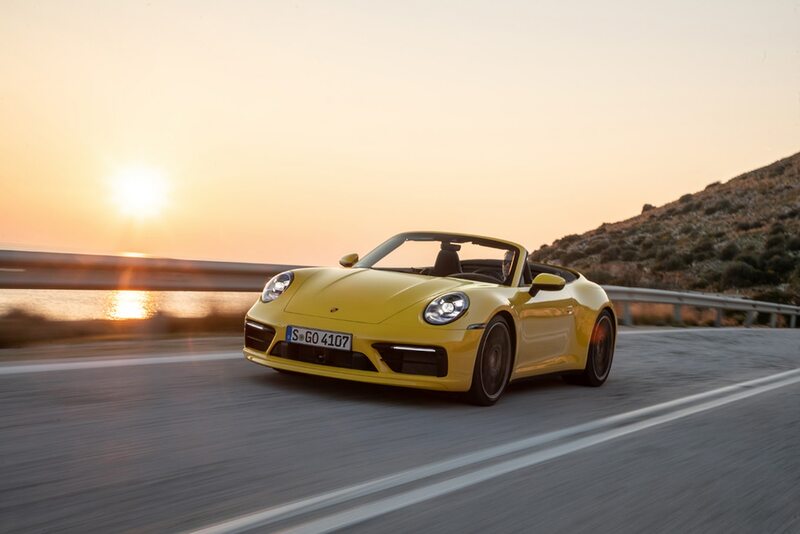 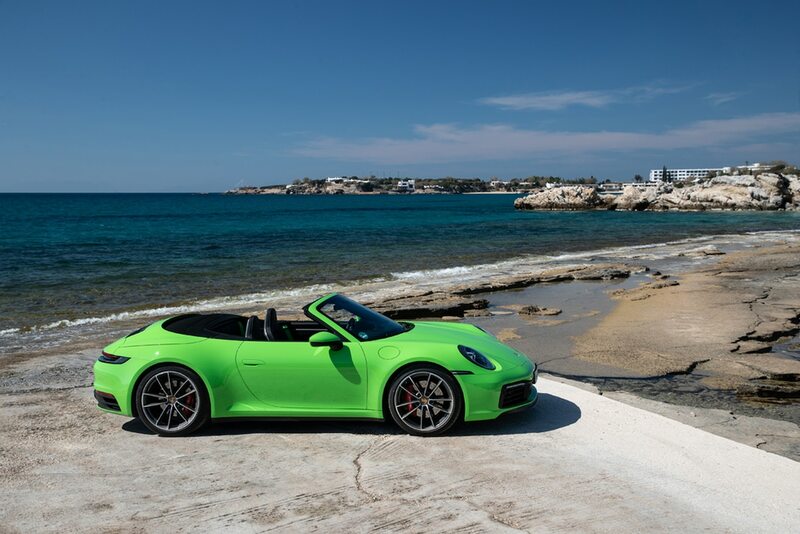 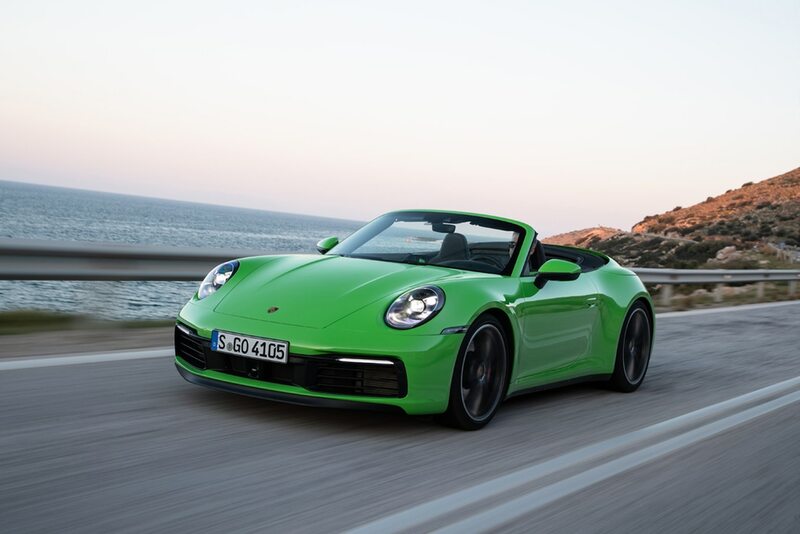 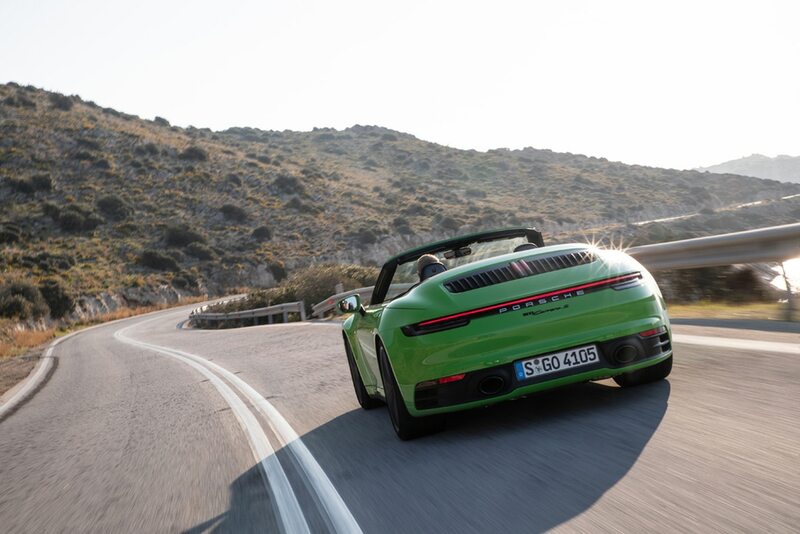 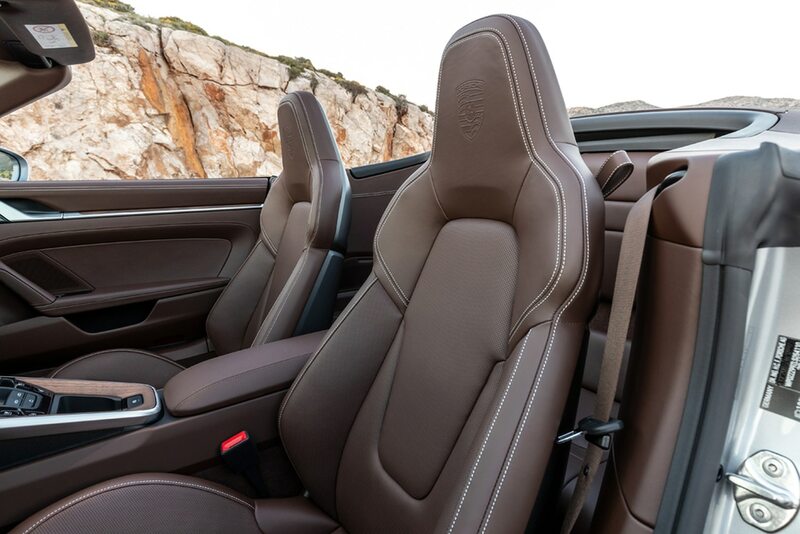 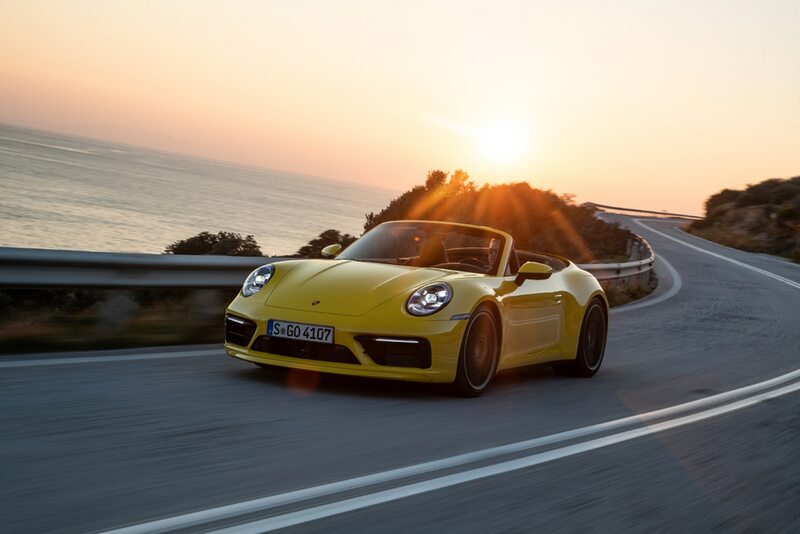 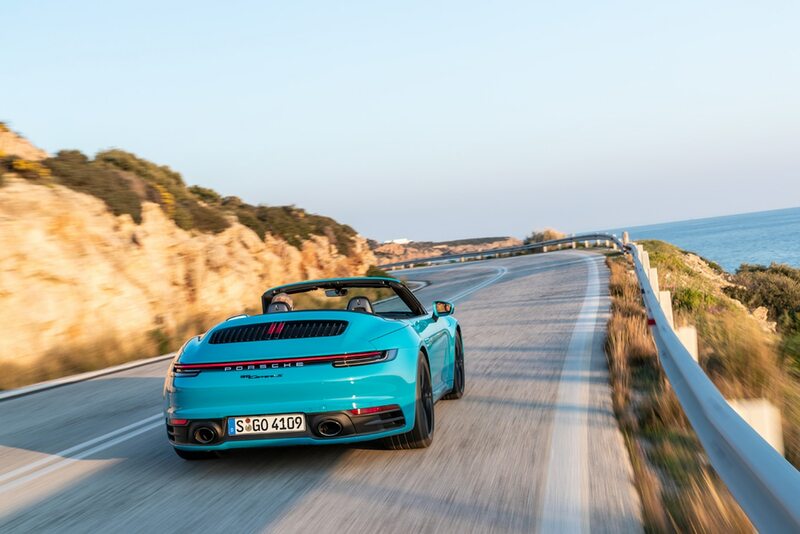 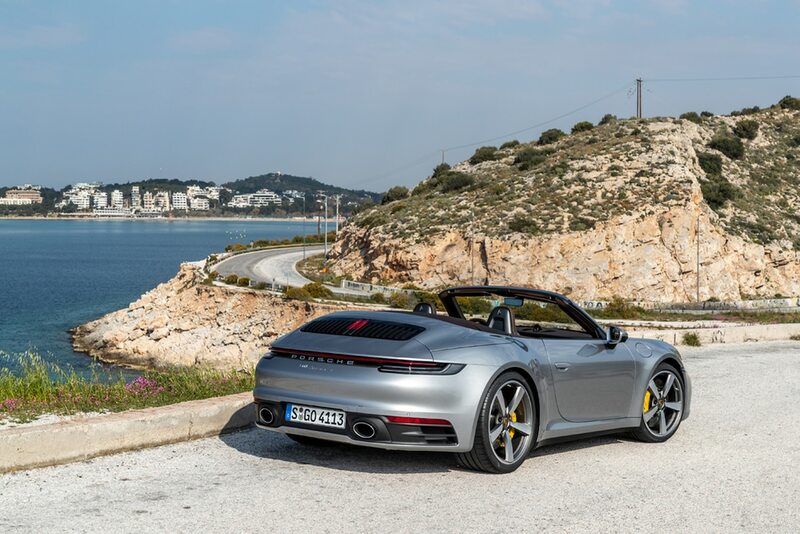 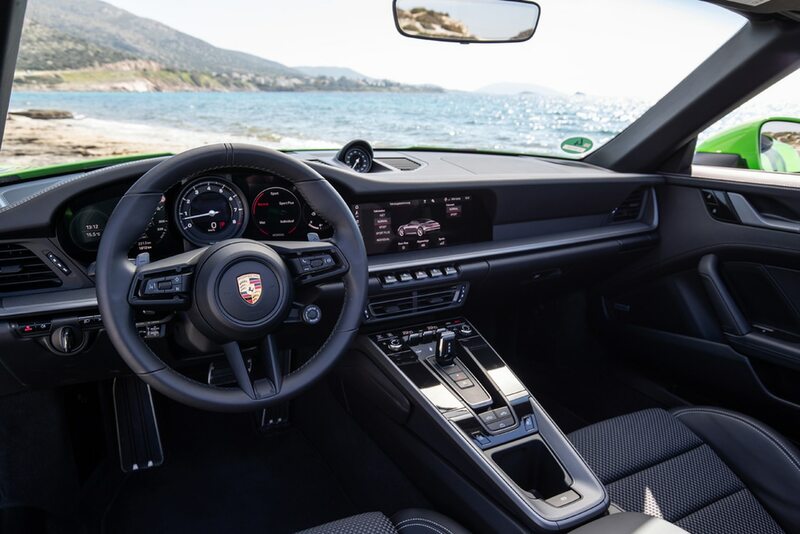 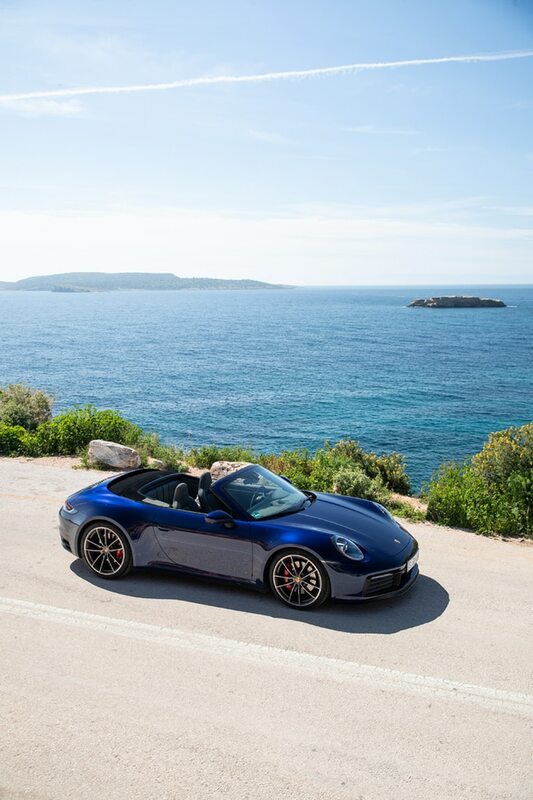 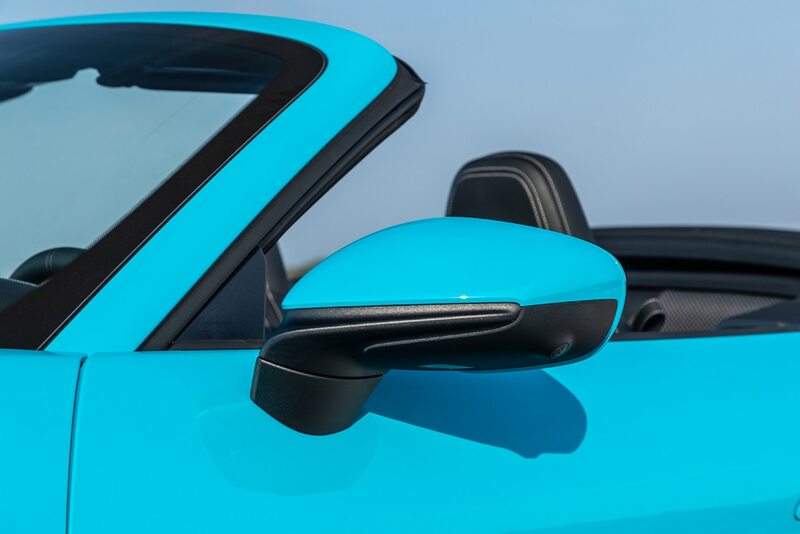 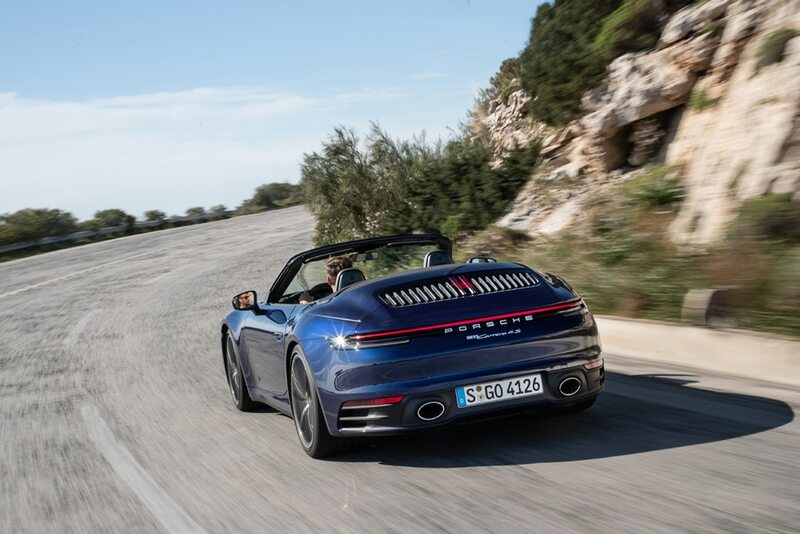 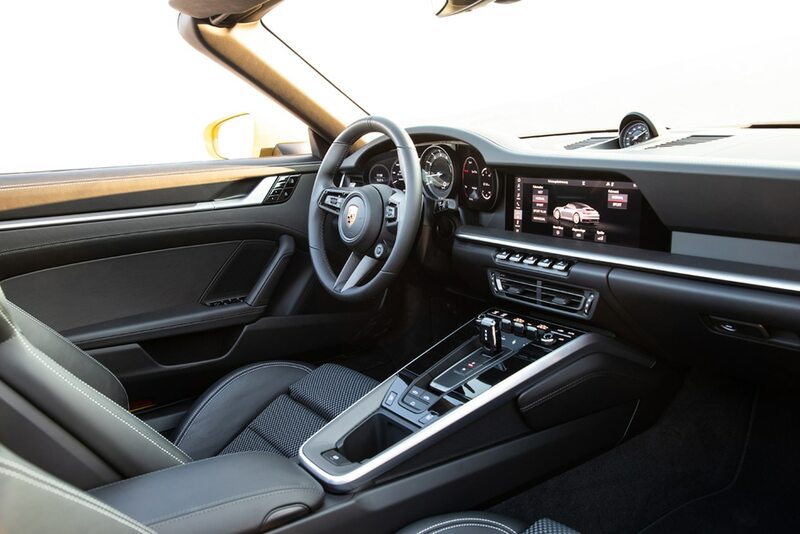 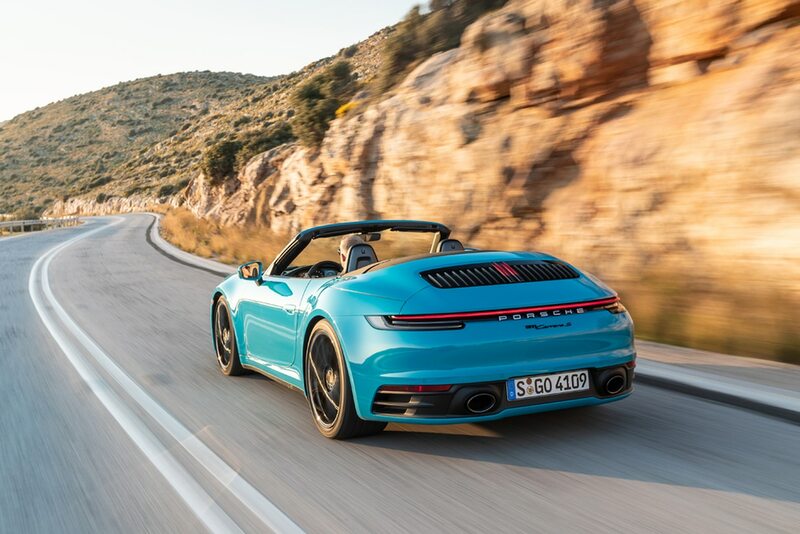 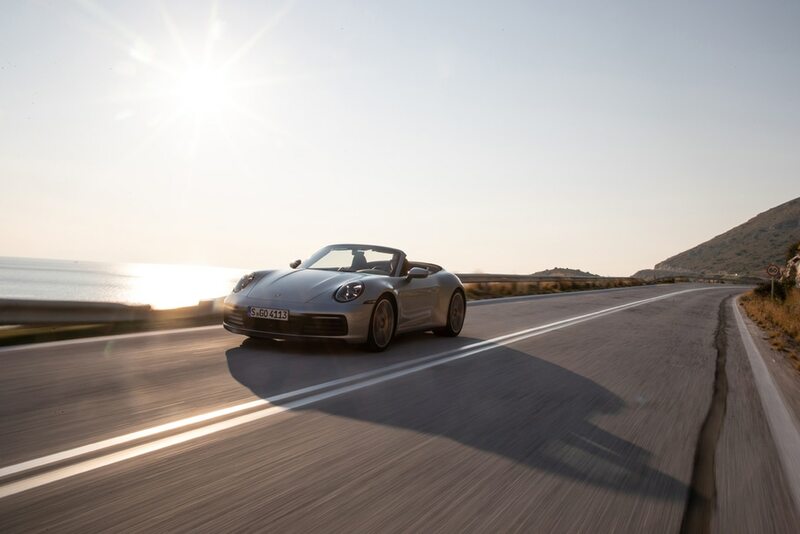 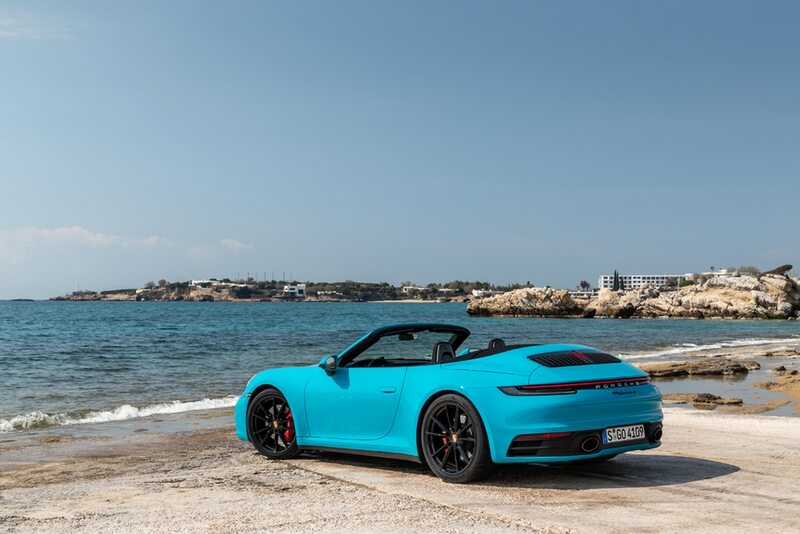 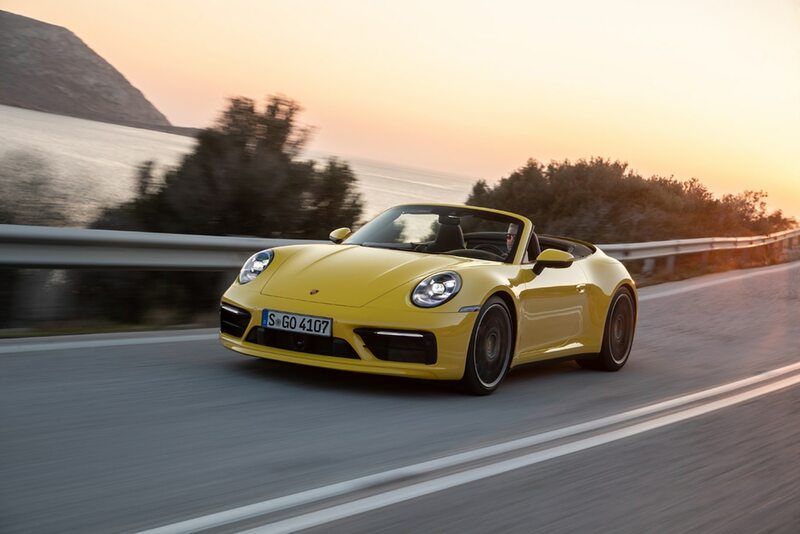 The new top—designed in house at Porsche like every convertible top that’s preceded it—employs a clever magnesium structure with three large panels that stow in a stack above the glass rear window and ensure that the fabric never balloons or flaps at top speed (188 mph (302 km/h) on the 4S and 190 (306 km/h) on the rear-drive S if you’re planning to take factory delivery for an autobahn vacation, which we highly recommend). 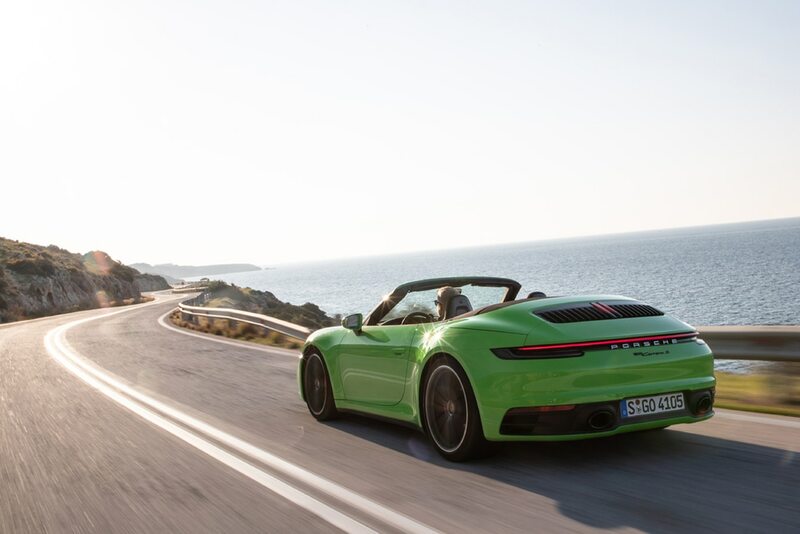 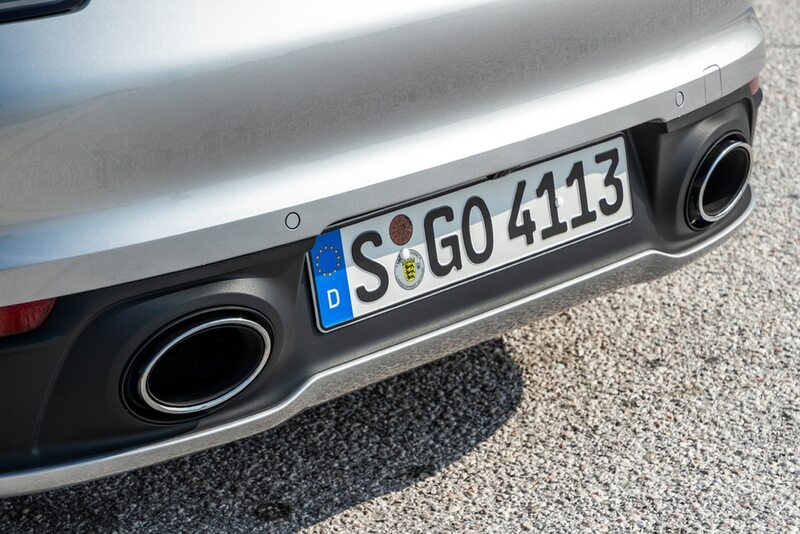 The top goes up or down 2 seconds quicker than its predecessor (in 12 flat) at speeds of up to 31 mph (50 km/h). 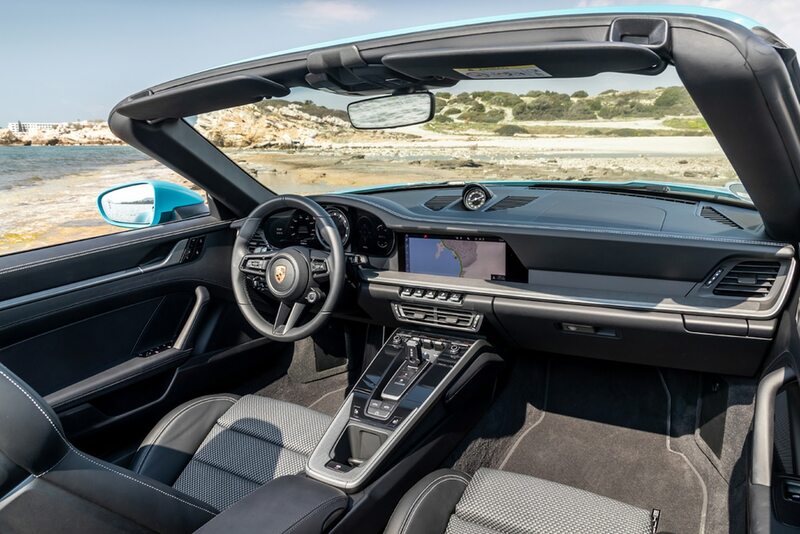 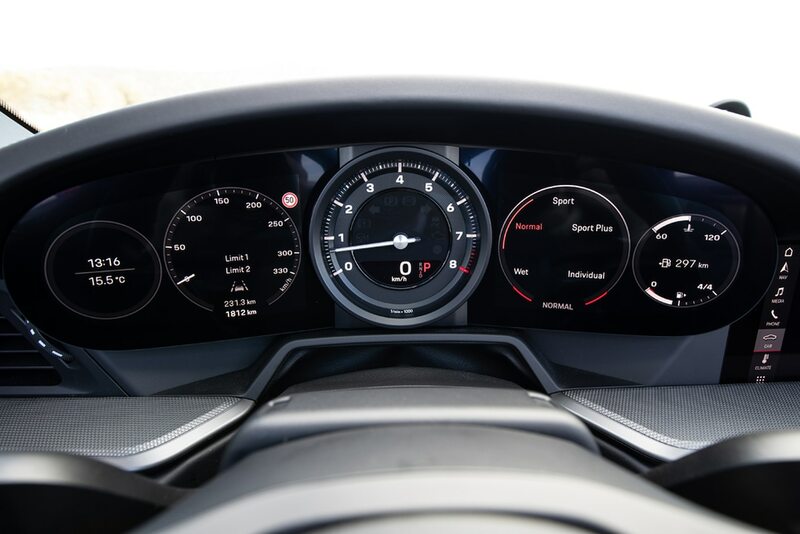 It’s controlled by buttons clearly marked with open- and closed-roof icons, set above a button that controls the clever mesh windscreen. 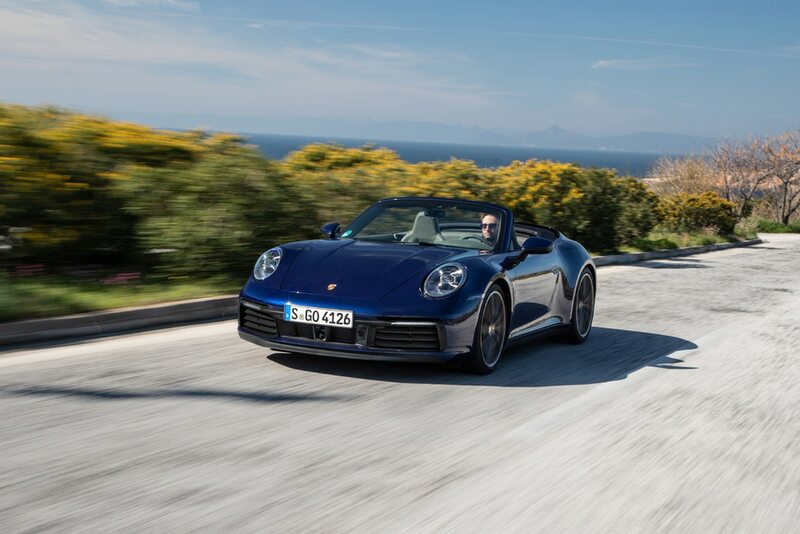 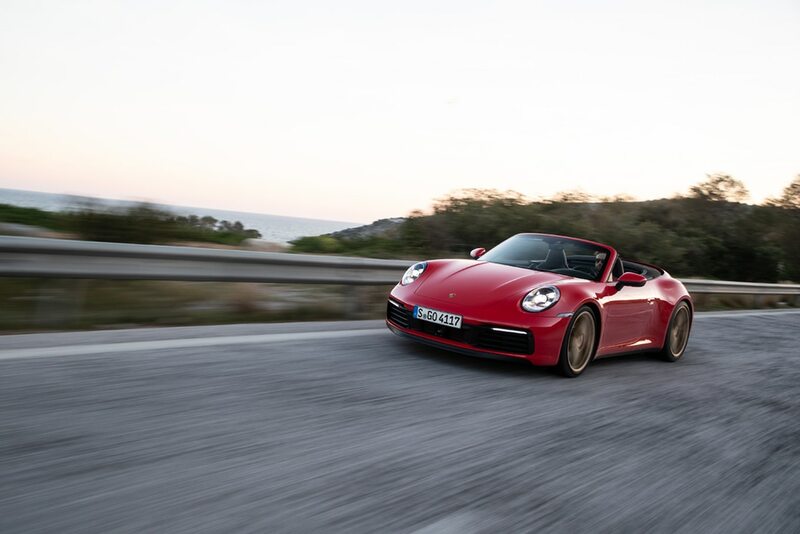 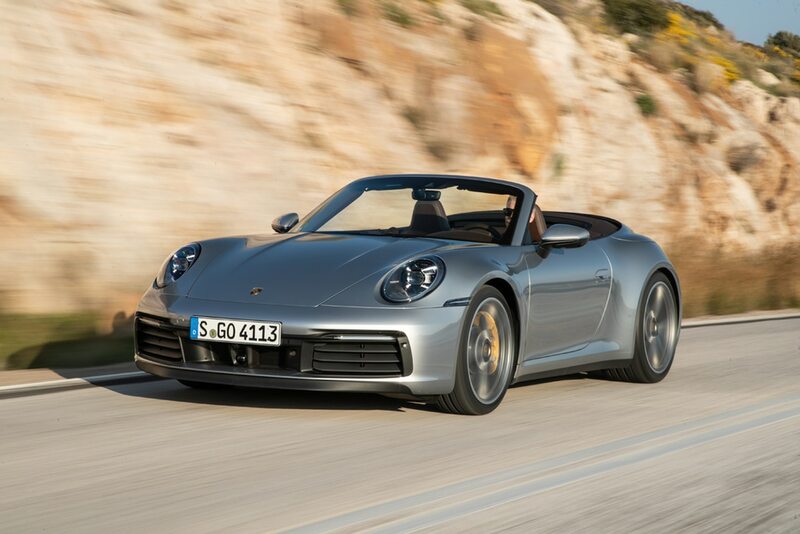 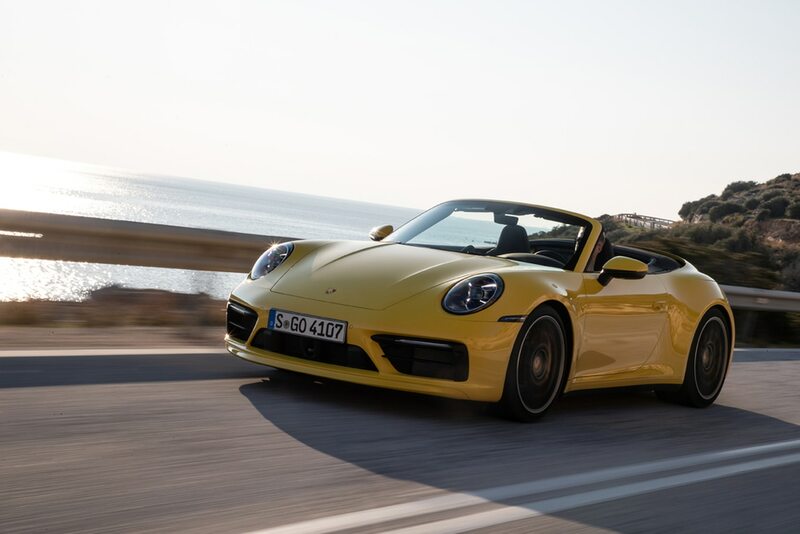 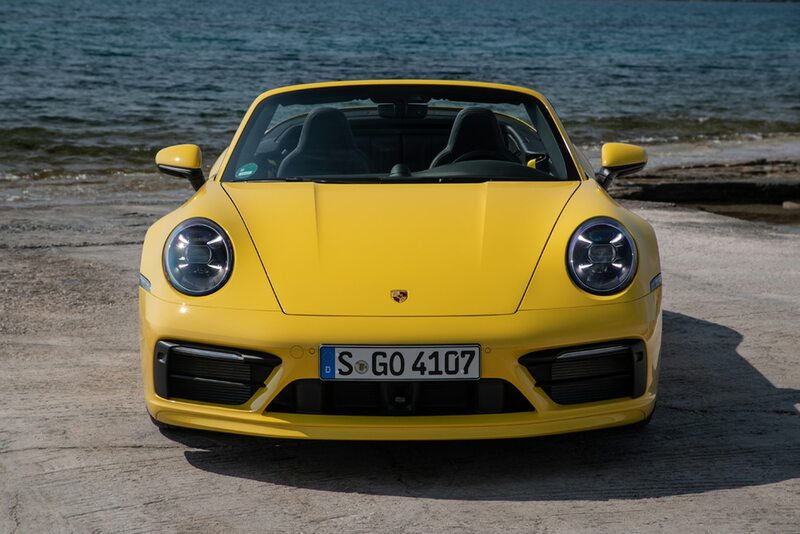 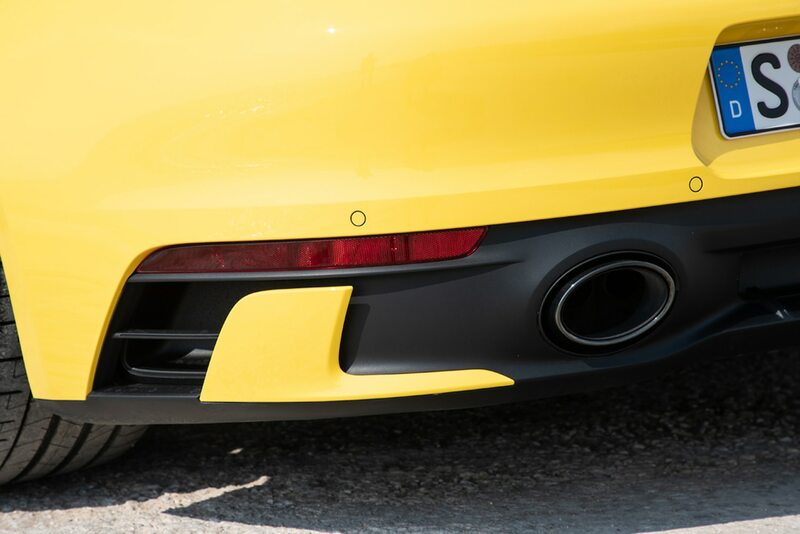 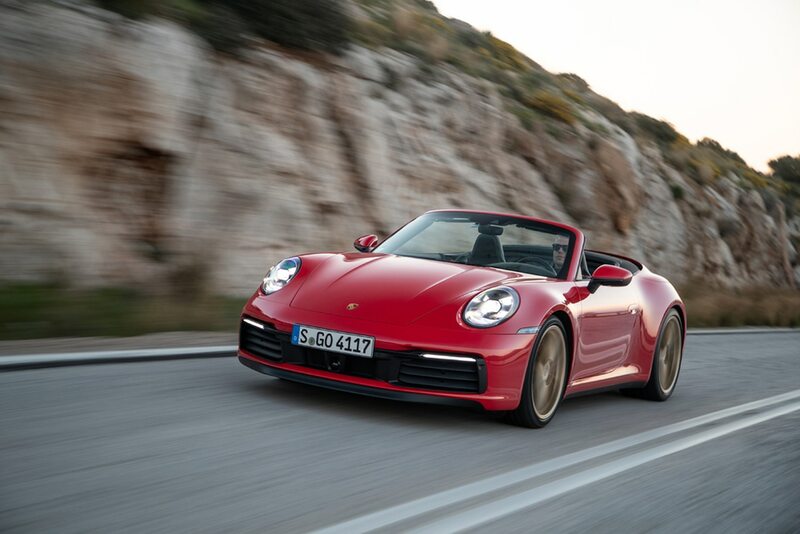 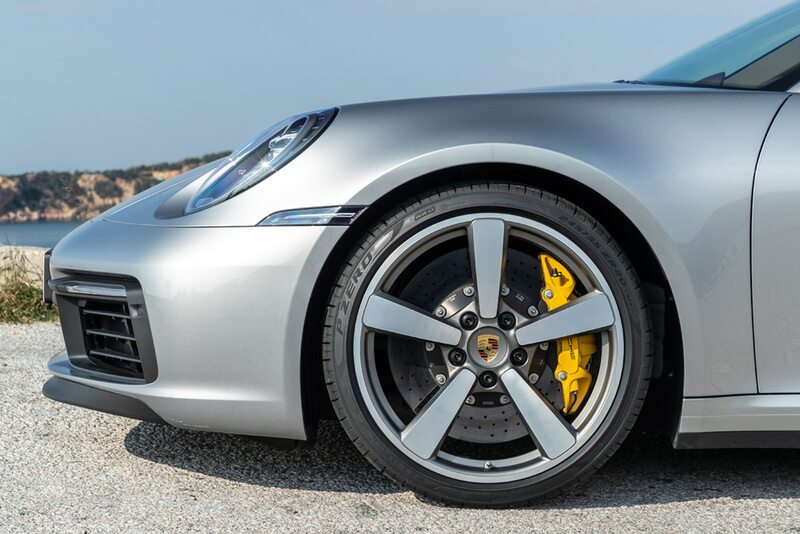 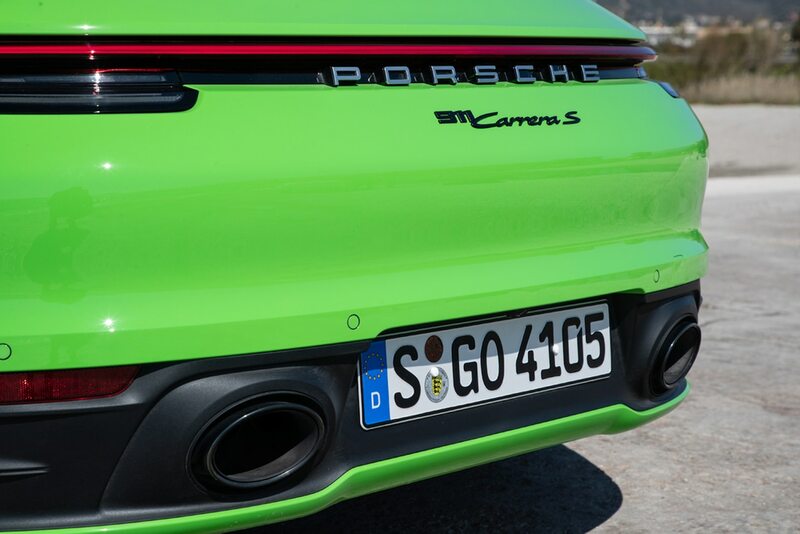 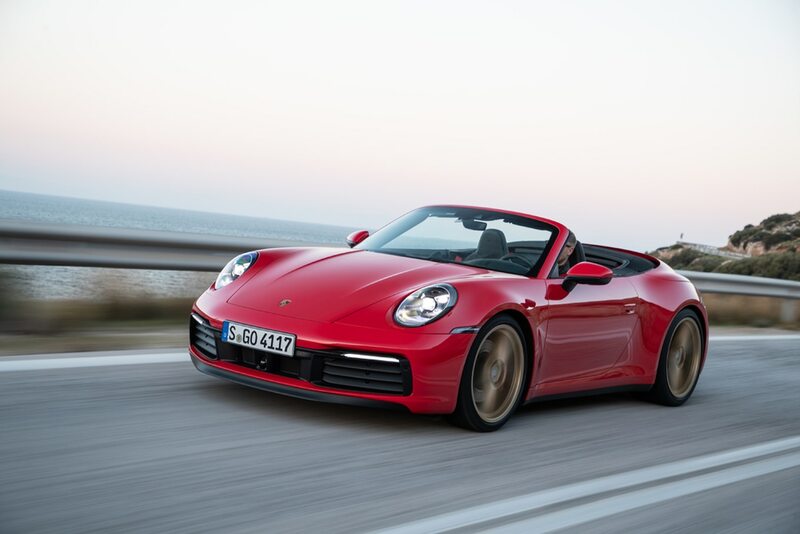 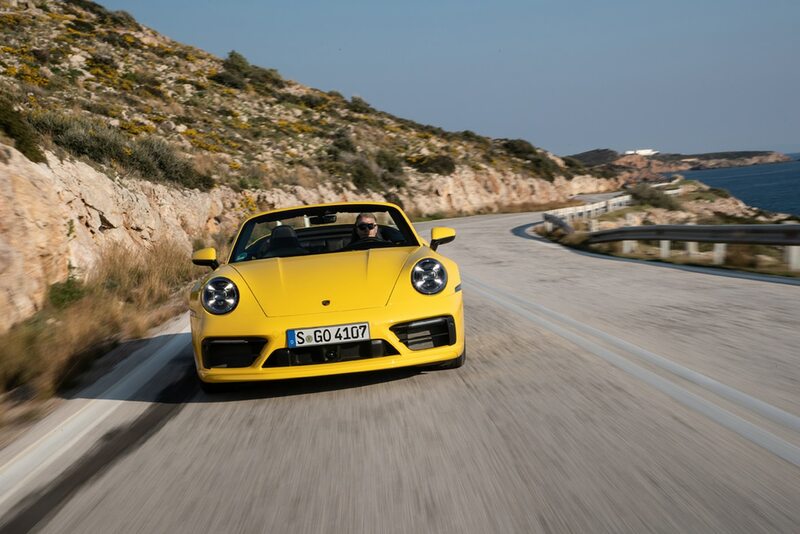 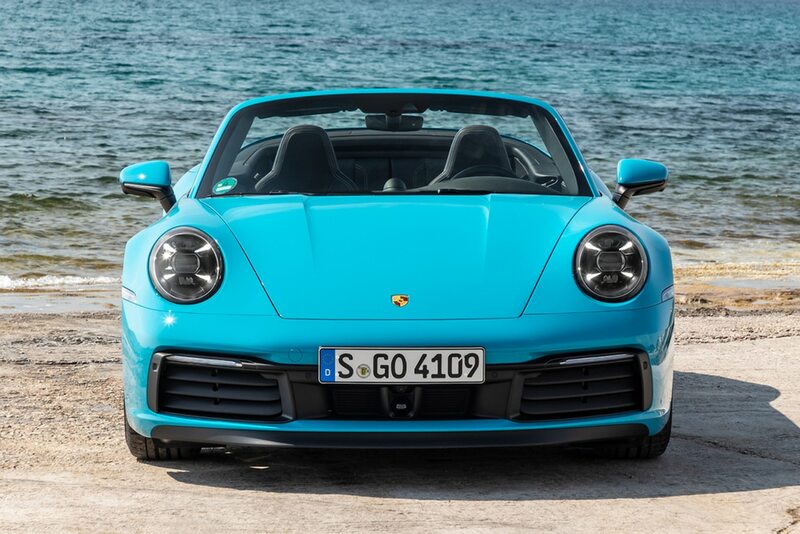 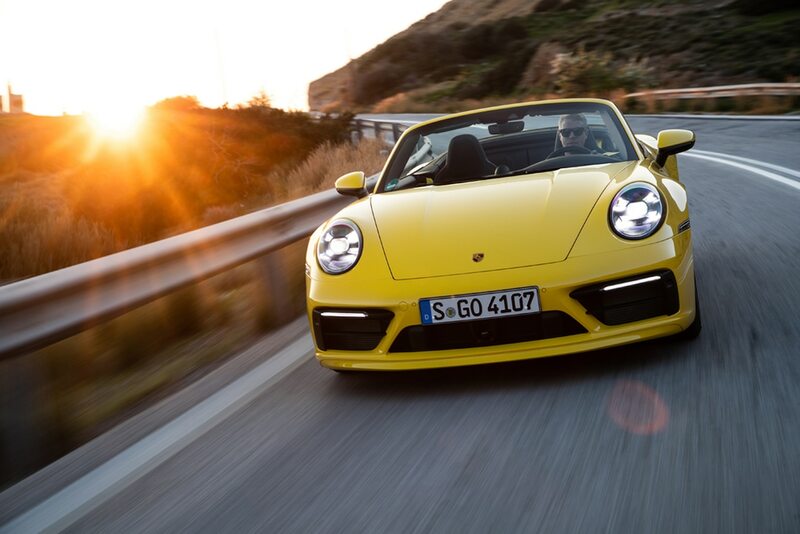 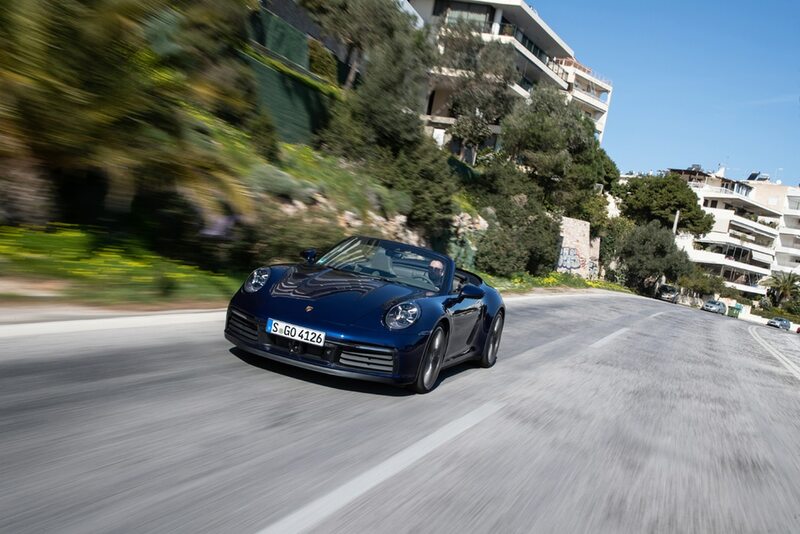 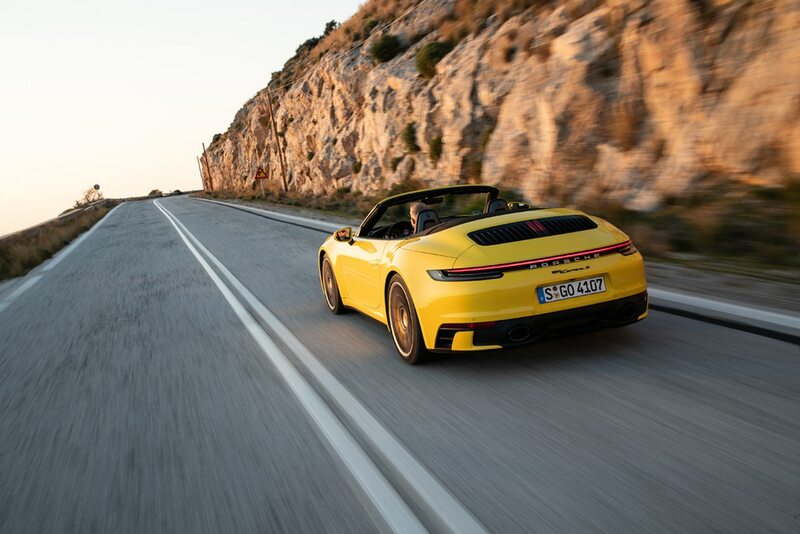 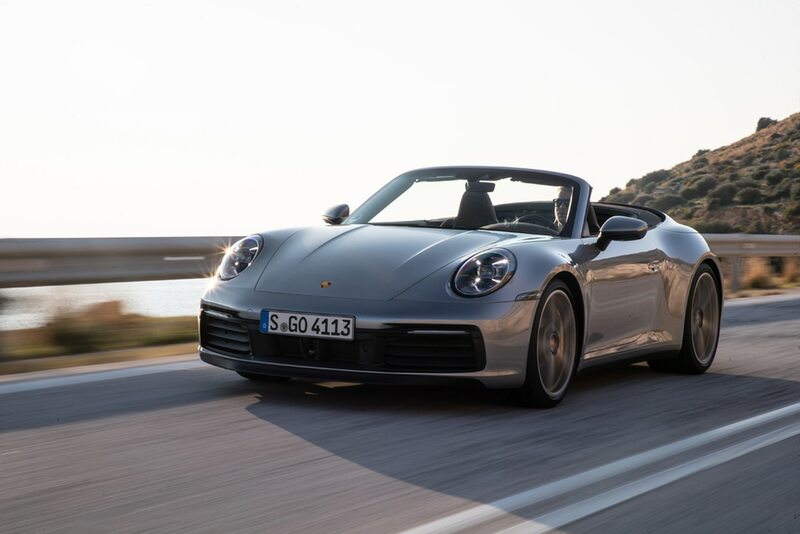 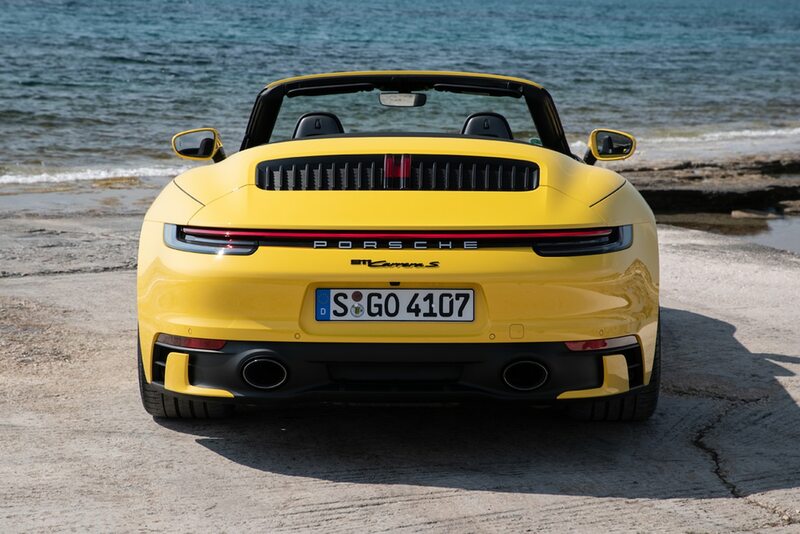 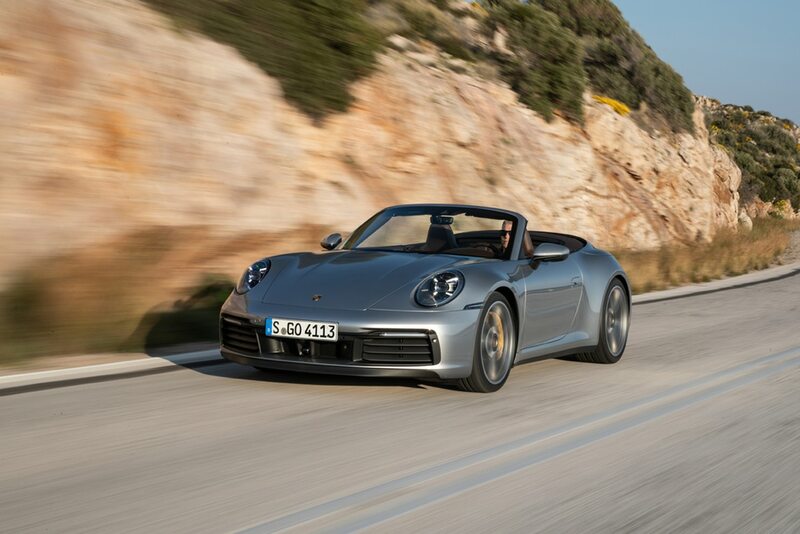 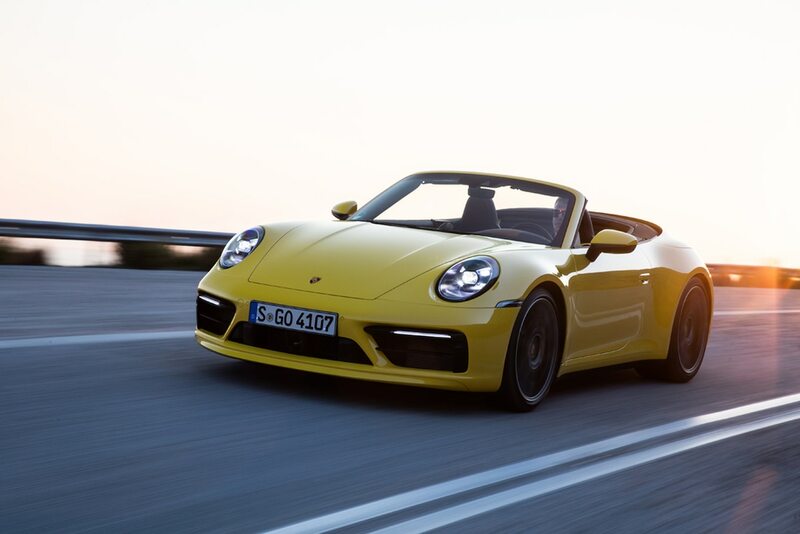 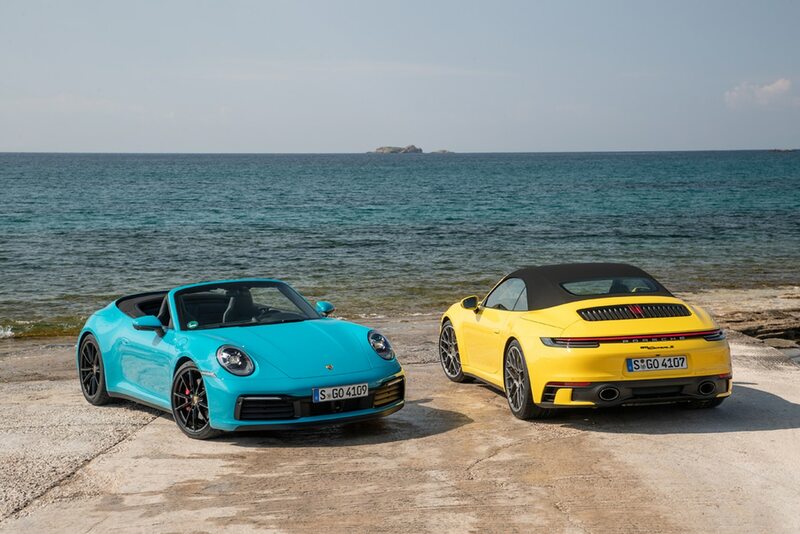 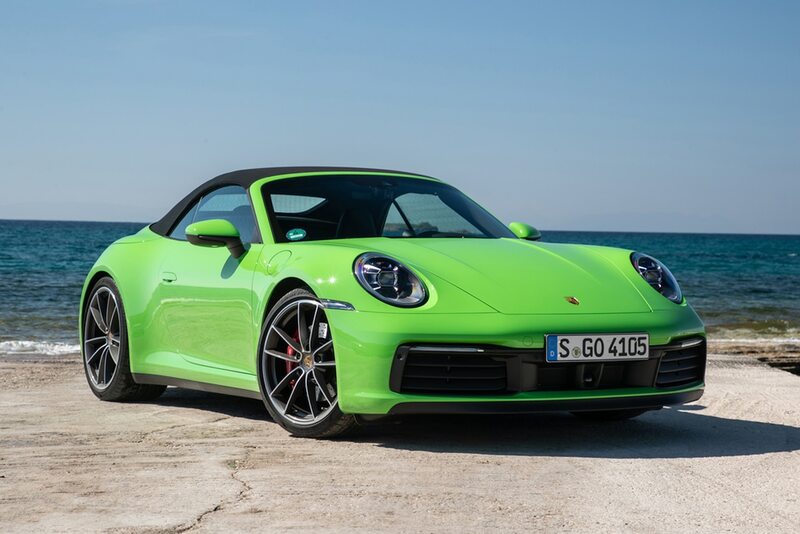 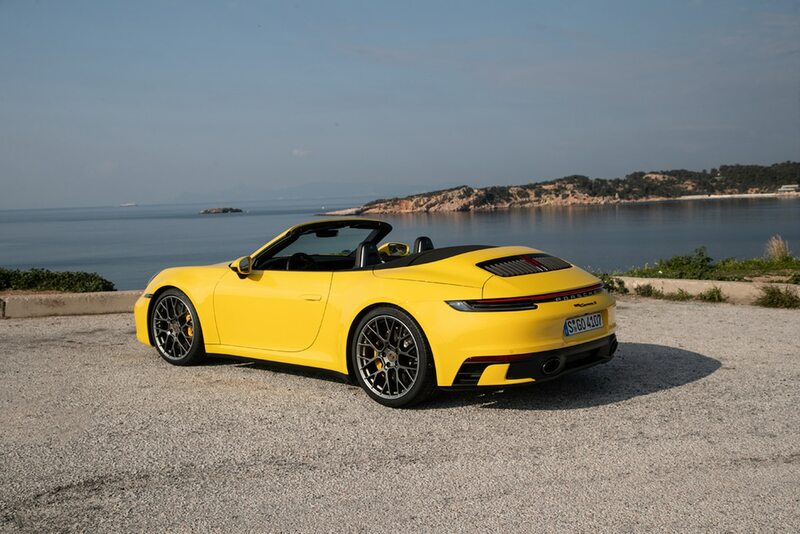 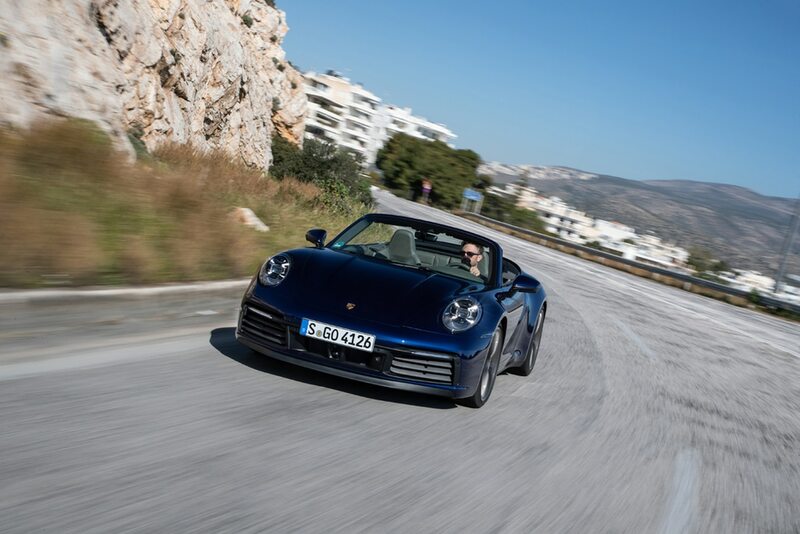 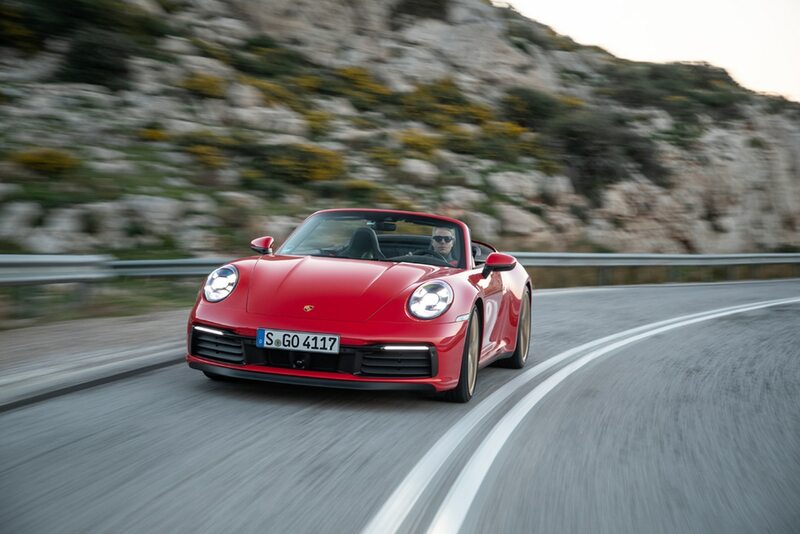 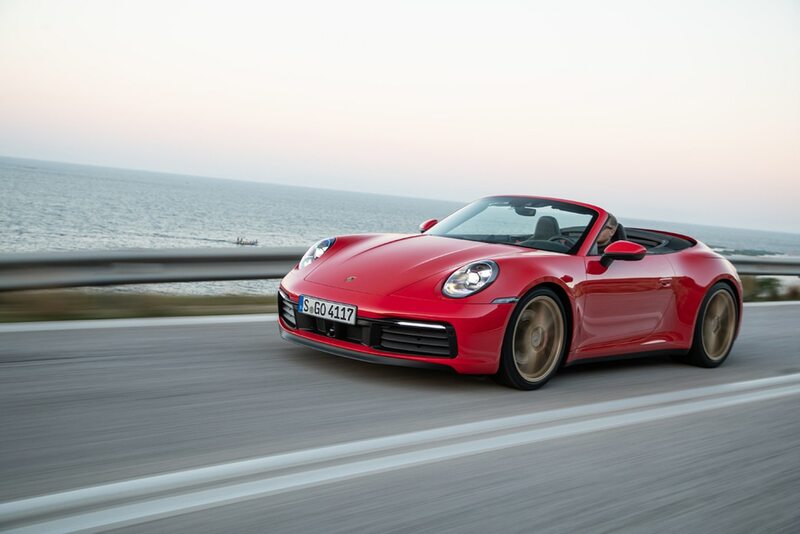 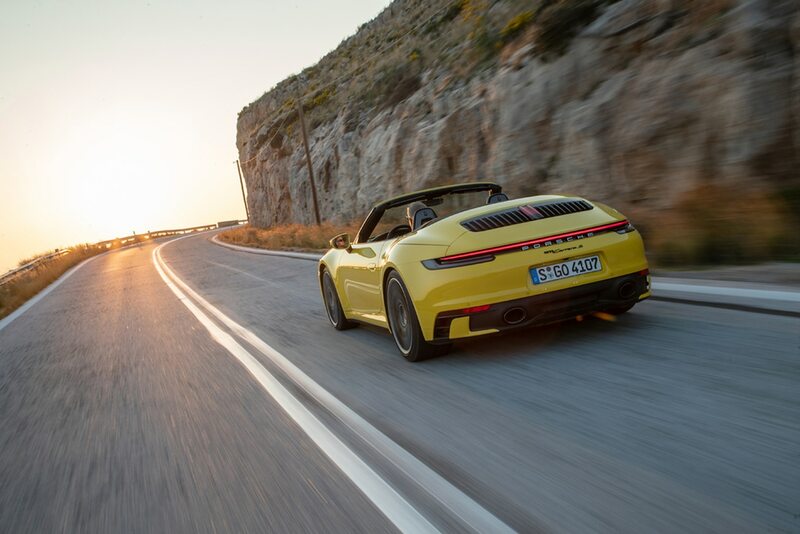 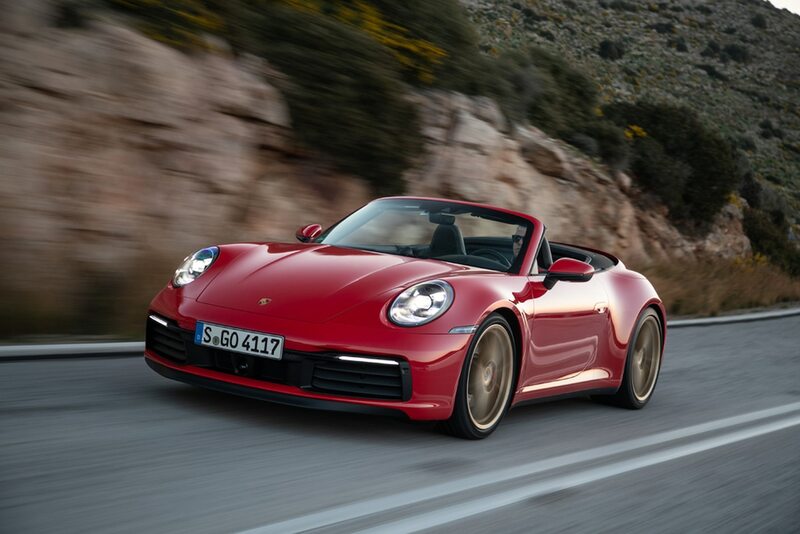 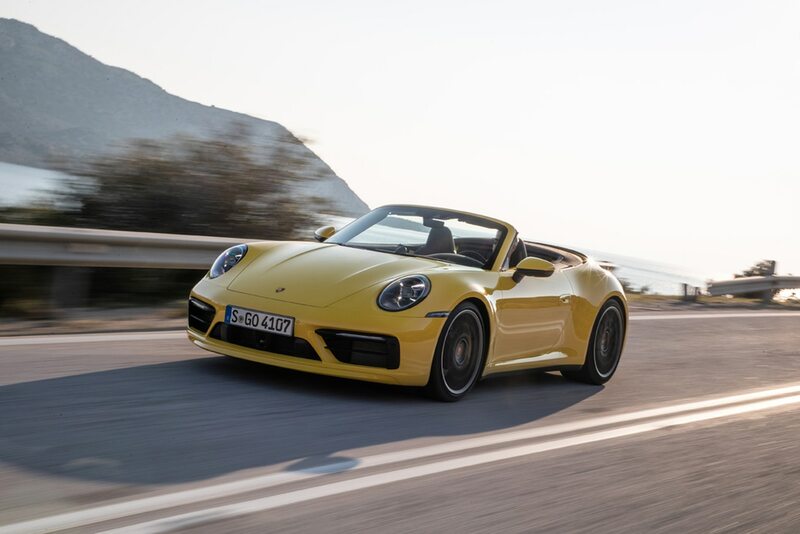 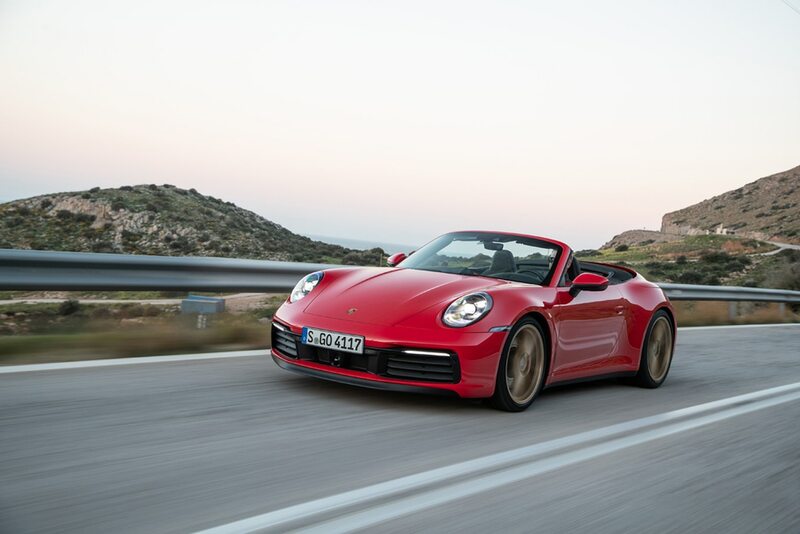 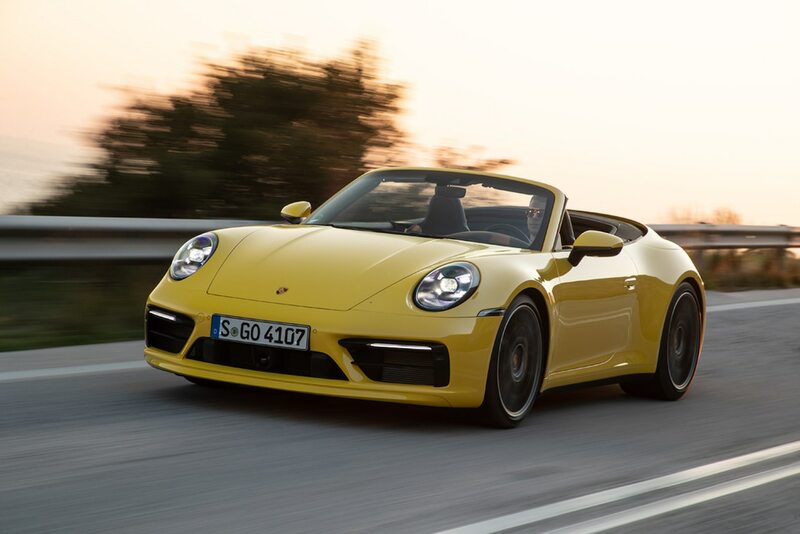 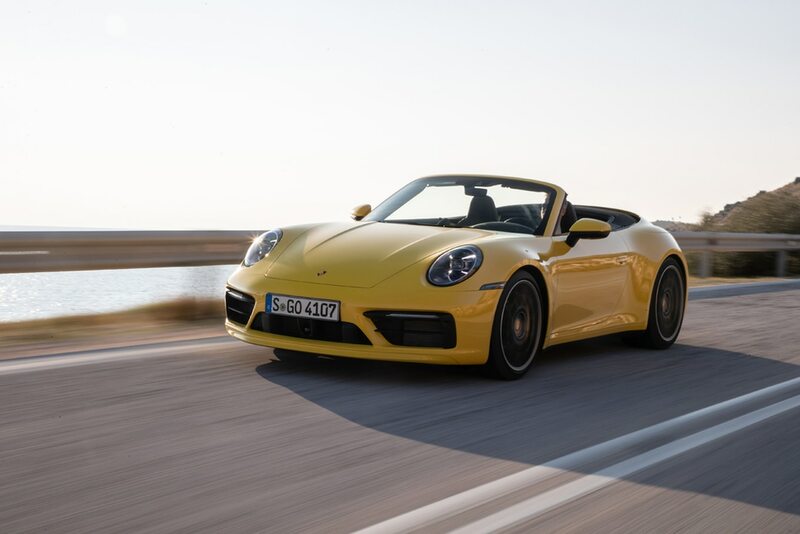 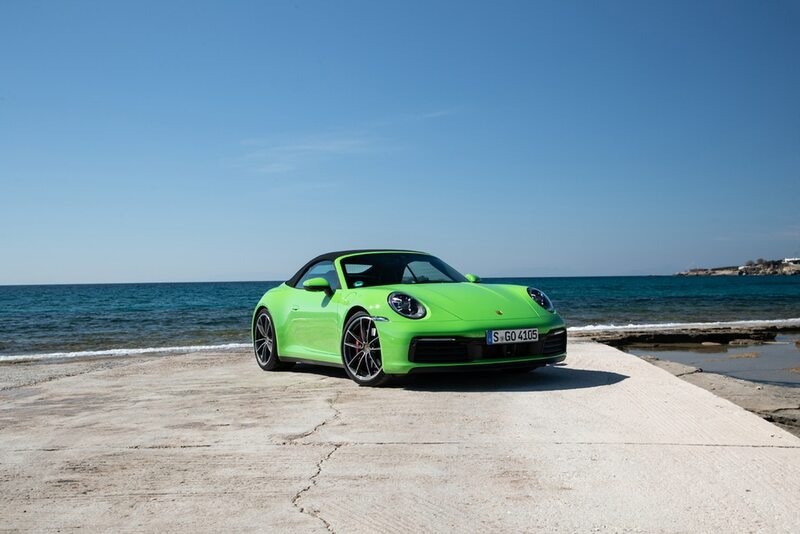 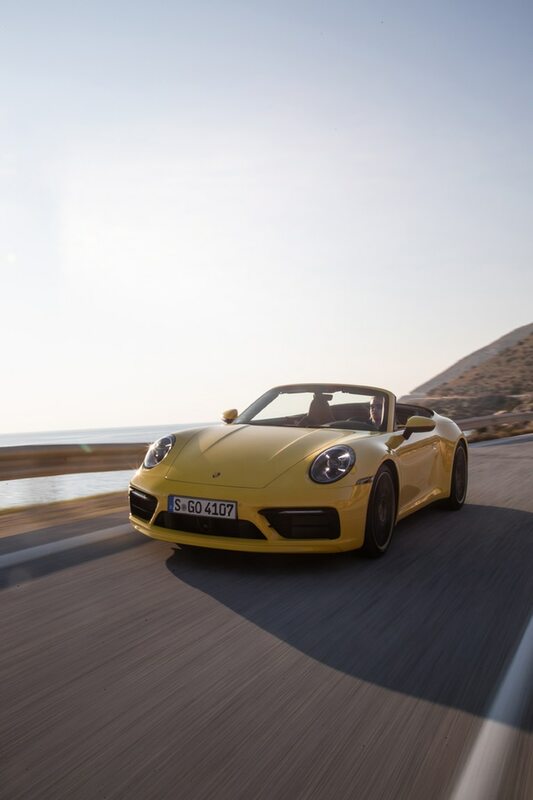 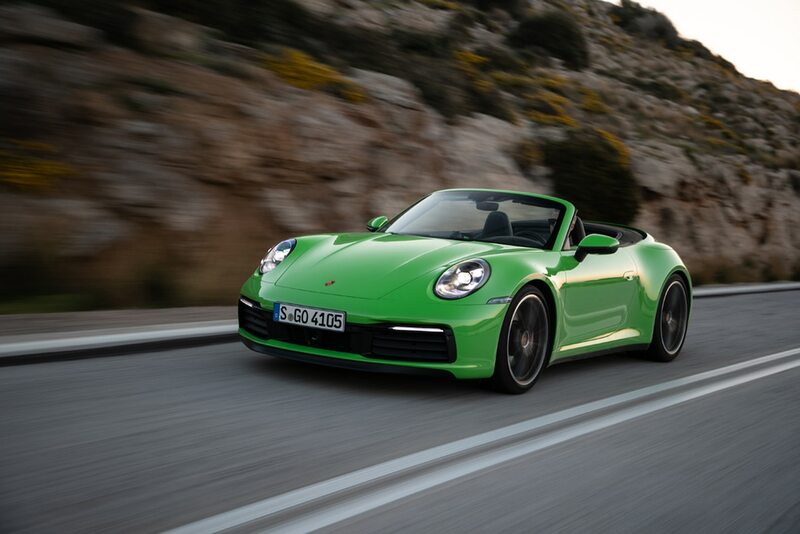 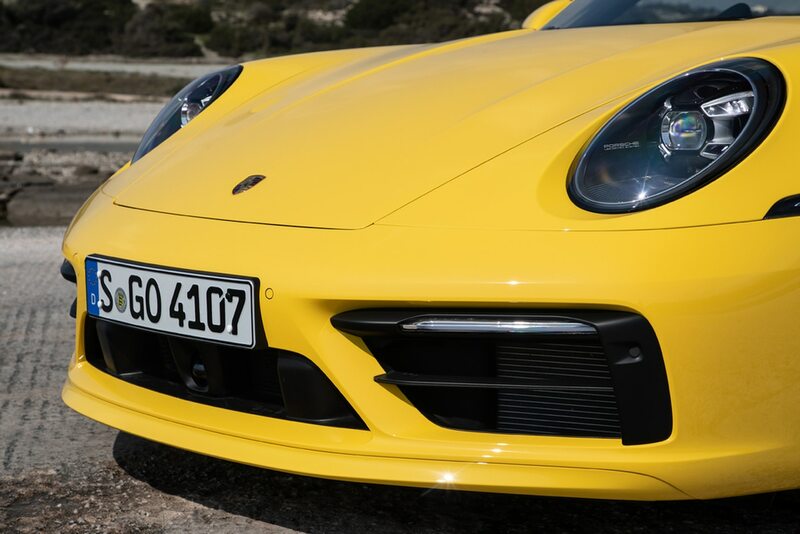 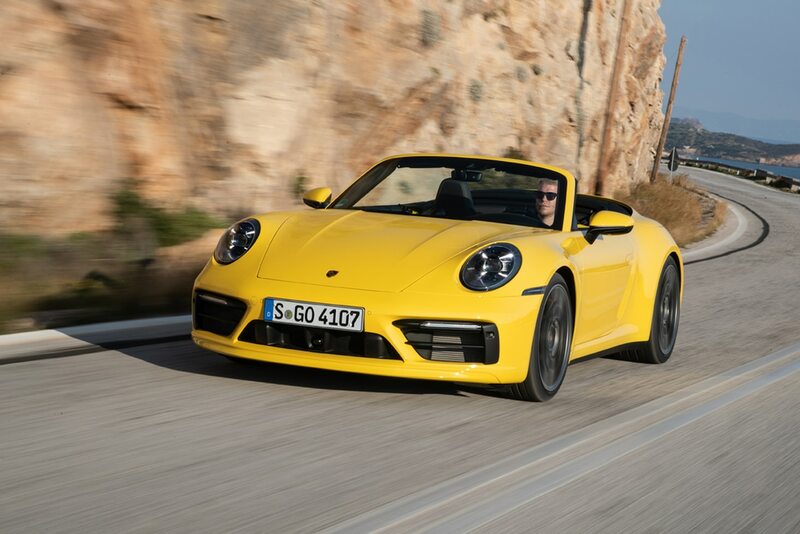 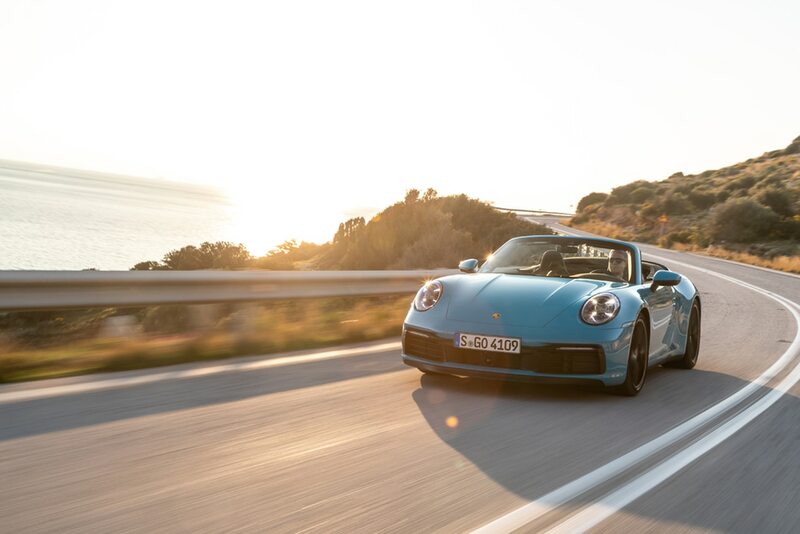 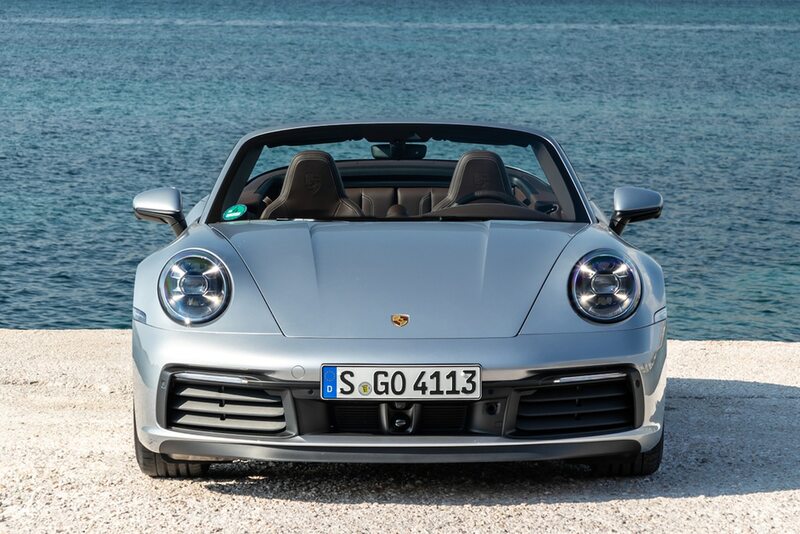 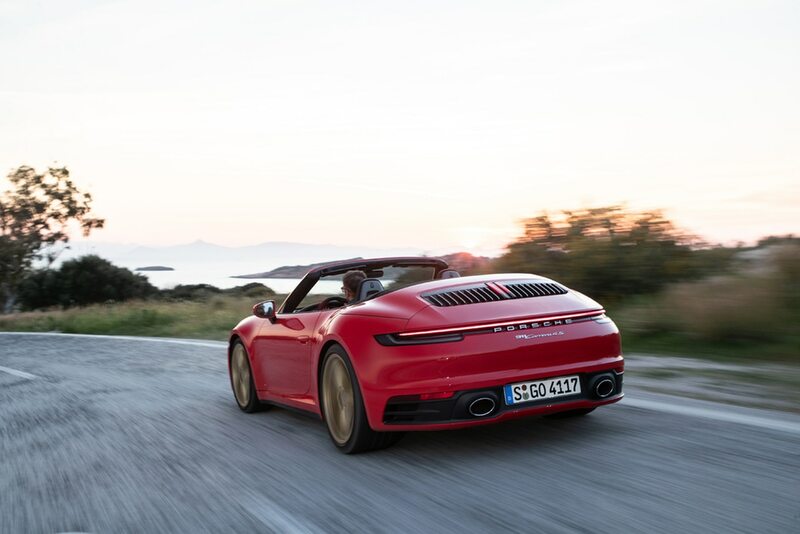 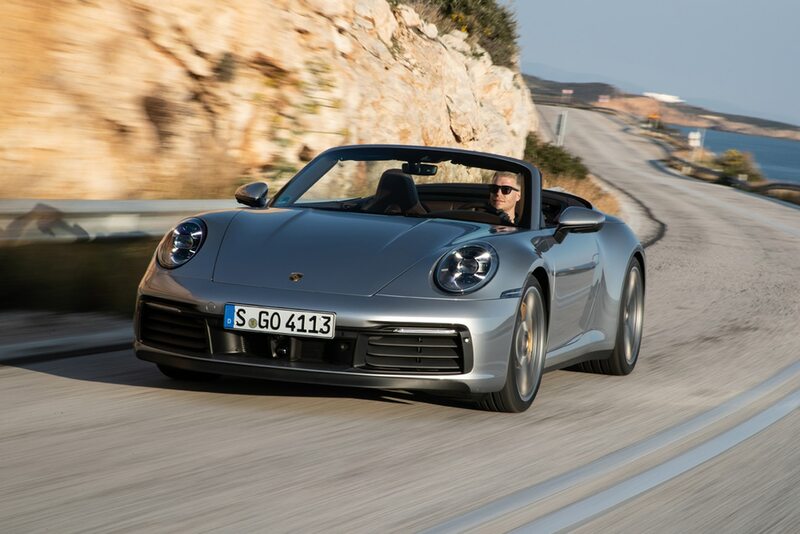 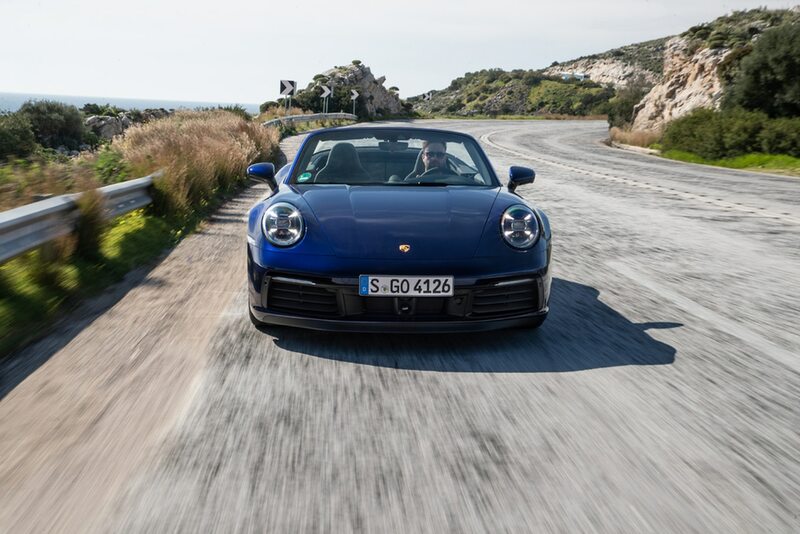 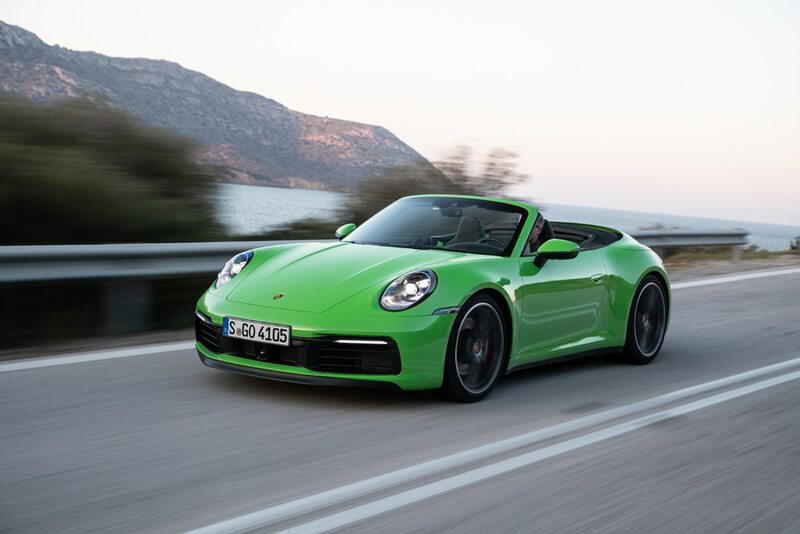 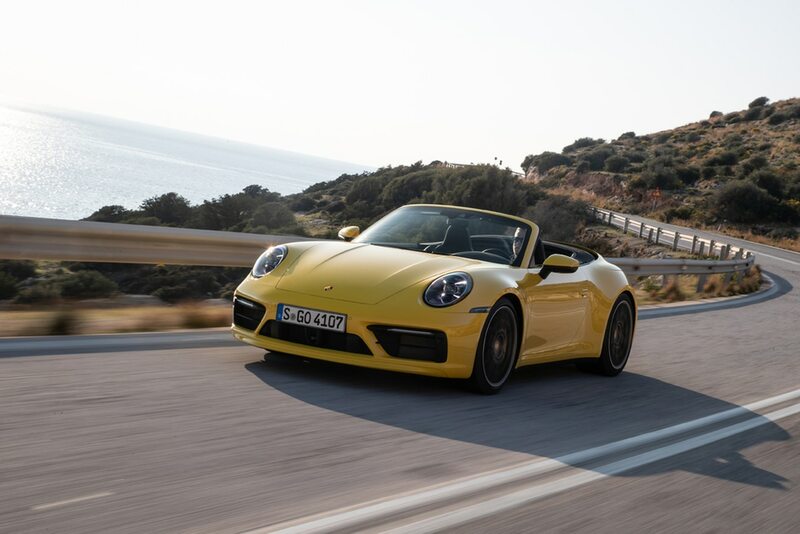 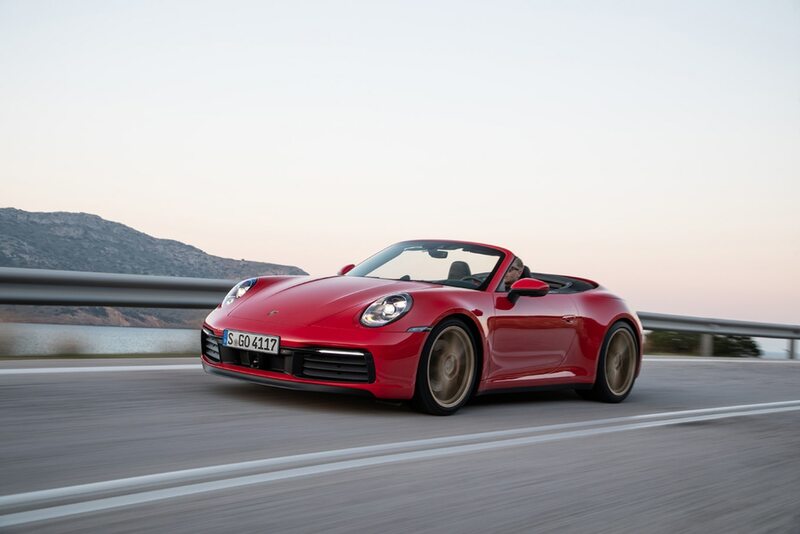 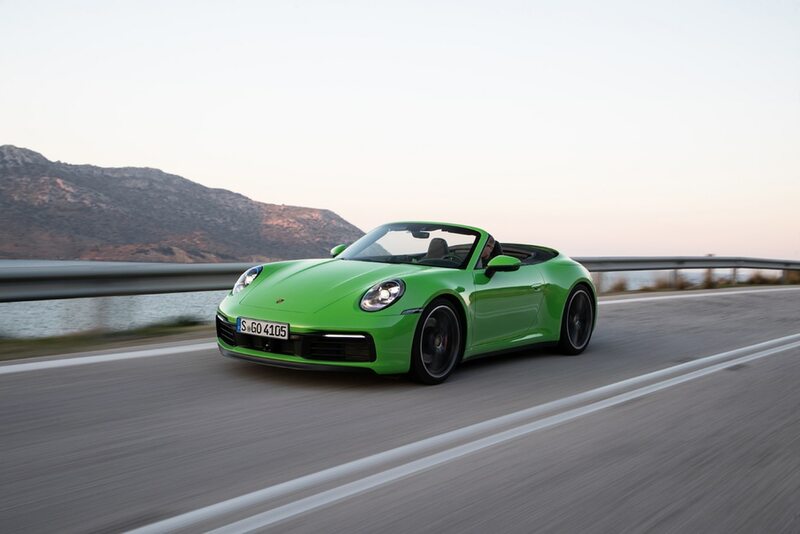 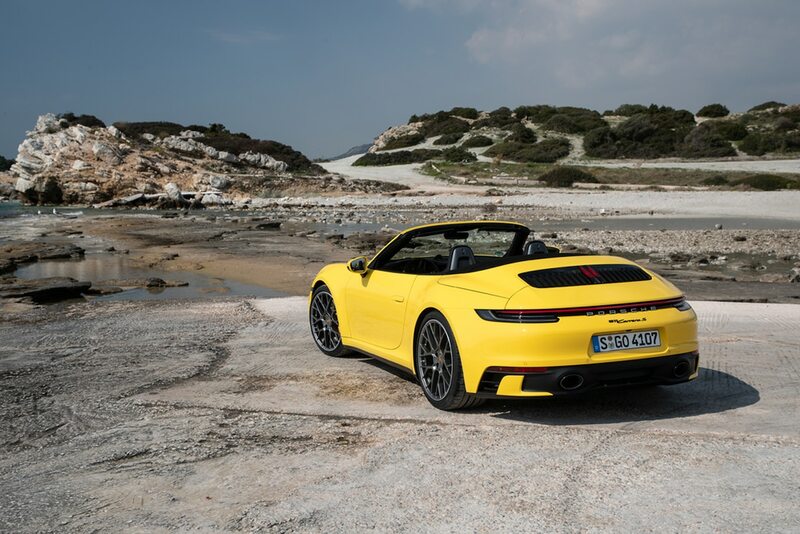 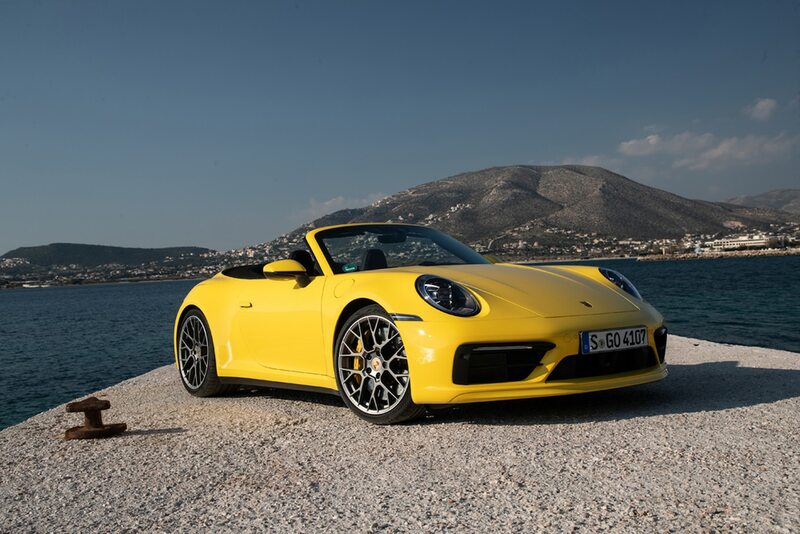 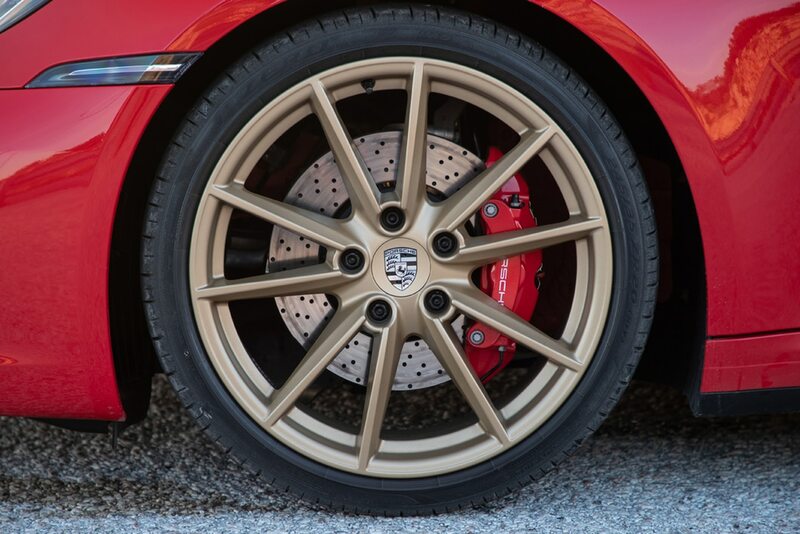 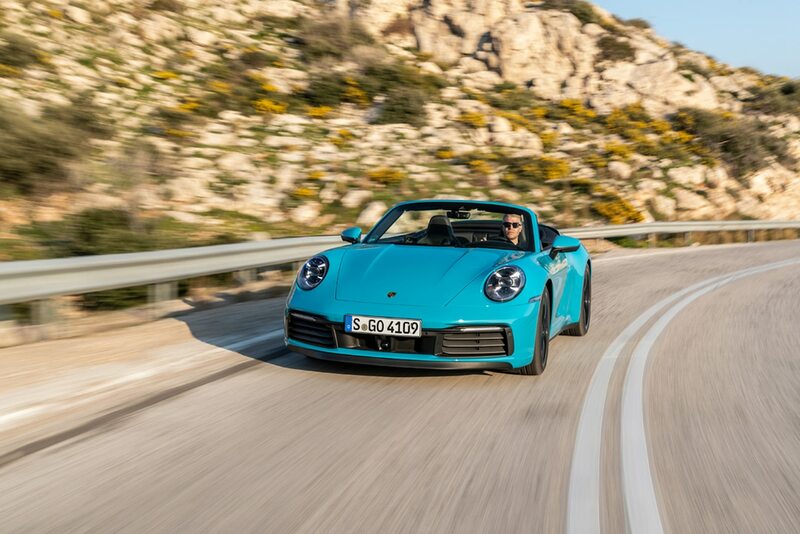 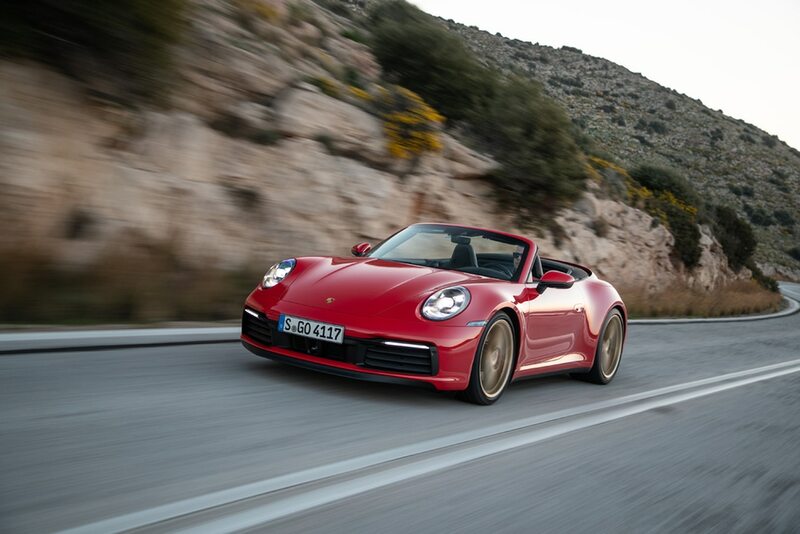 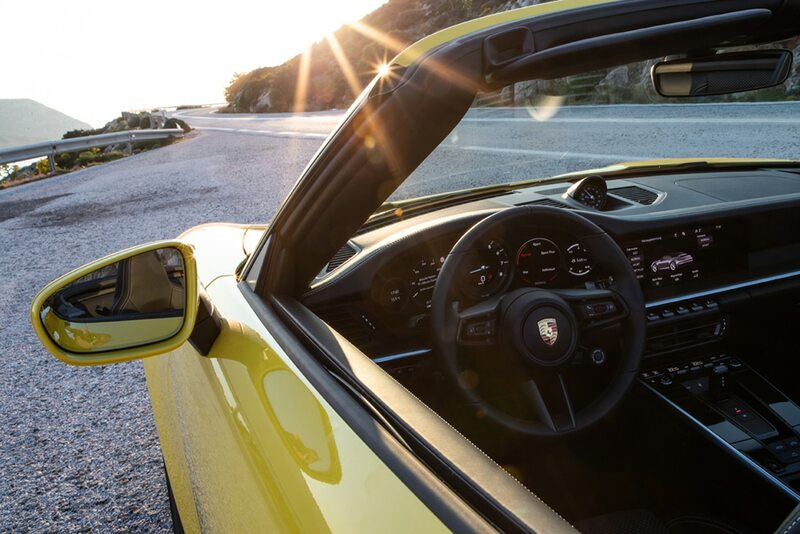 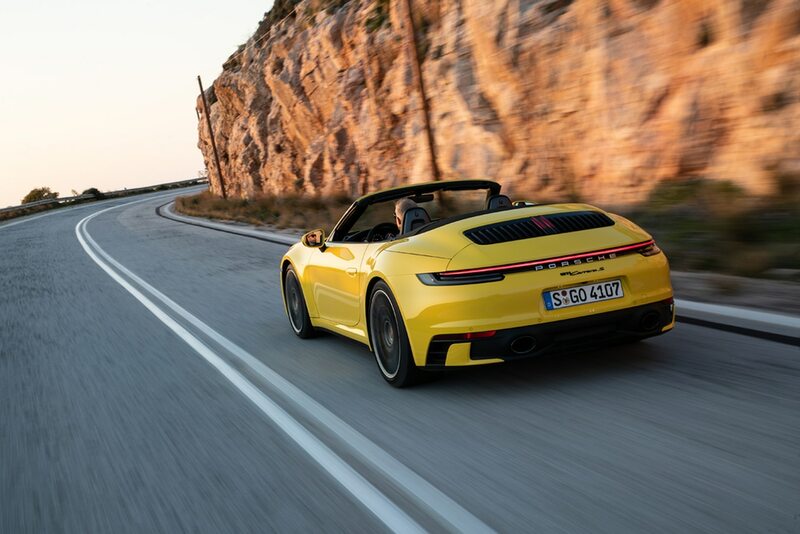 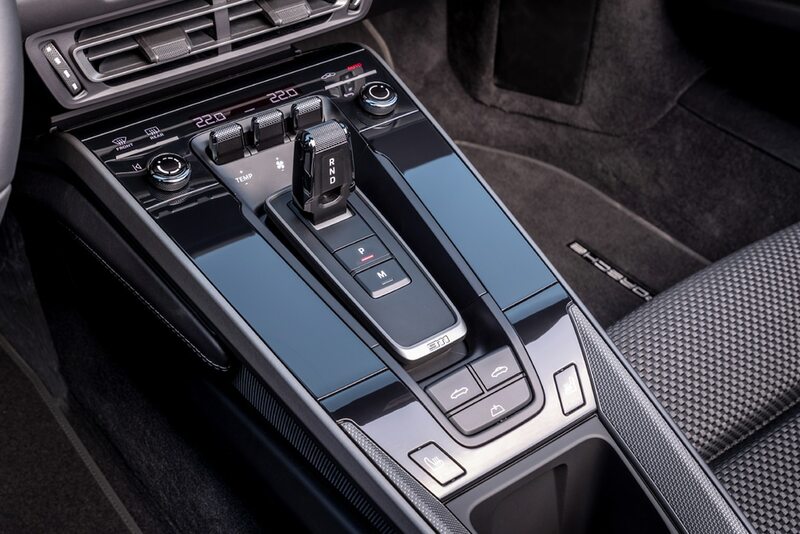 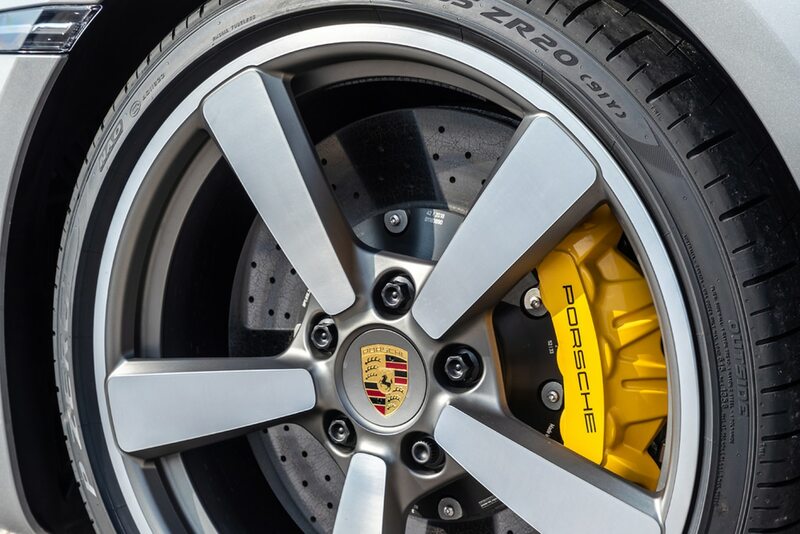 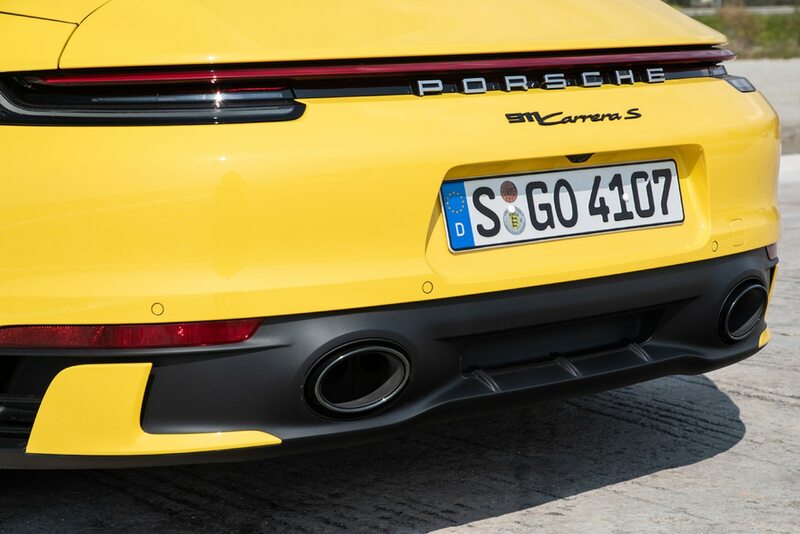 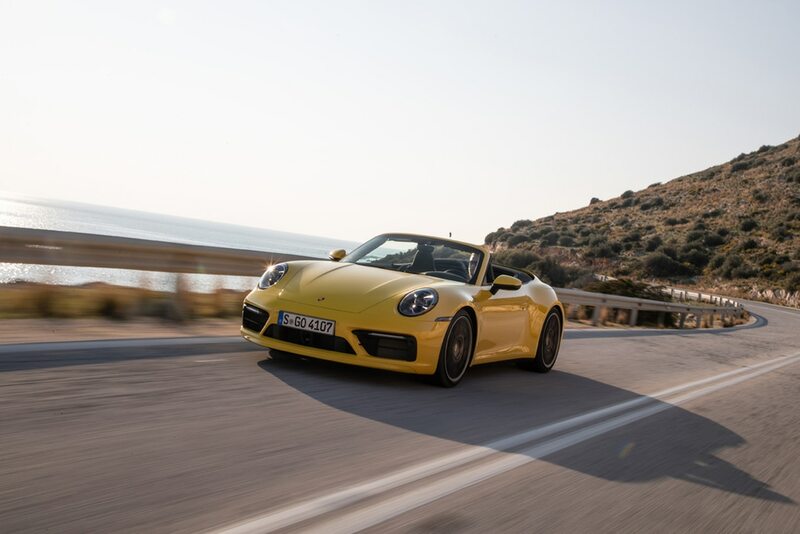 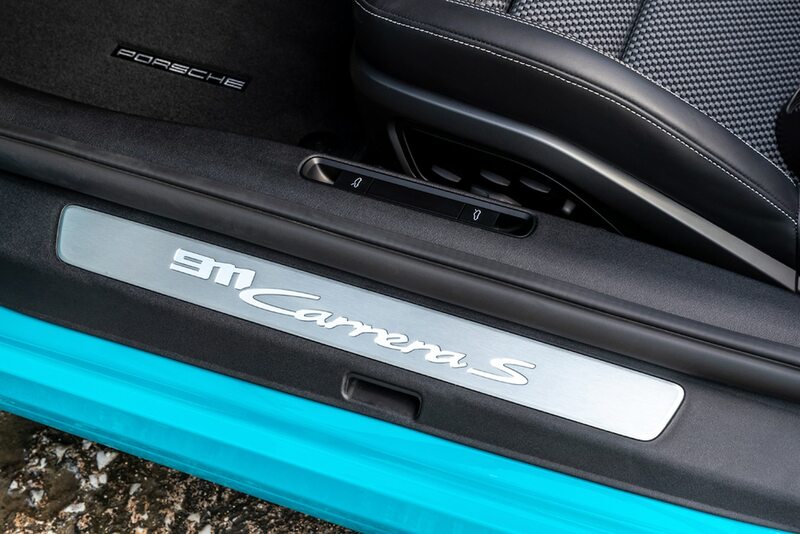 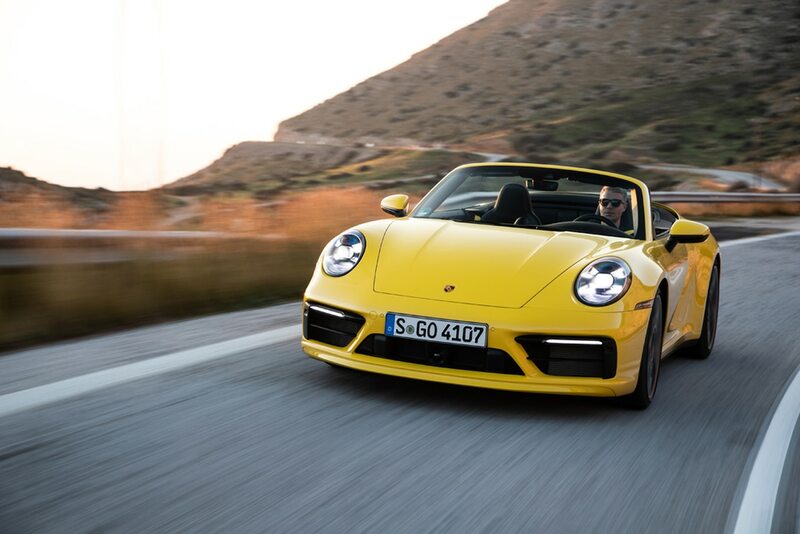 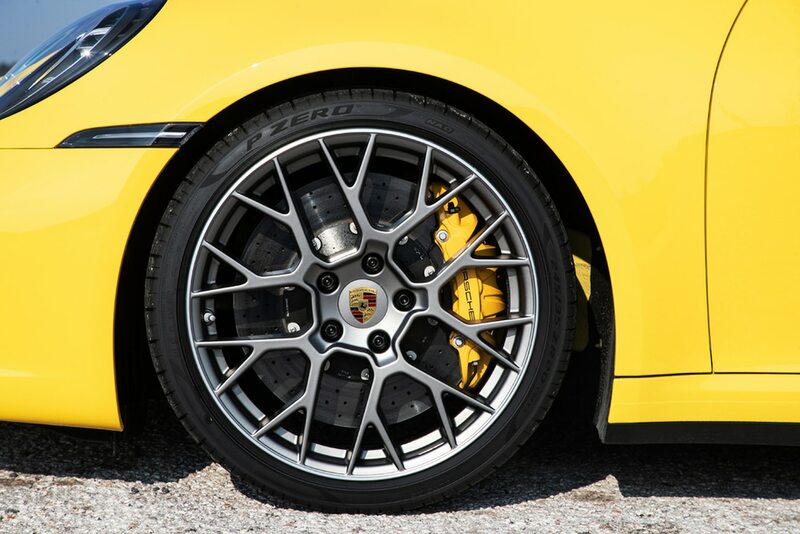 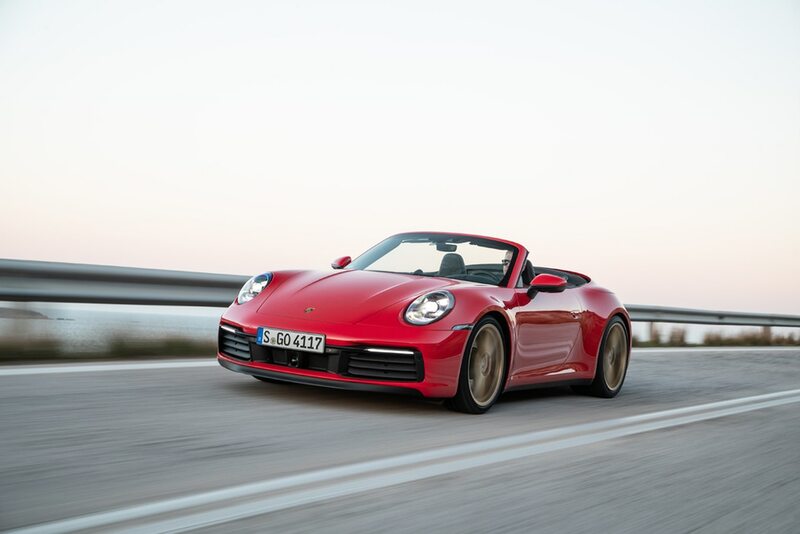 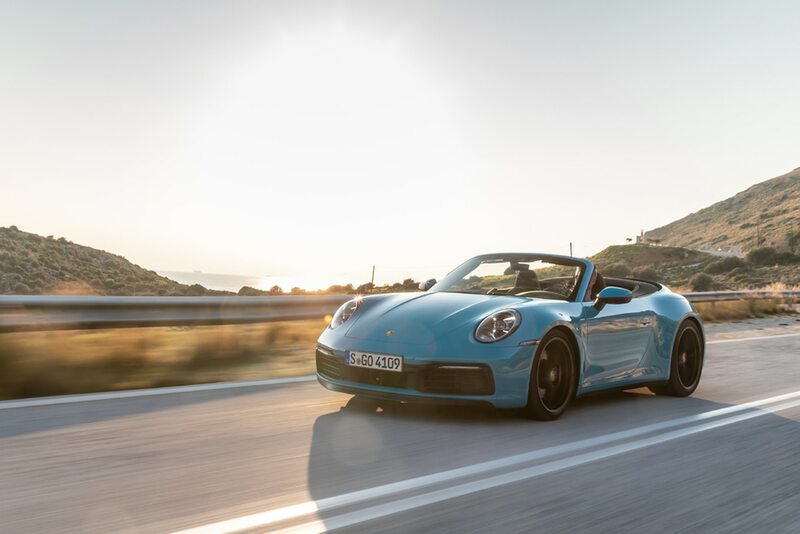 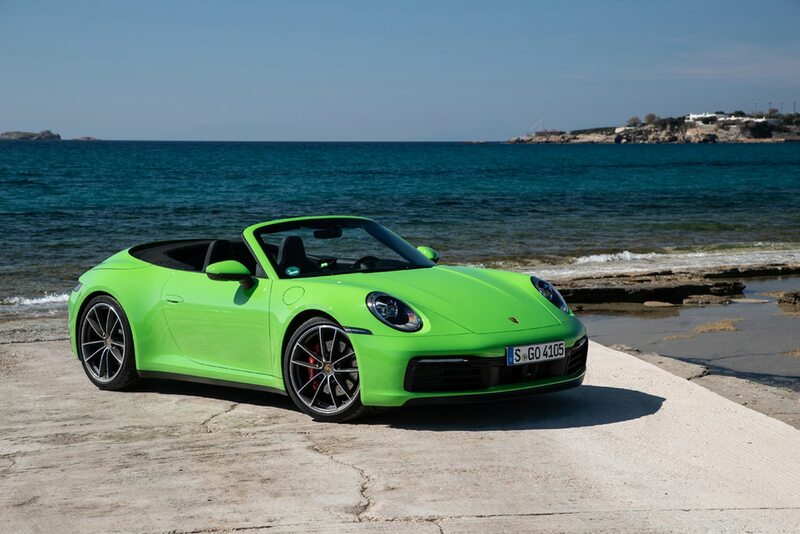 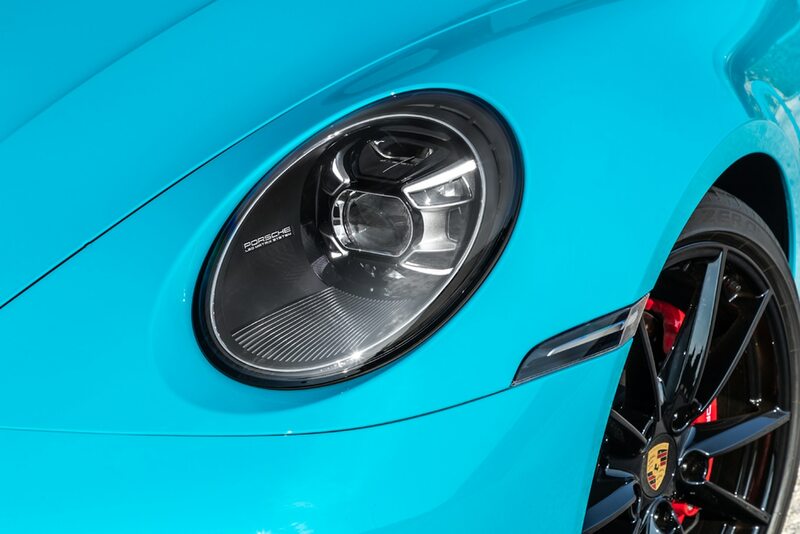 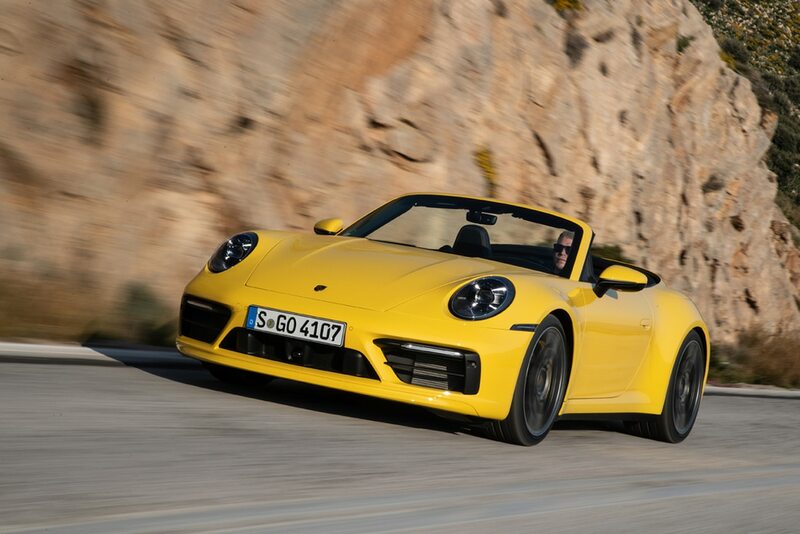 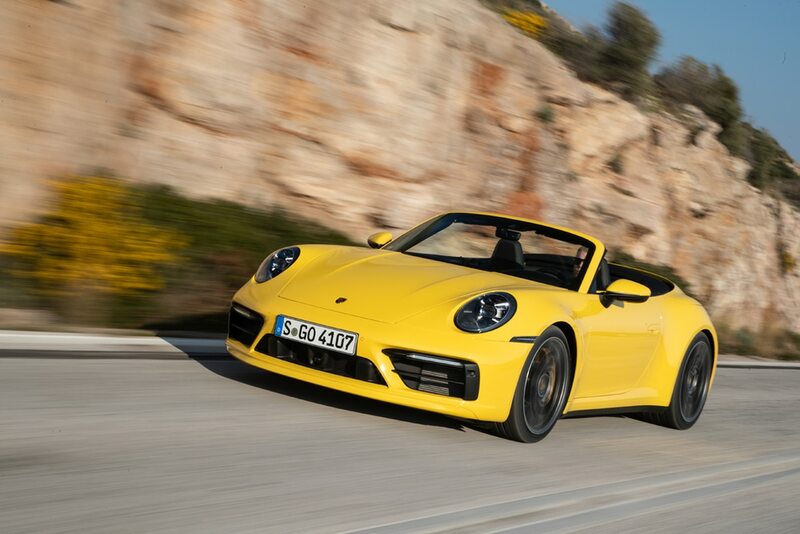 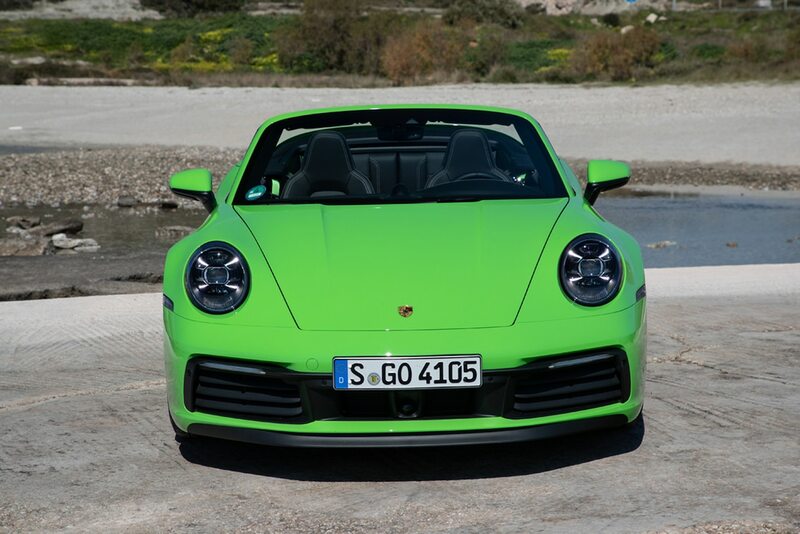 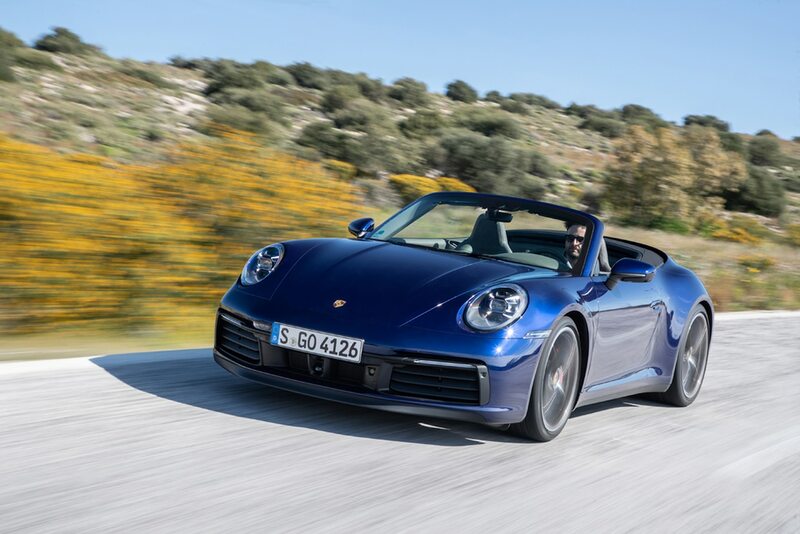 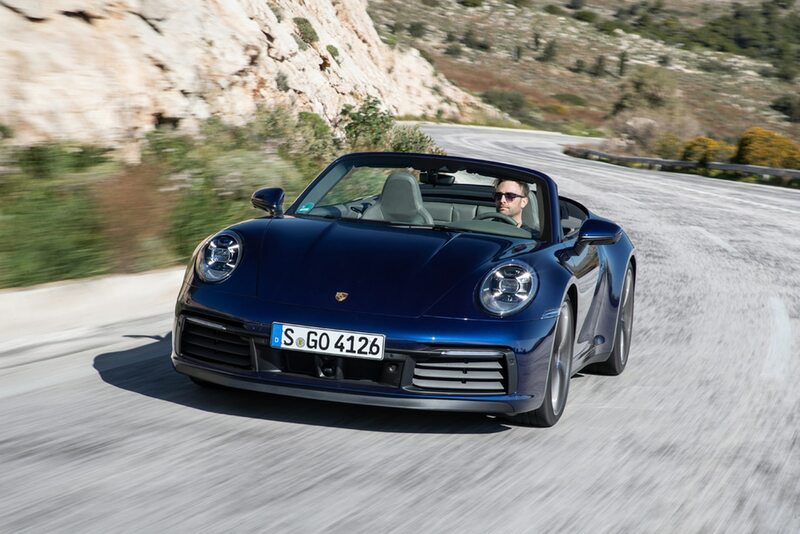 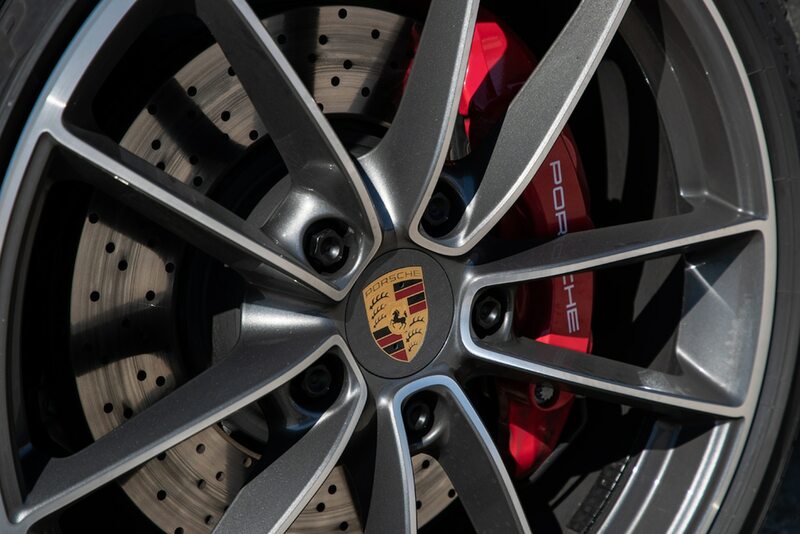 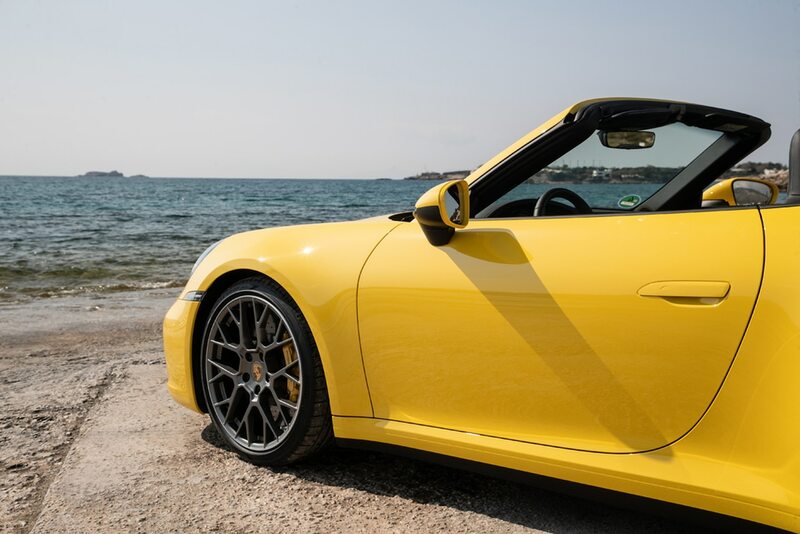 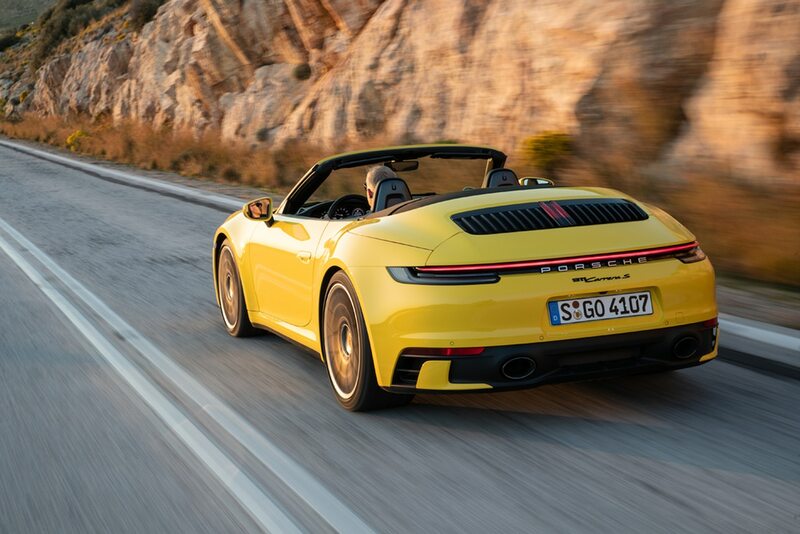 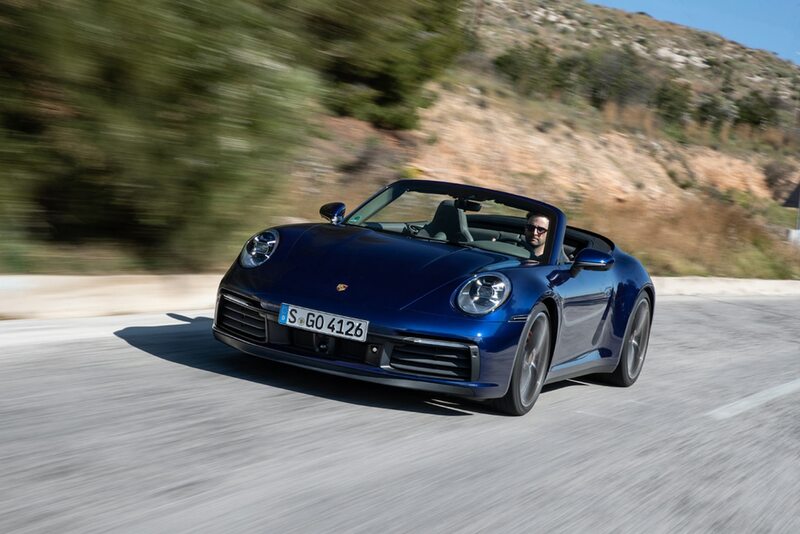 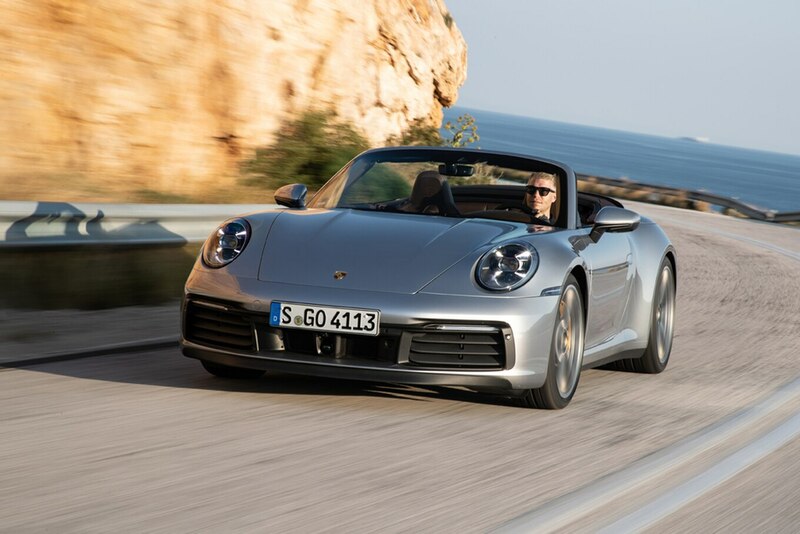 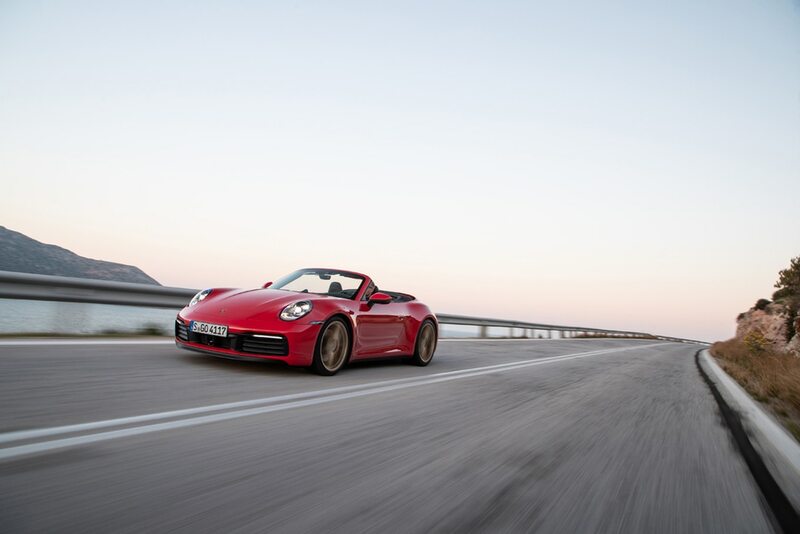 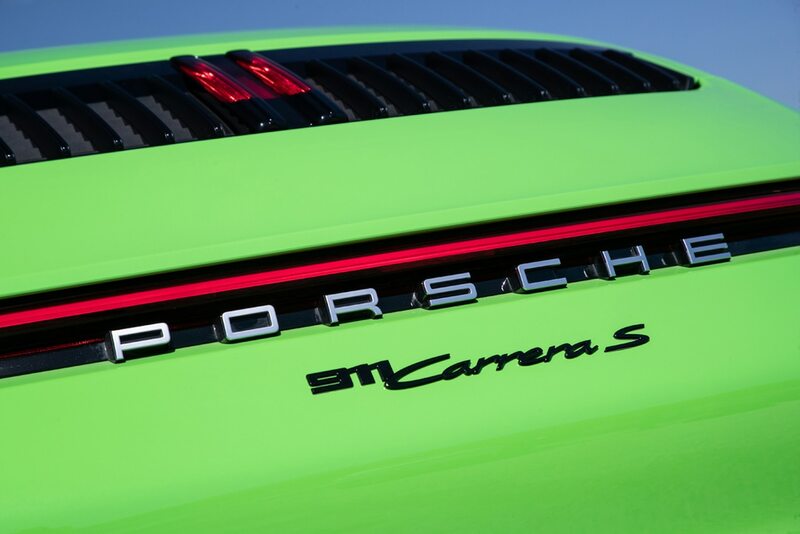 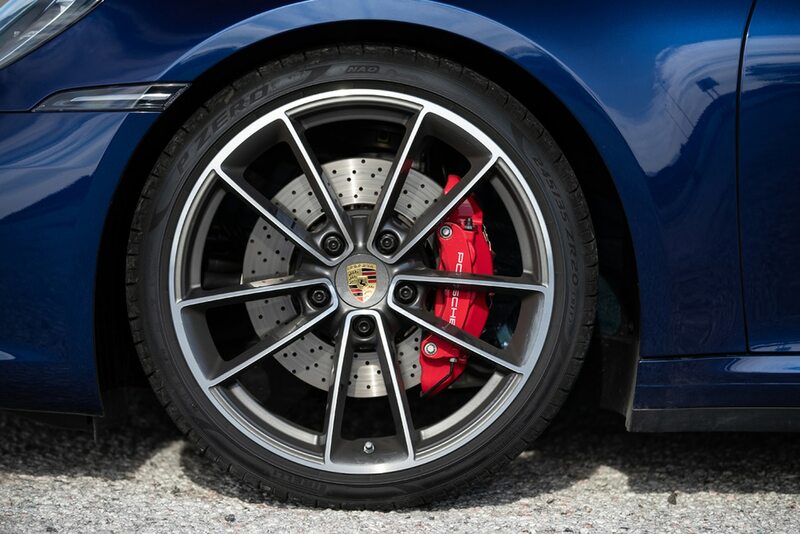 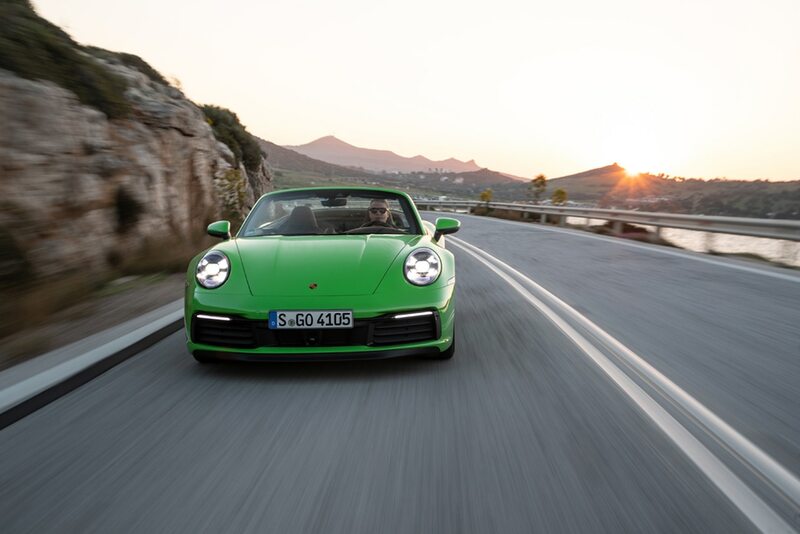 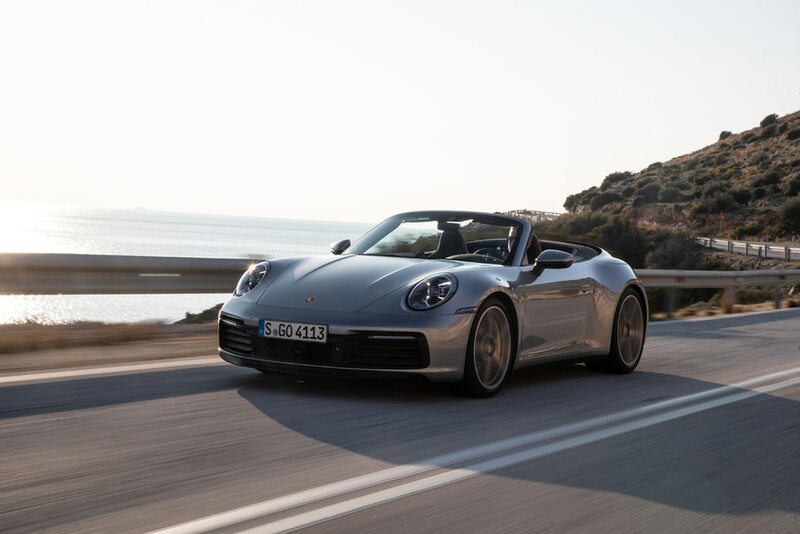 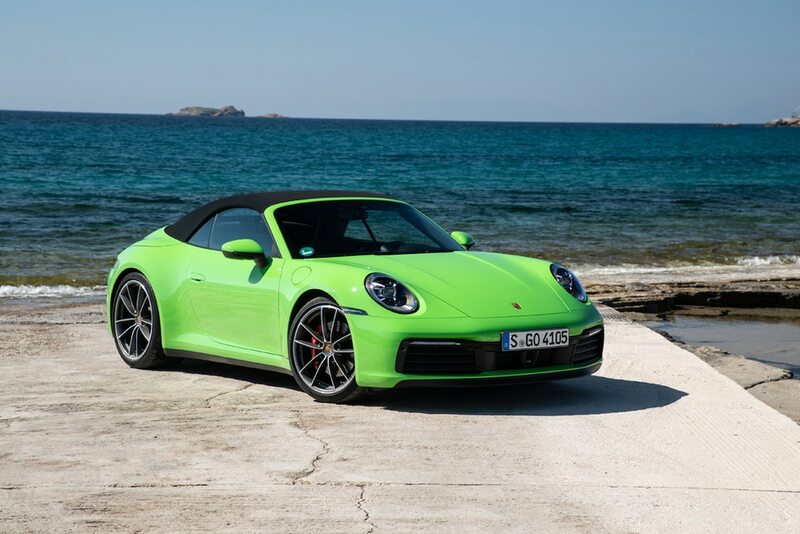 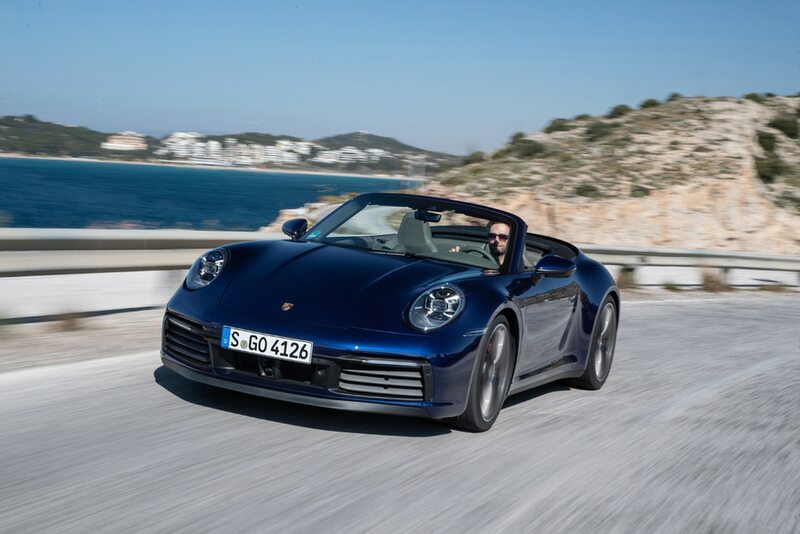 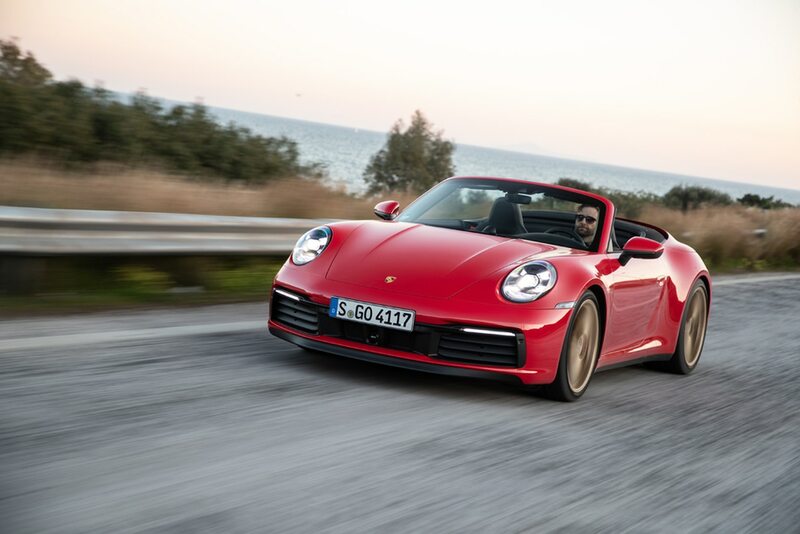 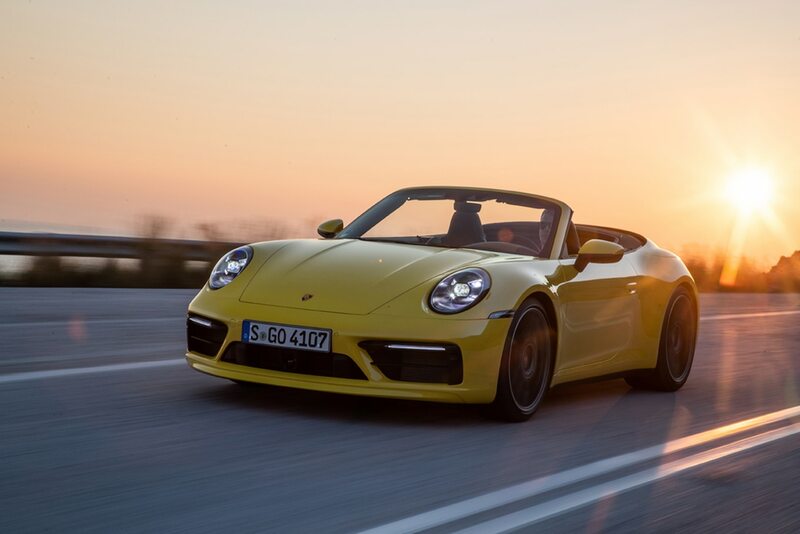 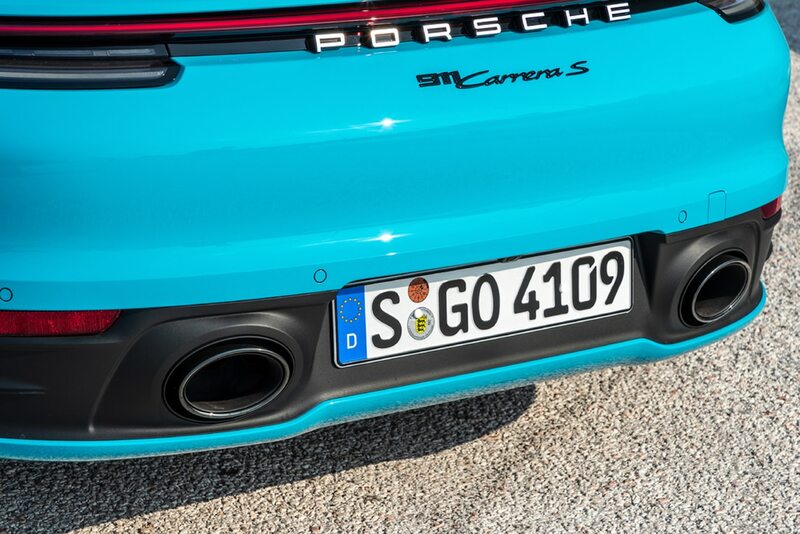 More good news: Somehow the engineers managed to improve the car’s dynamic torsional rigidity by about 10 percent—that margin sounds small, but when coupled with two other key suspension upgrades, it satisfied the team in Weissach that the Cabrio can now handle the optional PASM sport suspension (part of a $5,460 USD Sport package) that used to be reserved for coupes only. 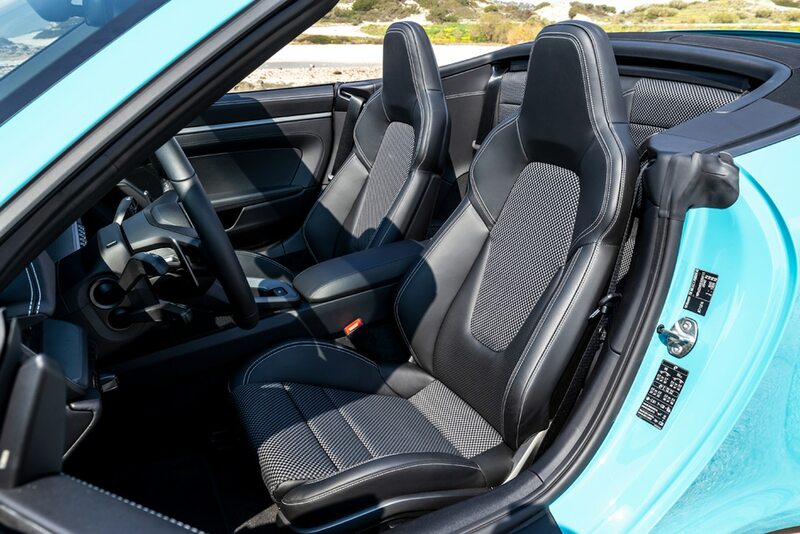 For 2020 it stiffens the springs and anti-roll bars, and it lowers the car by 0.4 inch. 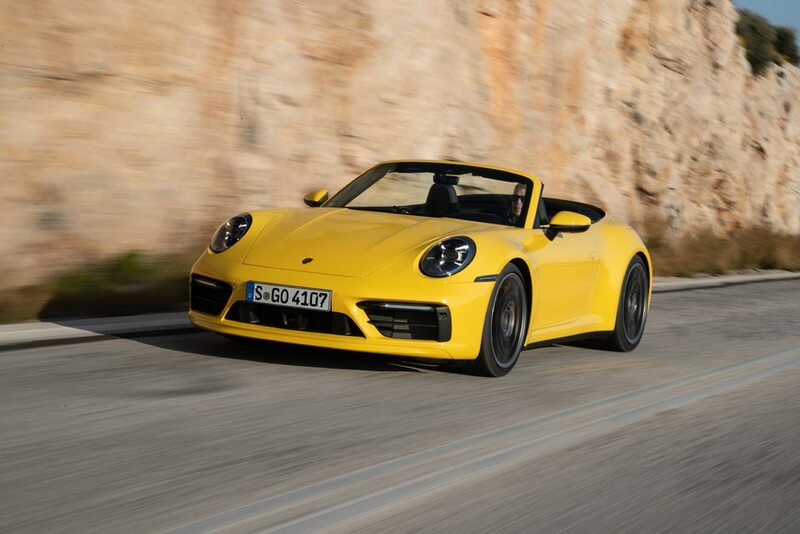 Those other key upgrades: Next-gen Bilstein adaptive dampers can now be fine-tuned midstroke on the millisecond level; the old ones could only change their damping rate at the top or bottom of a stroke event. 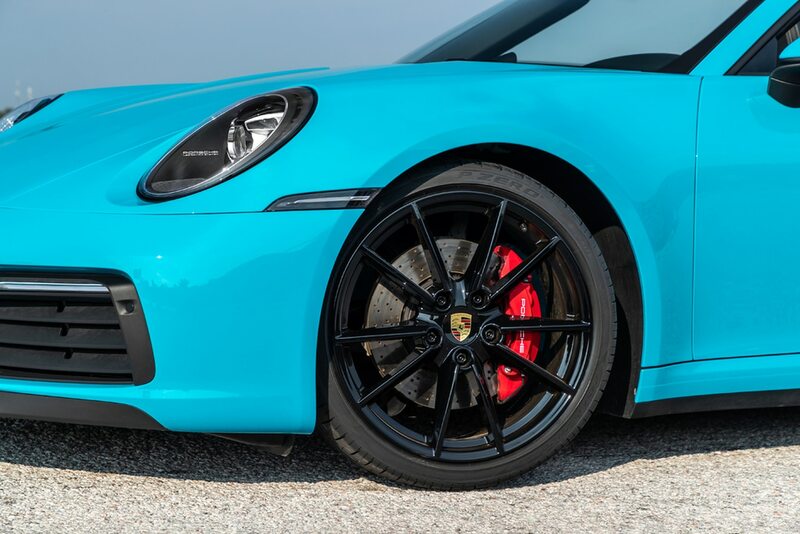 New staggered 20-/21-inch wheels wearing 245/35 and 305/30 tires and wider front and rear track widths (1.8 inches in front and 1.4 inches in the back) allow the springs to be located slightly farther outboard, increasing their “leverage” on the car to inherently reduce roll. 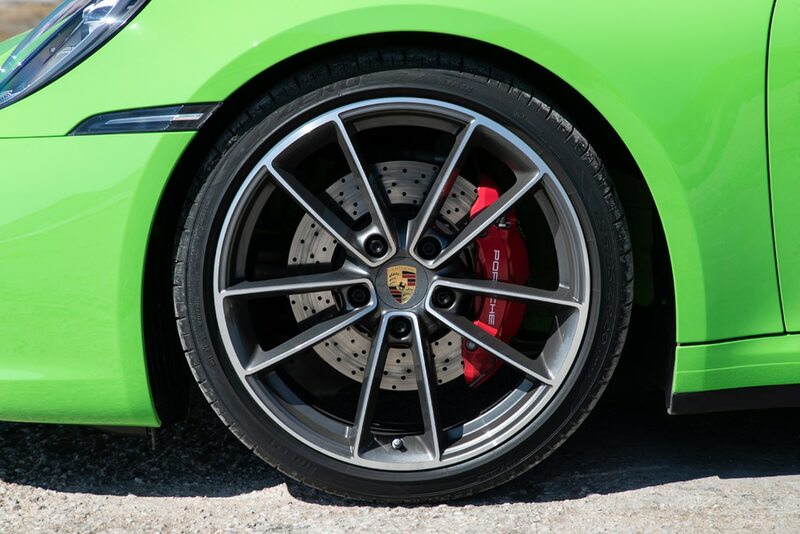 The shock upgrade does wonders for improving both handling responsiveness and ride comfort. 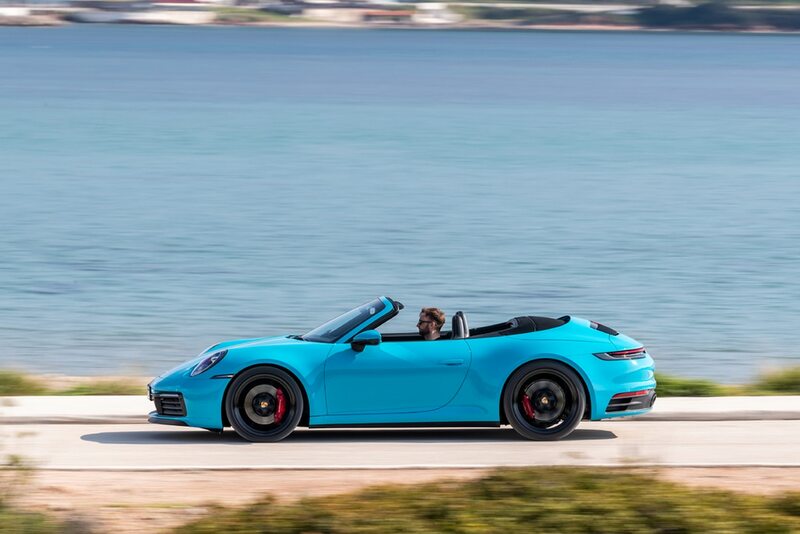 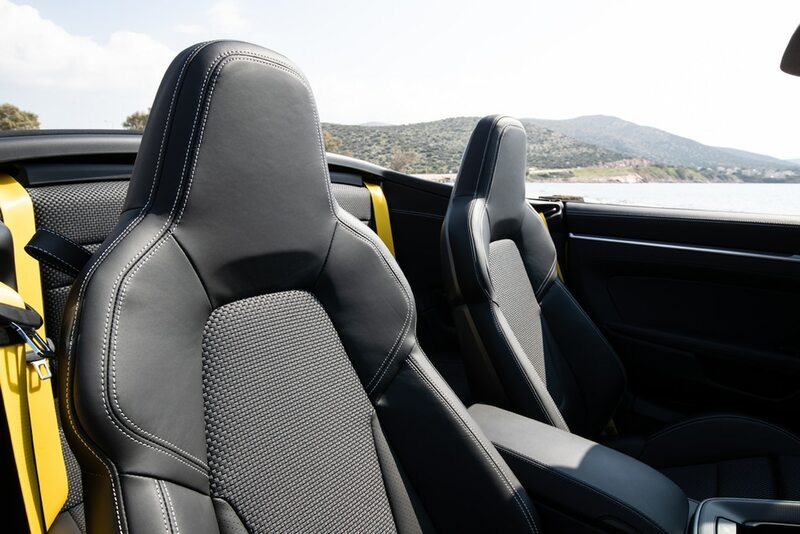 The best fitness routines involve periods of rest, and coastal towns in between the hills revealed the new Cabrio to be better than its predecessor in this respect, too, thanks to improved driver assist systems, including a lane keeping assist that manages not to pinball off the side-marker lines without strictly lane centering, either, as that might foul the natural on-center steering feel. 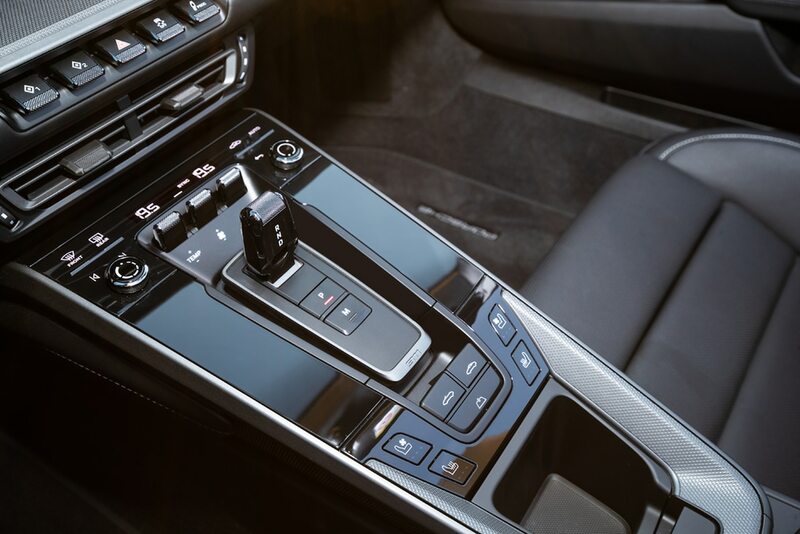 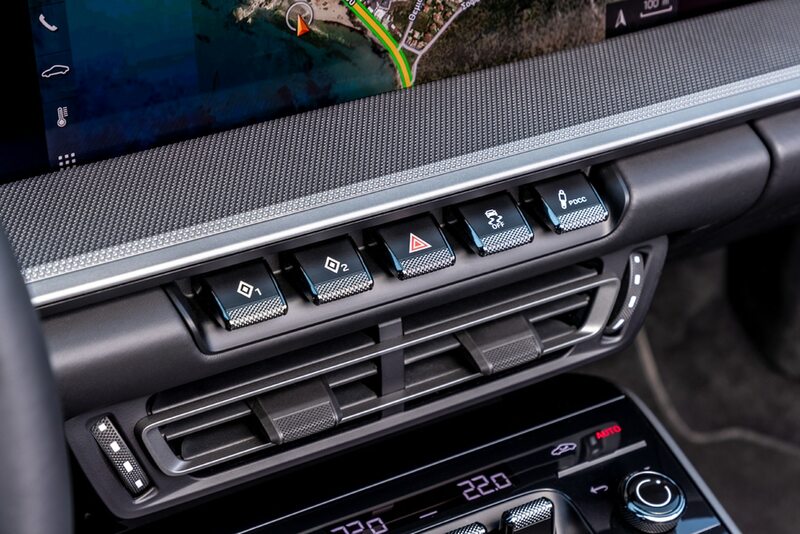 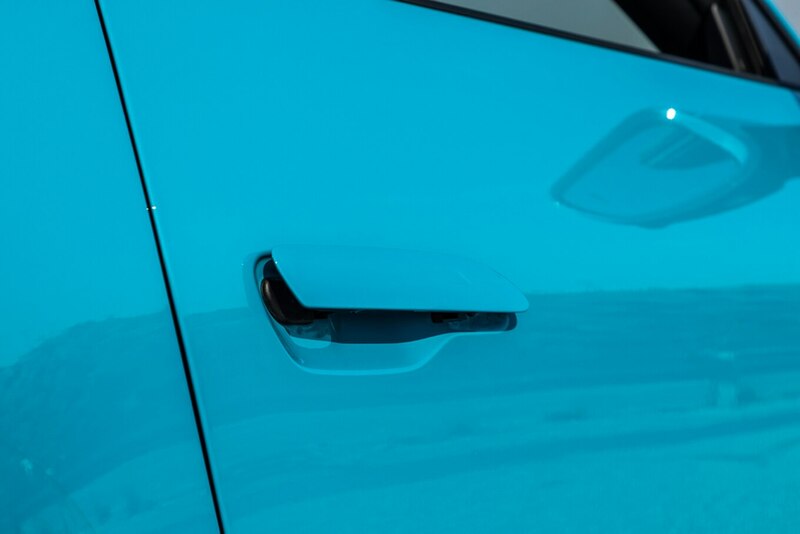 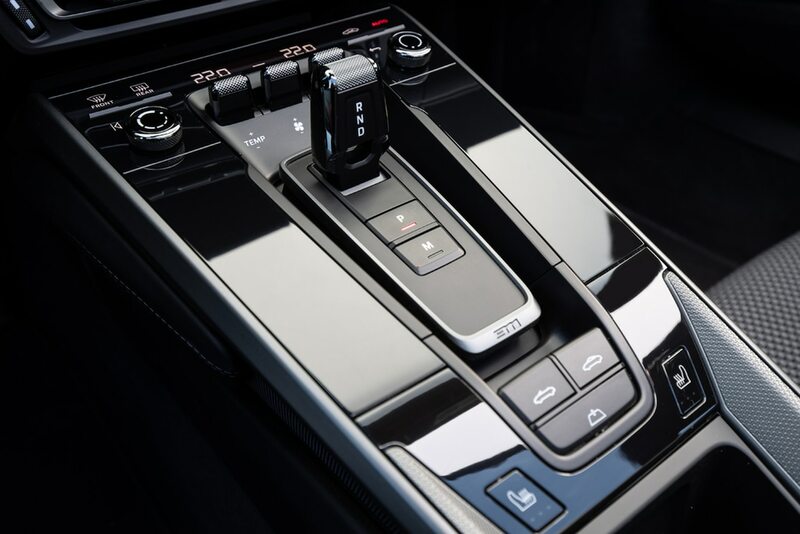 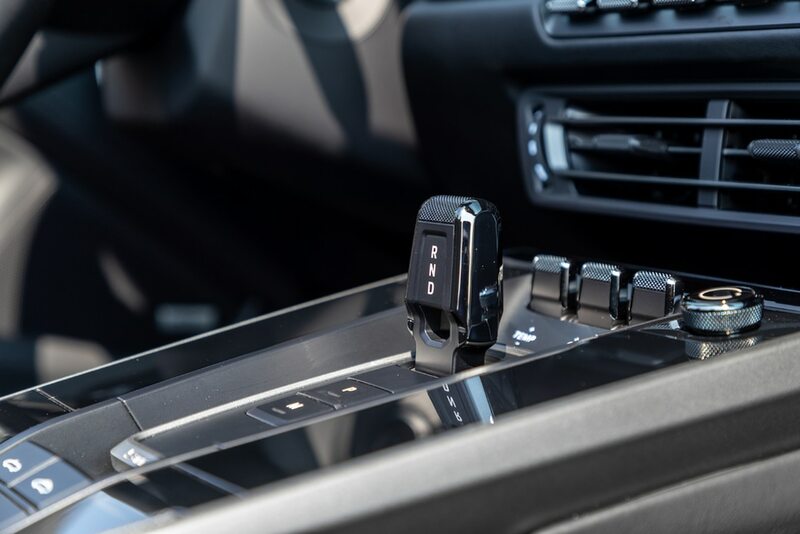 Adaptive cruise provides stop-and-go functionality, and when the car notices you’re squeezing through a tight space, it automatically calls up the surround-camera view. 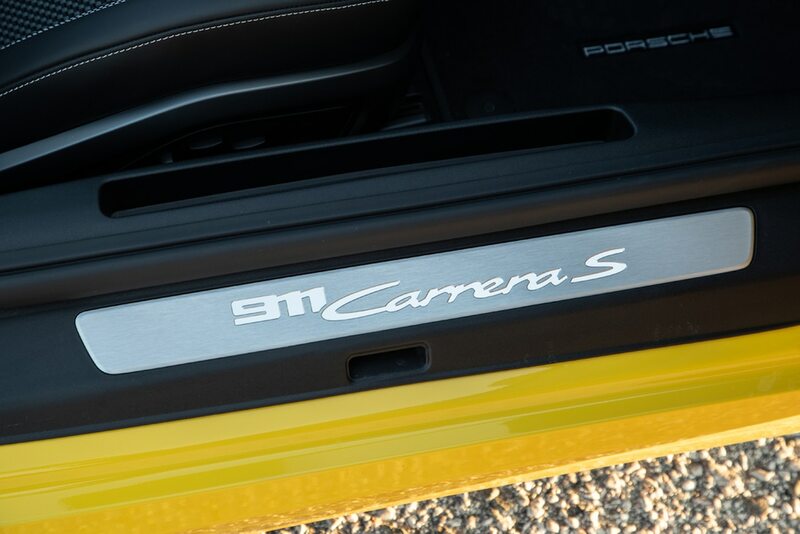 So solicitous. 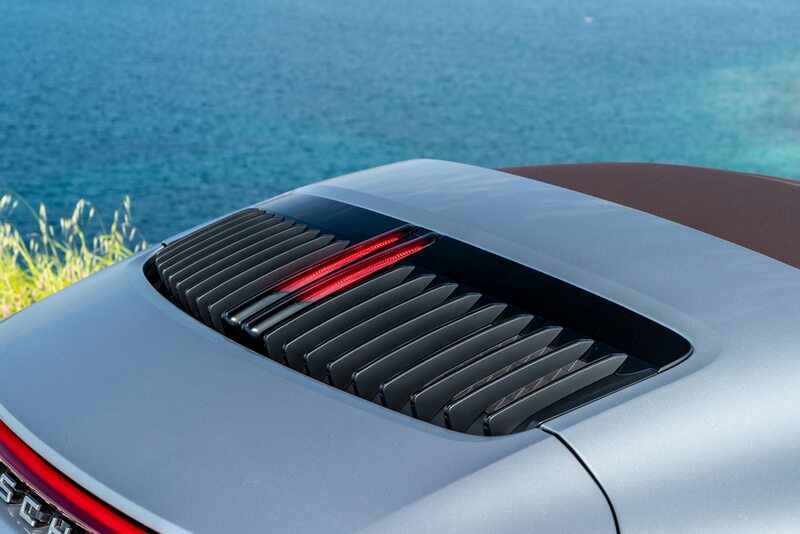 The optional 855-watt, 13-speaker Burmester sound system has soothing powers and offers impressive dynamic range, though the spatial imaging doesn’t seem as obvious as in other systems, and enough of the system’s brilliance gets lost with the top and windows down that if that’s to be your usual driving mode, you might as well save the $5,560 USD. 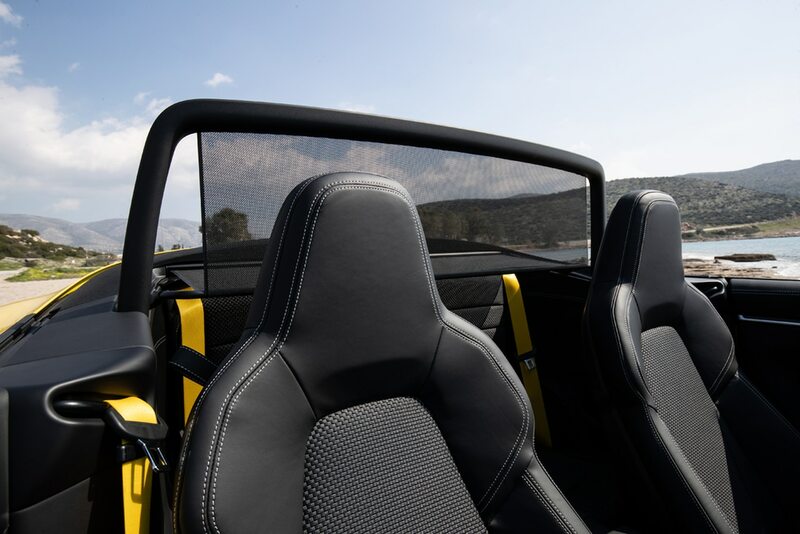 It still sounds pretty great with the windows and wind-blocker up. 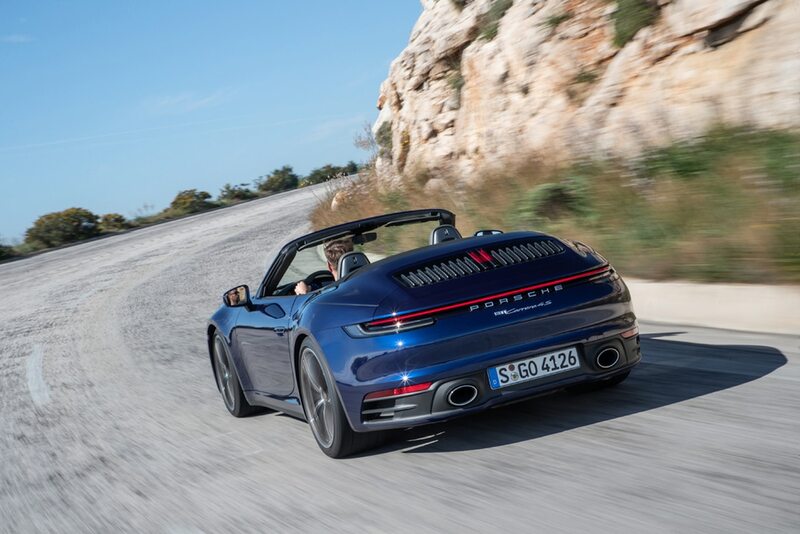 After lunch I strapped into a rear-drive S and was instantly aware of a much greater inclination to gently drift when launching from a stop into a right or left turn. 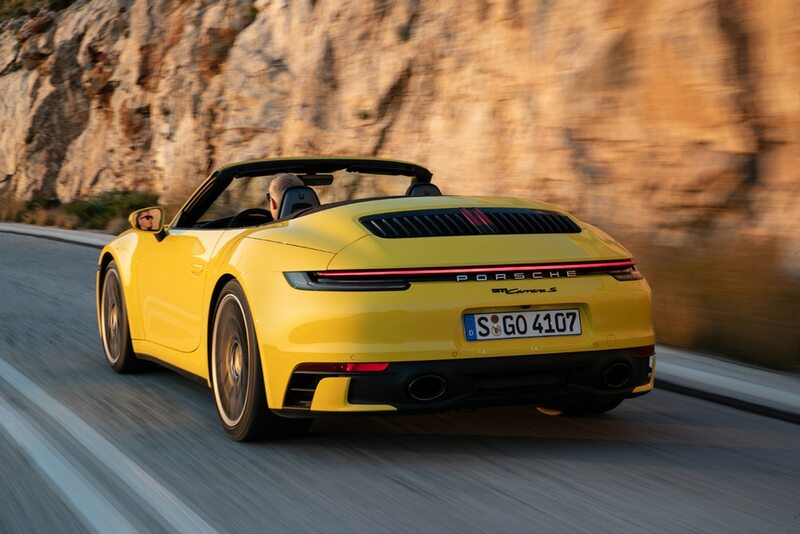 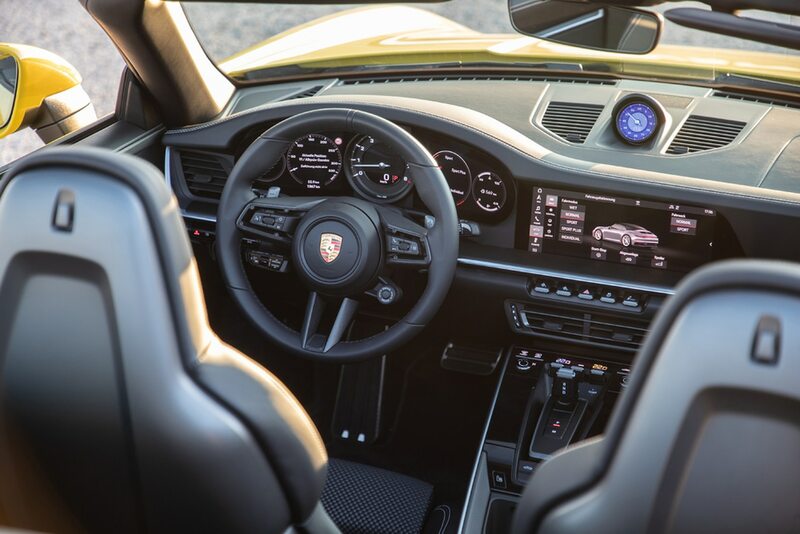 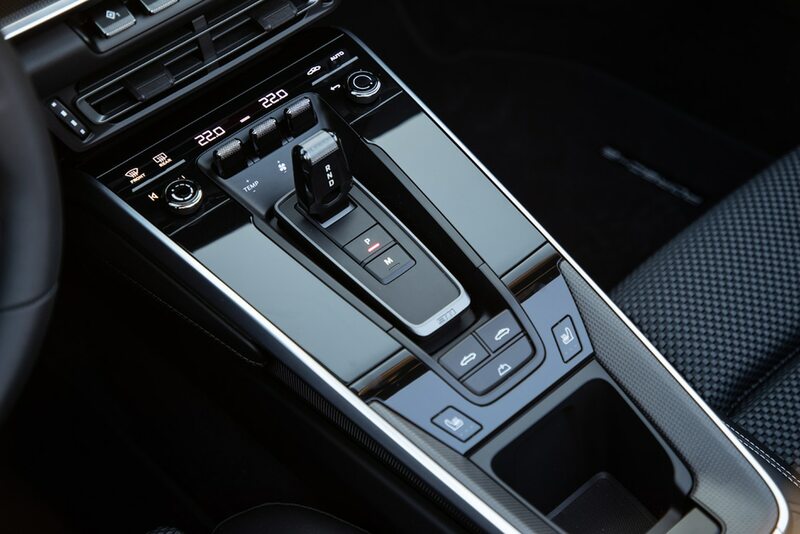 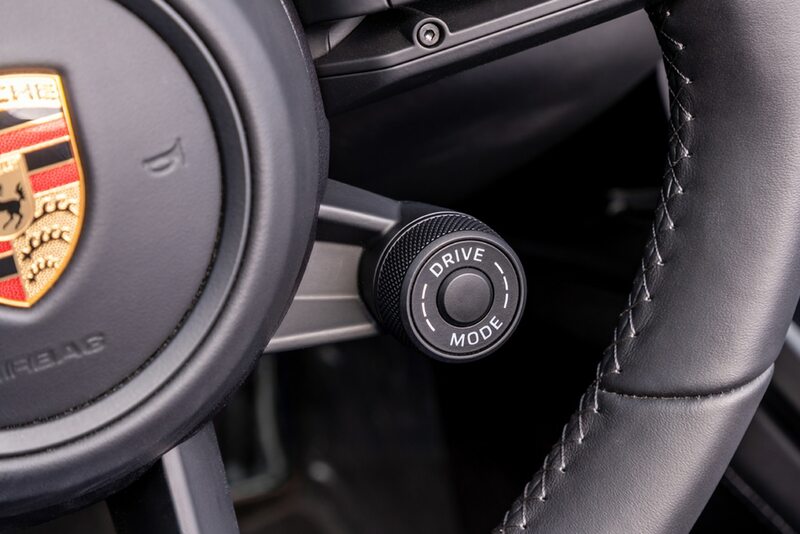 The stability control gets a pretty good workout much of the way through first gear, but at higher speeds wheelspin was much less evident (possibly thanks to unnoticeable electronic machinations of the $3,170 USD Porsche Dynamic Chassis Control and/or the $2,090 USD Rear Axle Steering).